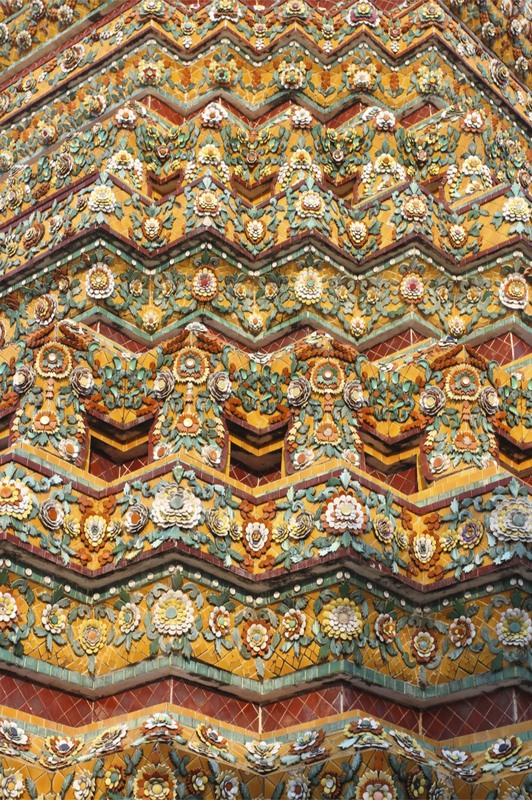 I’ve visited Bangkok a few times over the years, mainly for work but always trying to shoehorn in a day or two of free time to explore this fascinating and ever-changing city. 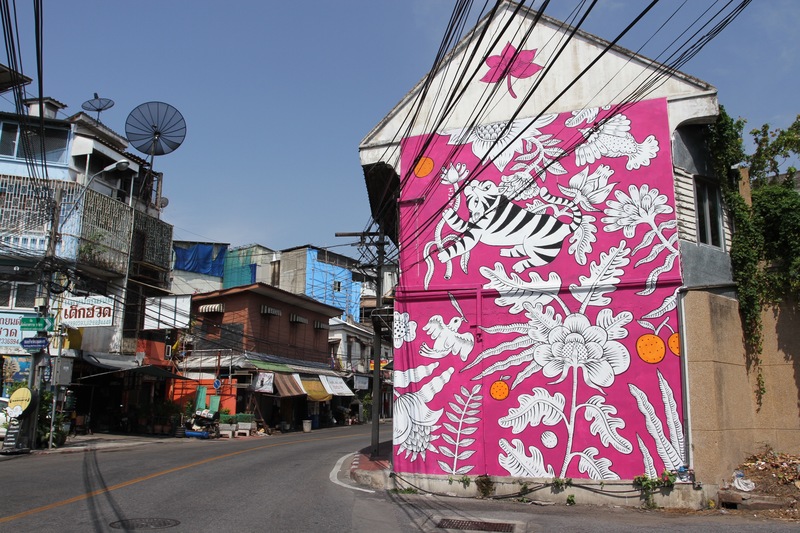 The life and vibrancy of Bangkok’s streets is almost hypnotic. Wherever you go, wherever you look, there is always something happening, always people and food and colour and noise and weirdness (see below). This time I only had two days, which was always going to be too little. 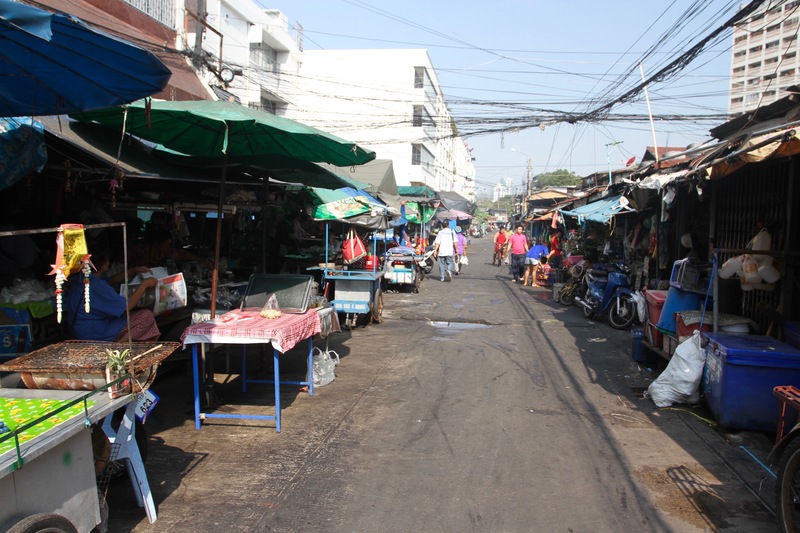 I squeezed in as much as I could in heat of 36ºC, but on my final afternoon I took it easy and set off for a leisurely stroll around where I was staying, close to the Rama VIII Bridge and a short walk to the Khao San area. 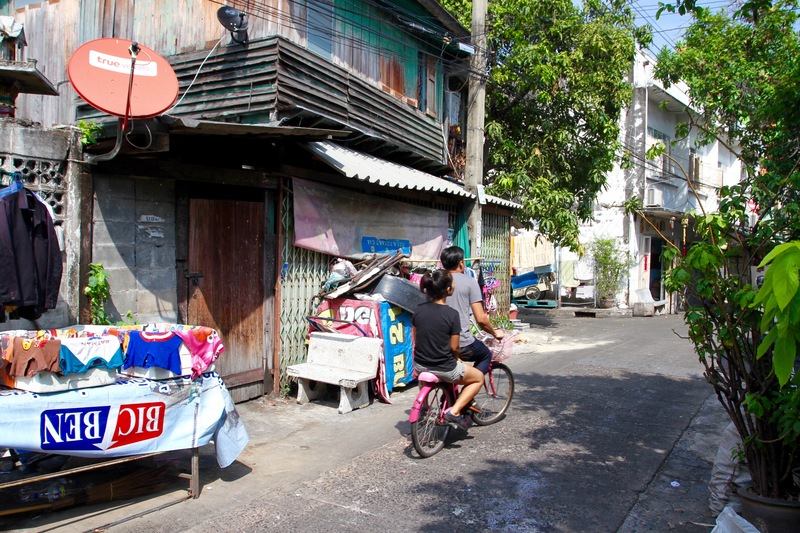 Khao San is known as the fleapit backpacker ghetto portrayed in the film, The Beach. 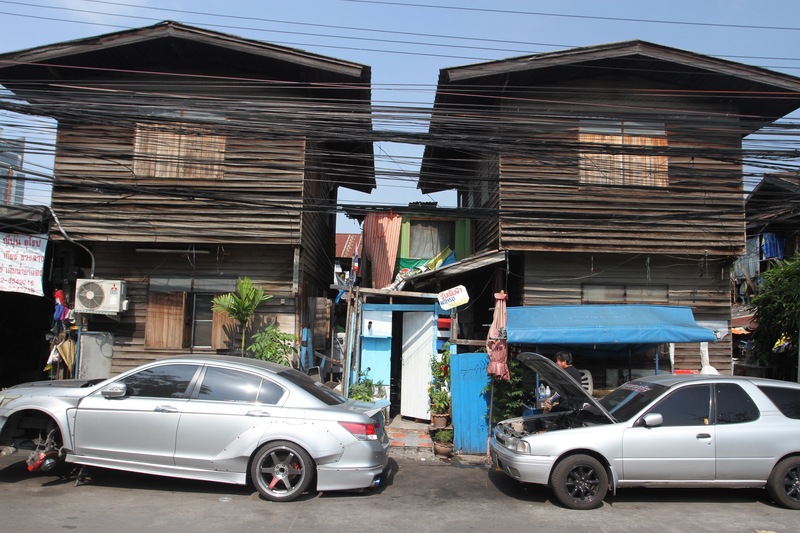 It still has elements of that world, but the majority of the area has been ‘gentrified’ and now blends (not always seamlessly) everyday Thai life with some upscale traveller facilities. 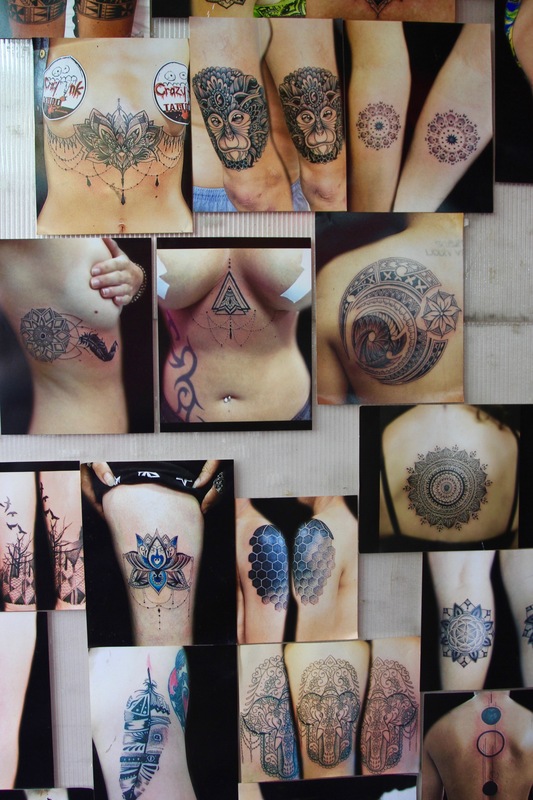 You can still get drunk and have an ill-advised tattoo on the Khao San Road, but you can also stay in a boutique hotel with a rooftop pool. 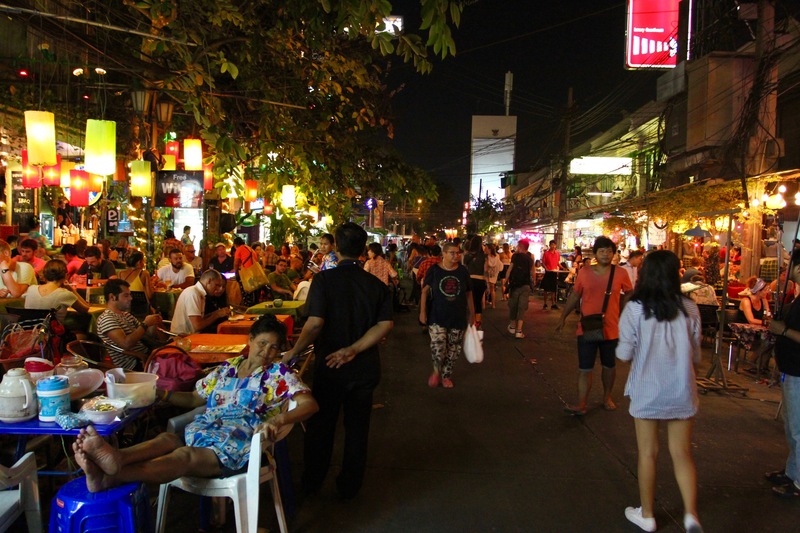 Away from the seedy Khao San Road, the back streets and alleyways of this area are full of Thai homes and businesses, but also numerous good restaurants, cafes and bars. 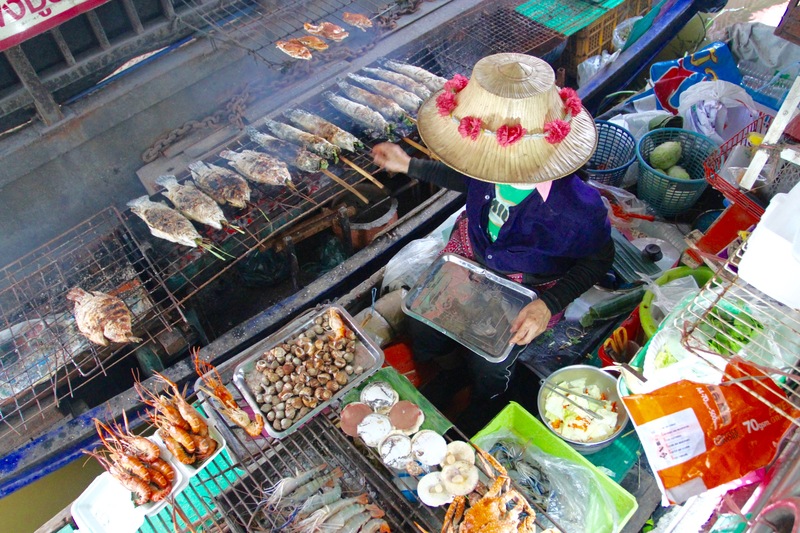 It’s easy to see why travellers, whether backpackers or suitcase pullers, flock to the area. 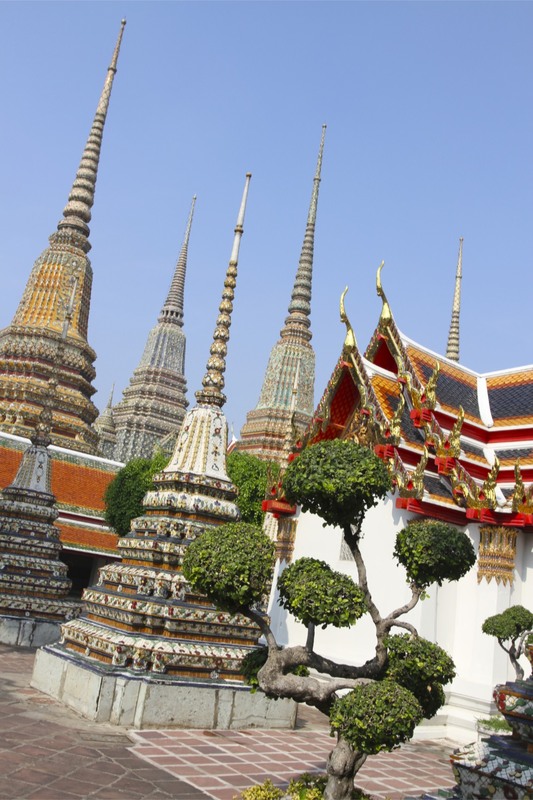 Bangkok’s the most visited city on the planet, but it’s impossible to put your finger on the thing that makes it so attractive to people. 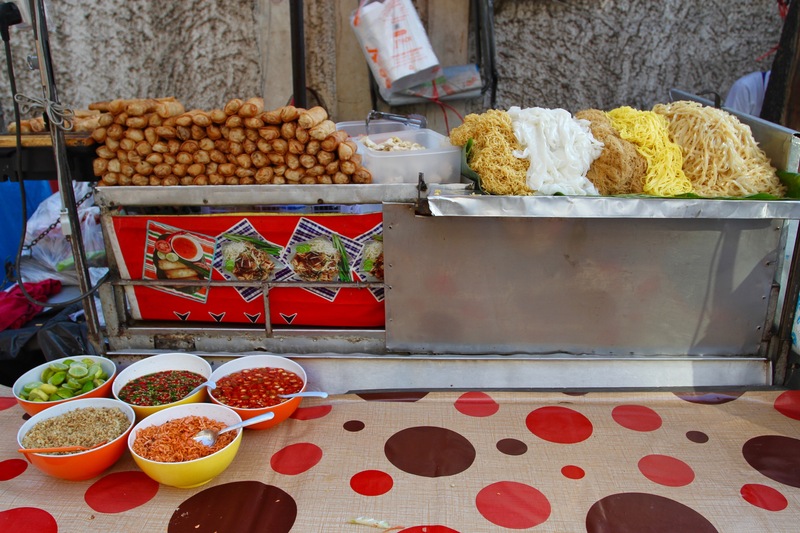 The friendliness of its people (and for a big city, people are remarkably friendly), the food, the culture, the history, the life lived large on the streets…all are remarkable, all are reasons to visit and revisit. Not that anyone should underplay the negatives. 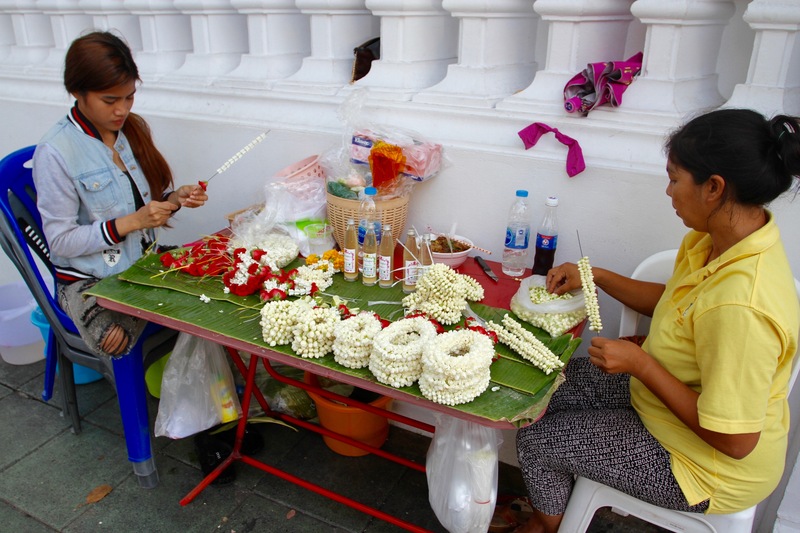 Thailand might be the Land of Smiles, but there are plenty of things to make you frown. Air pollution you can cut with a knife (it’s not Beijing, but it’s pretty awful); road traffic that could infuriate the Buddha himself; tuk-tuk drivers who could drive you to kill (a tuk-tuk driver); litter everywhere … not forgetting the fact that the country is run by a military dictatorship. 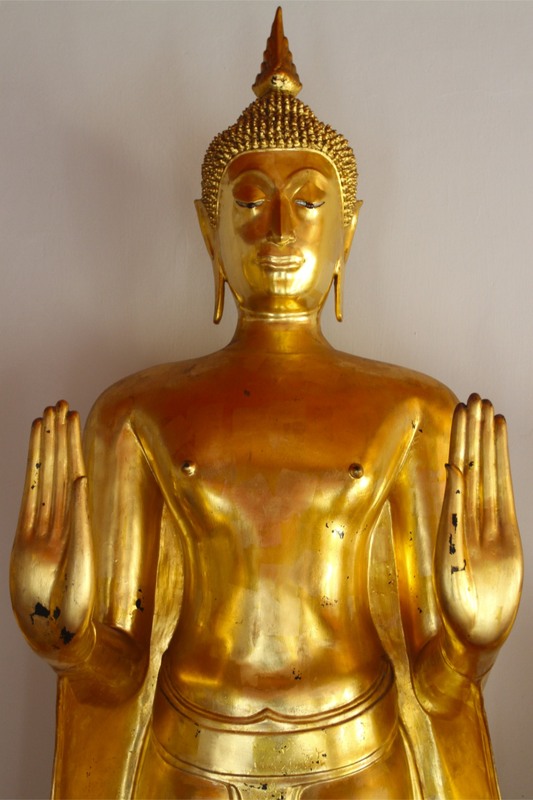 Buddhism seems like such a peaceful ‘religion’*. Yet, like all institutions with vested interests, it has the capacity for violent factionalism, meddling in politics and generating vast amounts of money that might better be spent on helping the needy and marginalised. 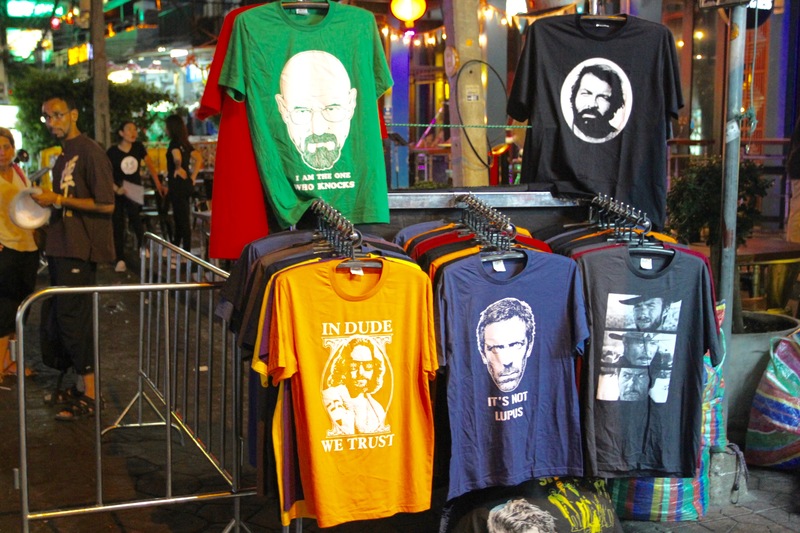 So it is in Thailand. 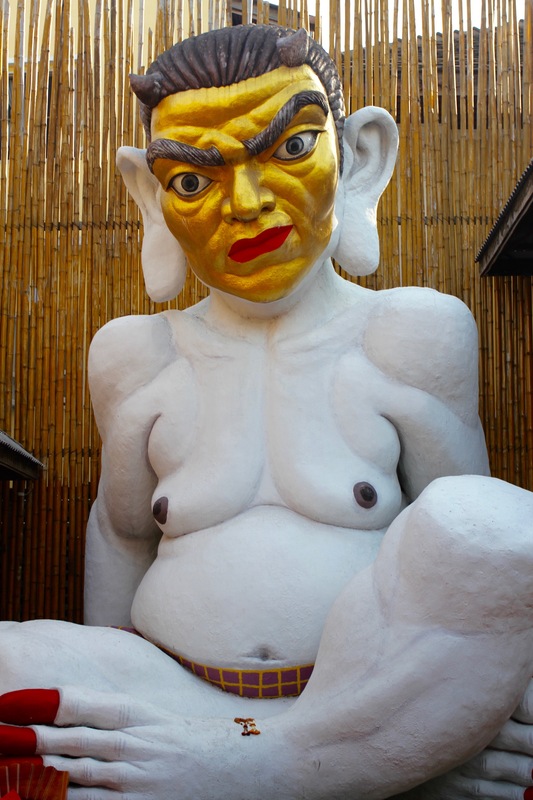 As a tourist you wouldn’t notice, but a dispute rages within Thai Buddhism. 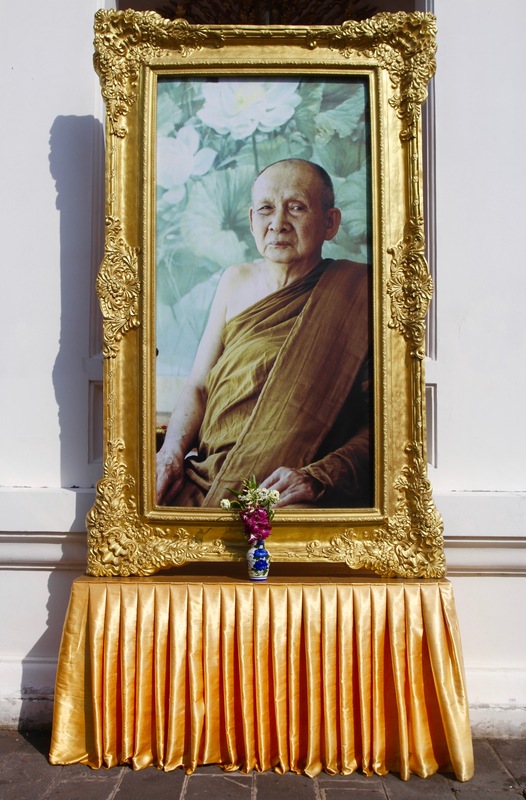 At the heart of this struggle, an insurgent Buddhist sect is taking on a conservative establishment strongly aligned with both the monarchy and military junta that runs the country. 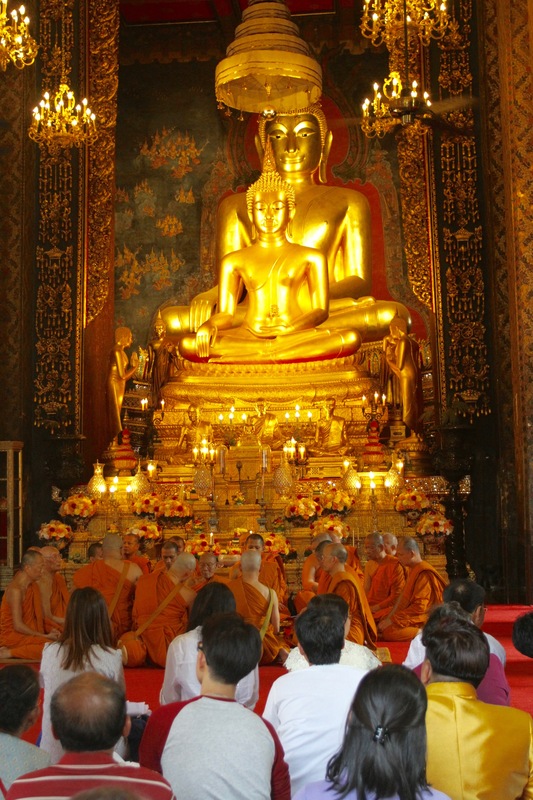 The dispute centres around the appointment of a new spiritual leader for Thai Buddhism, the Supreme Patriarch. 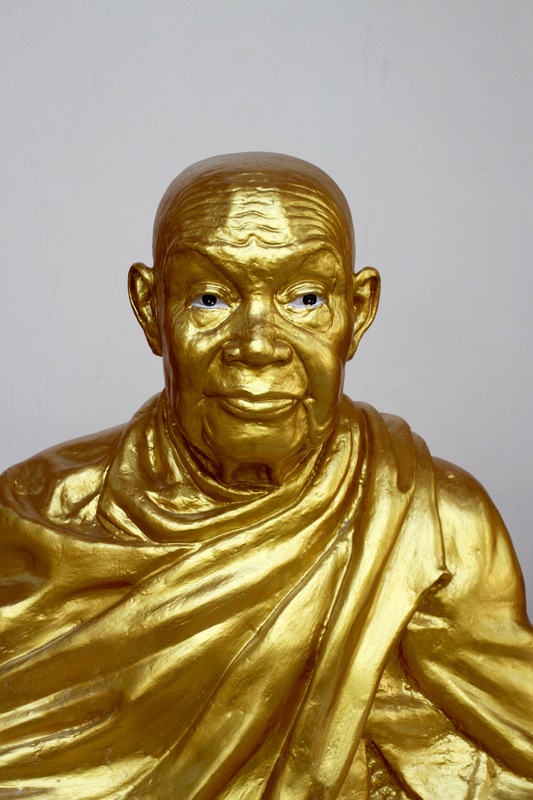 Thais haven’t had a spiritual leader since 2013 and, as the dispute gets more political, the position continues to remain empty. 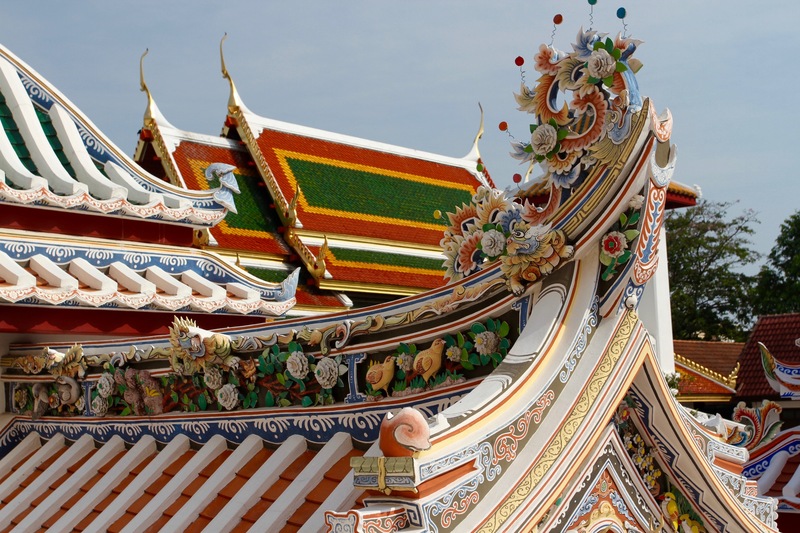 These frictions aside, the many Buddhist temples that are scattered around the Thai capital provide a peaceful alternative to life on Bangkok’s hectic streets. 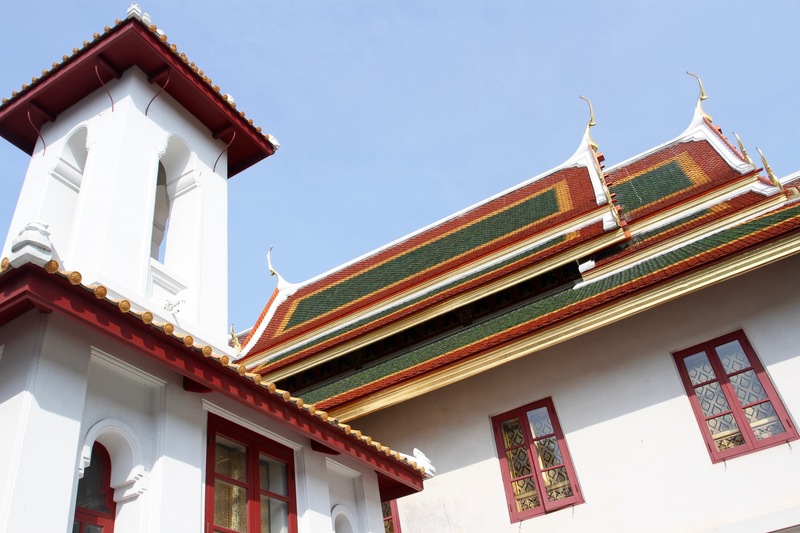 A little like being in Rome, it’s practically impossible to walk far without bumping into a temple or monastery, the radiant colours of the buildings sparkling under the intense sun. 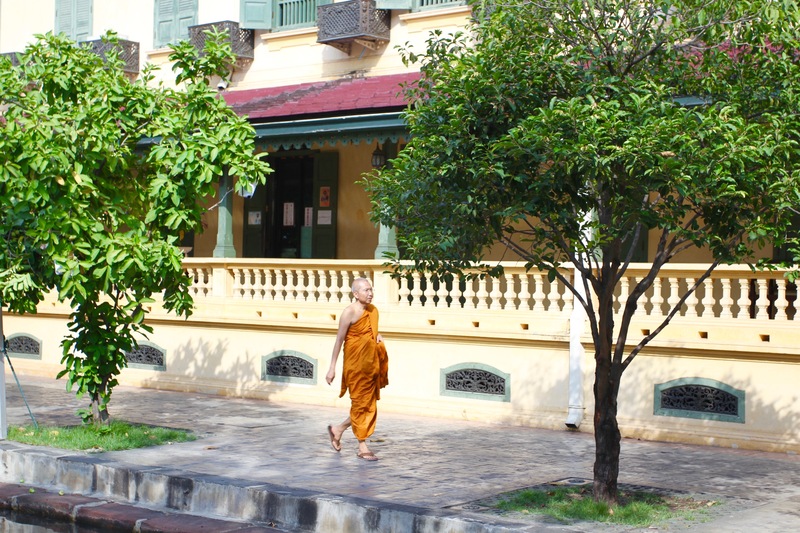 It’s not unusual to see orange robed monks on the streets. 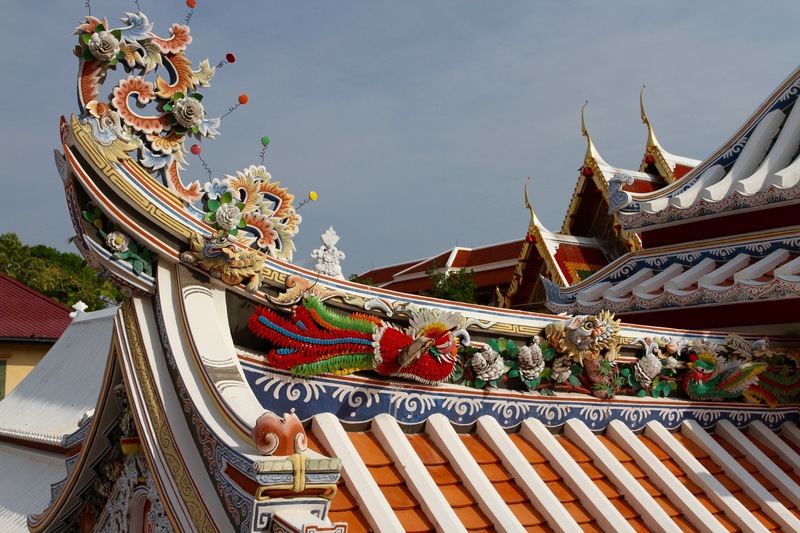 There are over four hundred wats, or temples, in Bangkok, but you can add to that number many more shrines that are everywhere around the city. 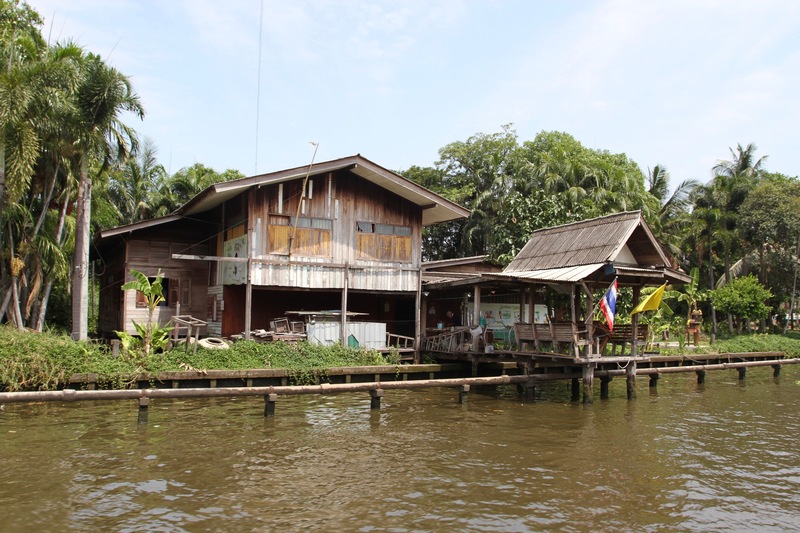 Some of the wats are massive complexes, frequently swamped by tourists, others are small and far from the tourist trail. 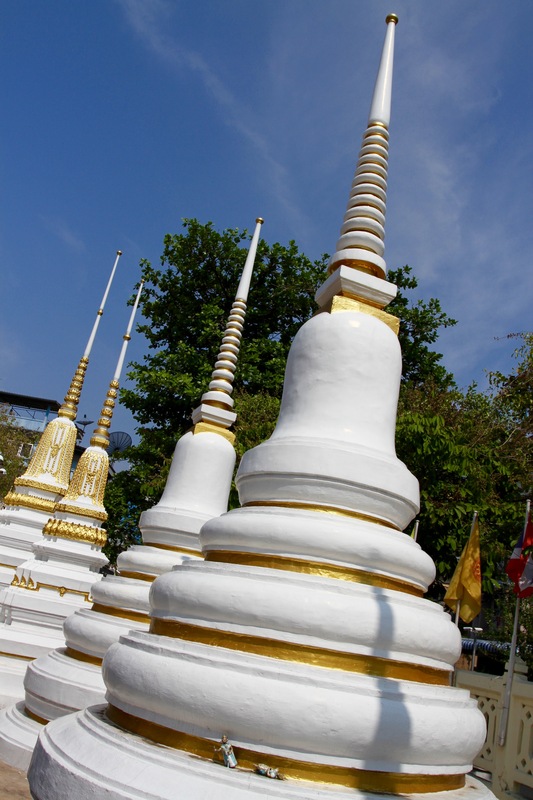 Finding myself in the Phra Nakhon District of central Bangkok it was hard to miss Wat Bowonniwet Vihara Rajavaravihara. 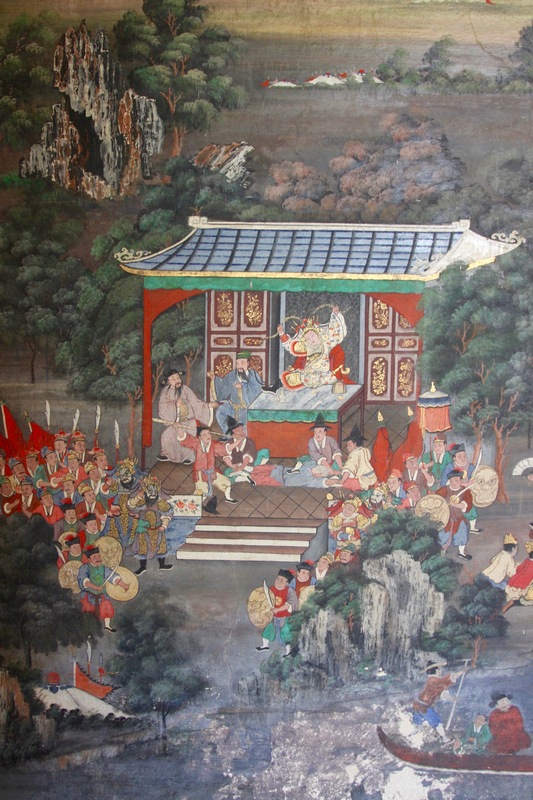 This is a major Buddhist temple with plenty of royal connections and a steady stream of worshipers coming and going. 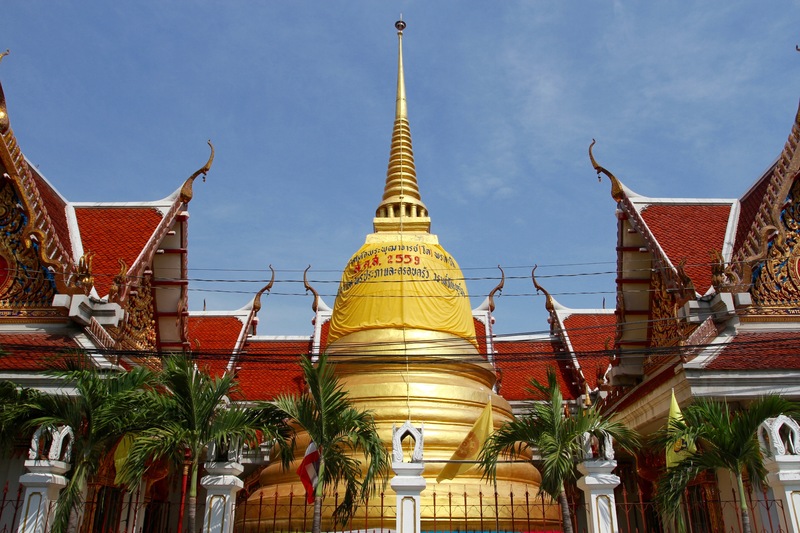 Numerous princes have studied at this temple, including King Bhumibol Adulyadej, or Rama IX as the current Thai monarch is known. 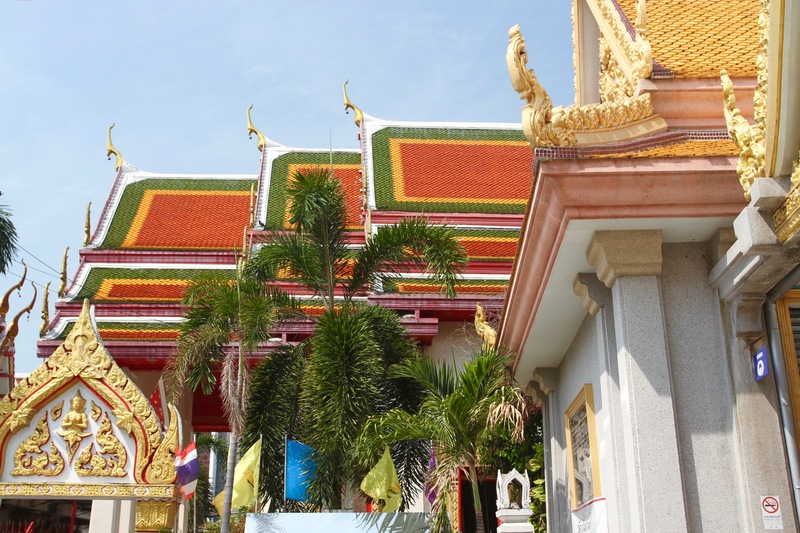 Given the reverence that the majority of Thais have for their king, it’s no surprise that this is a popular temple. 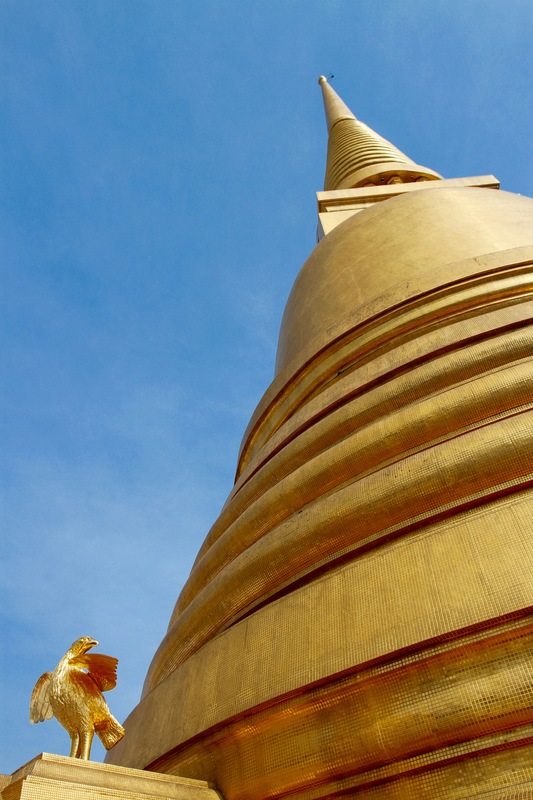 The most striking feature from outside the temple is the large golden chedi or stupa that majestically rises into the sky; inside, the ornate decoration of the temple is equally impressive. 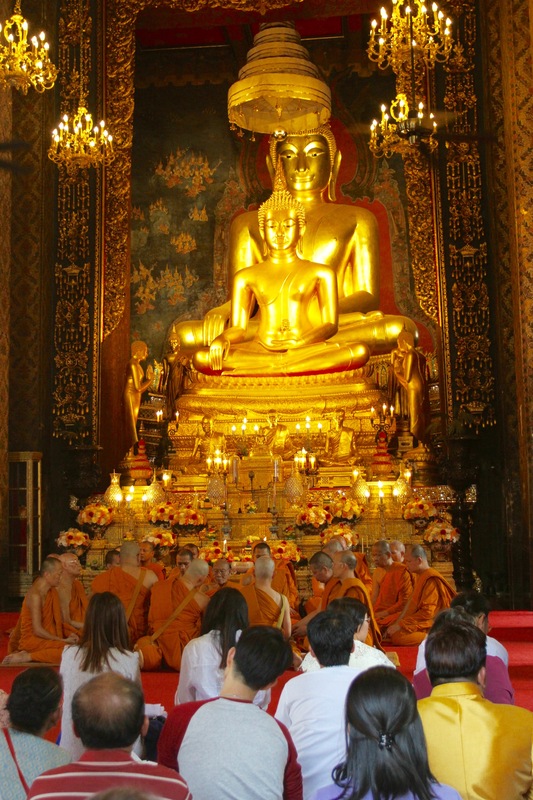 In one temple monks were praying in front of a large Buddha statue. 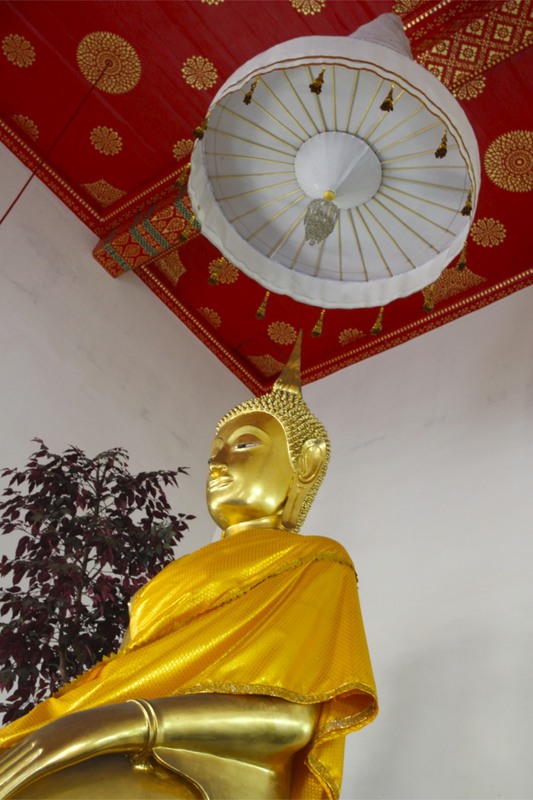 Not that visiting a Buddhist temple is all spirituality, it’s also fraught with danger. 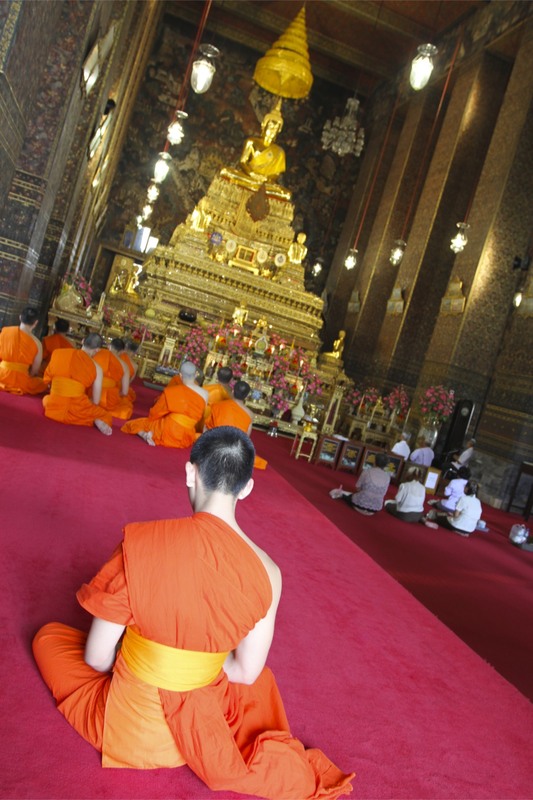 As with many places of worship, you’re required to remove your shoes when entering certain parts of the temple complex. 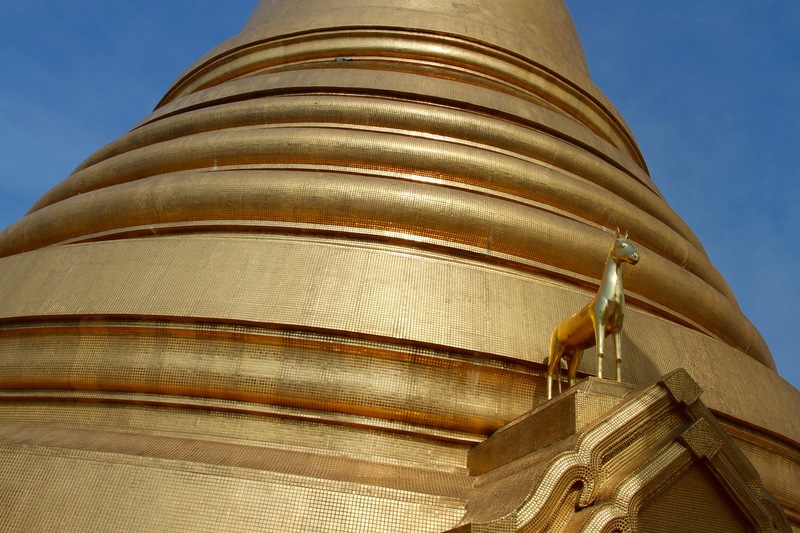 When I got to the main stupa I had to remove my flip flops before ascending some steps into a courtyard. The floor of the courtyard had been exposed to an intense sun for several hours, and the bare stone floor felt hot enough to fry an egg on. I swear I got third-degree burns on the soles of my feet. 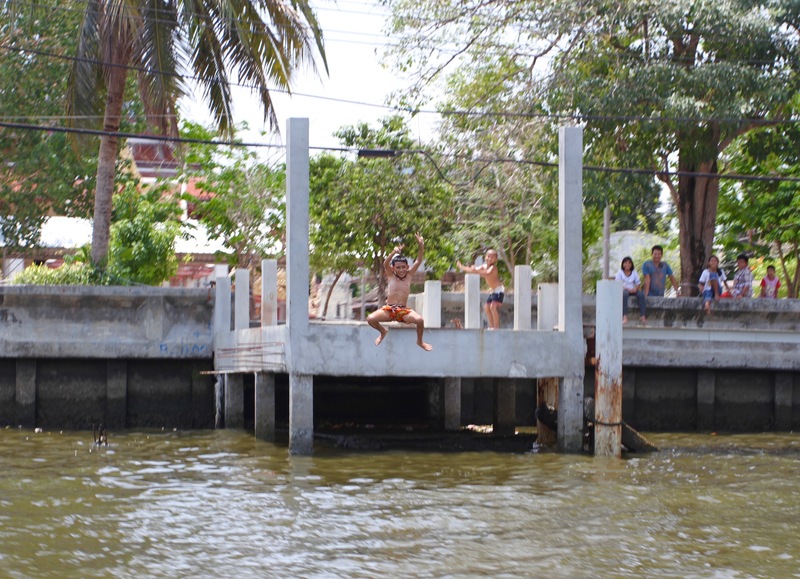 At least the sight of me running from one patch of shade to another gave a couple of Thai families some amusement. For safety reasons, I stuck to shaded areas after this painful experience, and visited several buildings where there were glorious paintings on the walls. 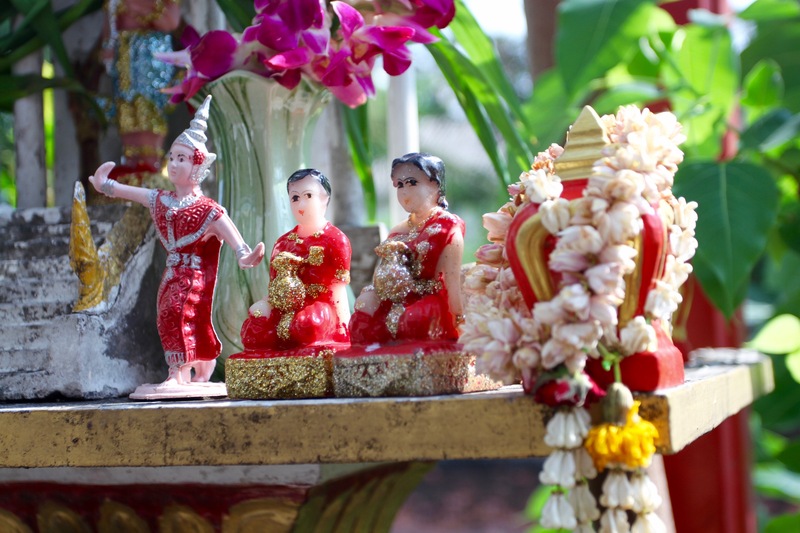 These are common in Buddhist temples everywhere in the world, and depict instructional scenes from the Buddha’s life, as well as scenes of Thai daily life. 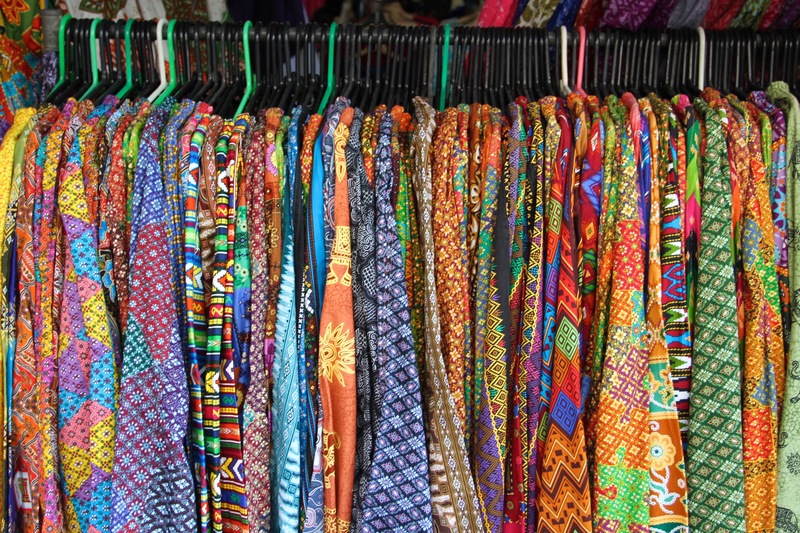 They are very colourful and rather beautiful. 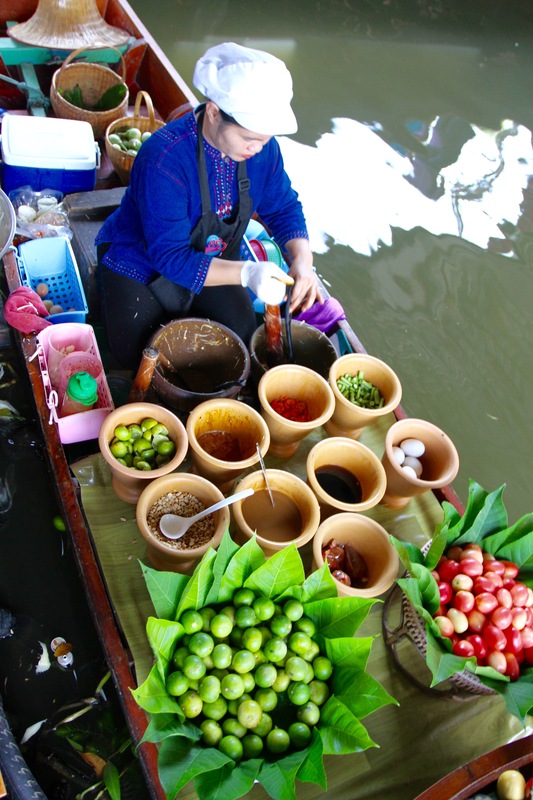 Bangkok is famous for its floating markets. 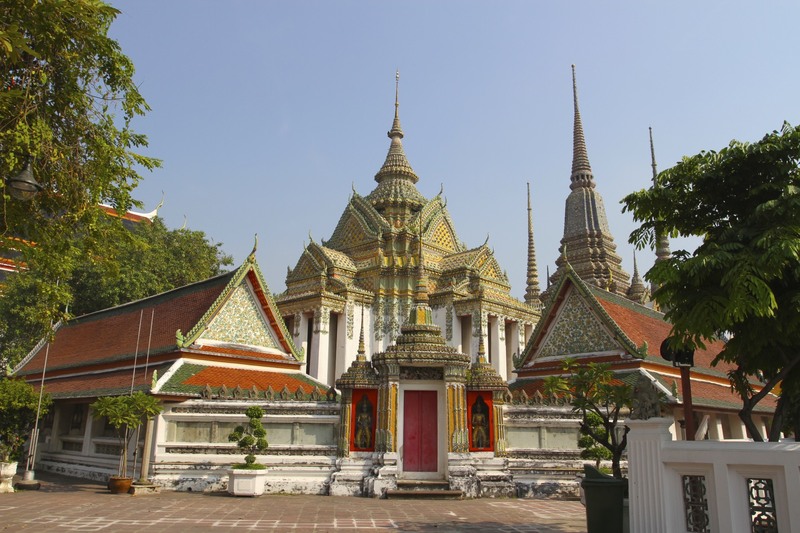 Read any guidebook and they’ll tell you that a visit to one is a quintessential Bangkok experience not to be missed. That alone guarantees that when you visit you’ll be sharing the experience with plenty of other tourists. 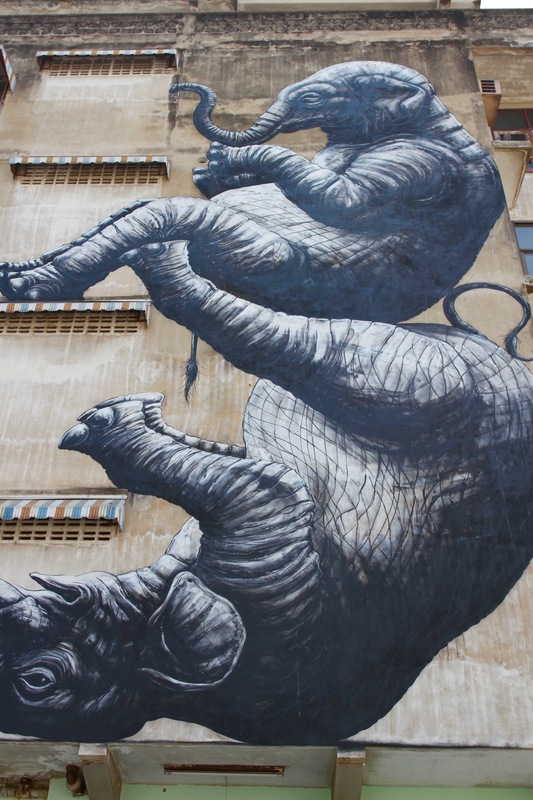 I read a few travel articles and the big question seemed to be which market, of the many possibles, should I visit? Logistics helped solve this question. 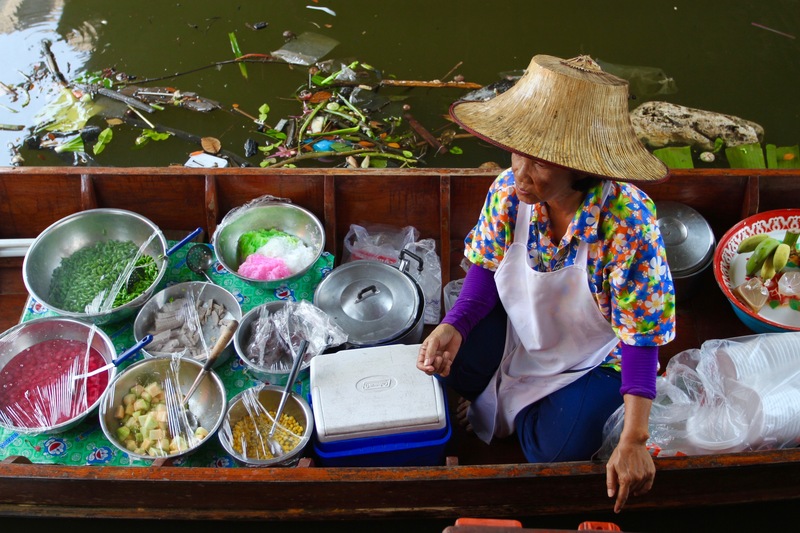 Many of the more interesting sounding floating markets were quite a long way outside of Bangkok, and with limited time I needed somewhere accessible. 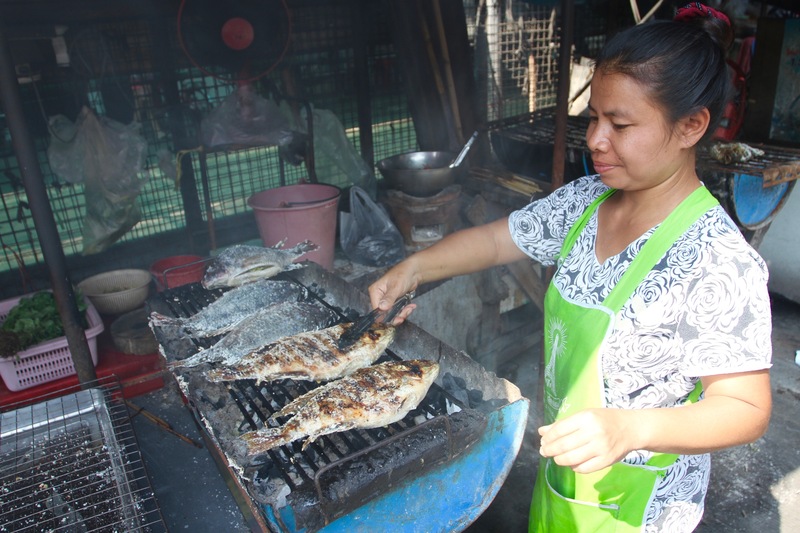 Talin Chan market is handily located in Thonburi, an ancient district criss-crossed by canals that can be visited as part of a boat trip around the area, and is only a few kilometres from the centre of Bangkok. 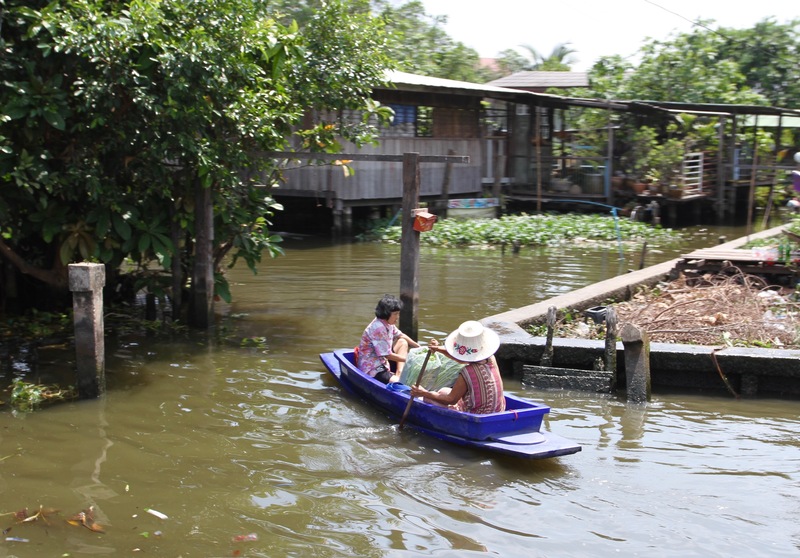 It’s more fun to reach Talin Chan by boat, but it can also be reached by road. 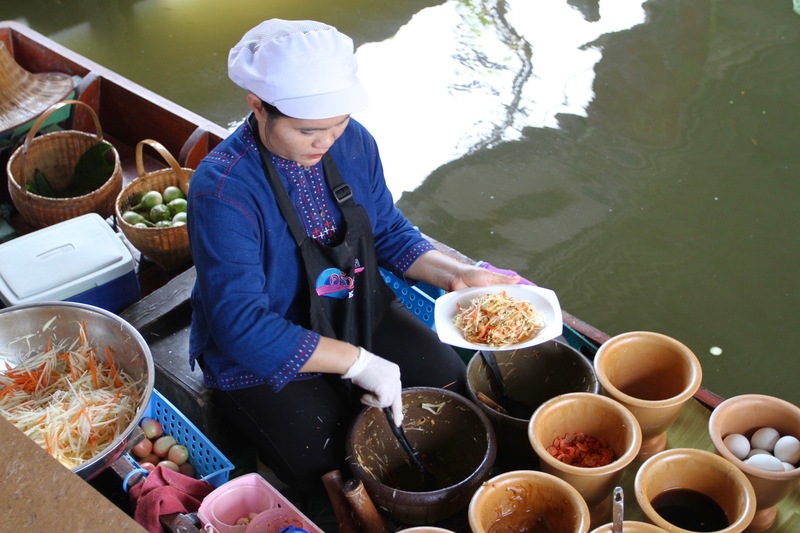 The food market here isn’t the typical fresh produce market that you get elsewhere; instead Talin Chan specialises in floating kitchens, where you can have food cooked to order by a chef bobbing around in a wooden canoe. 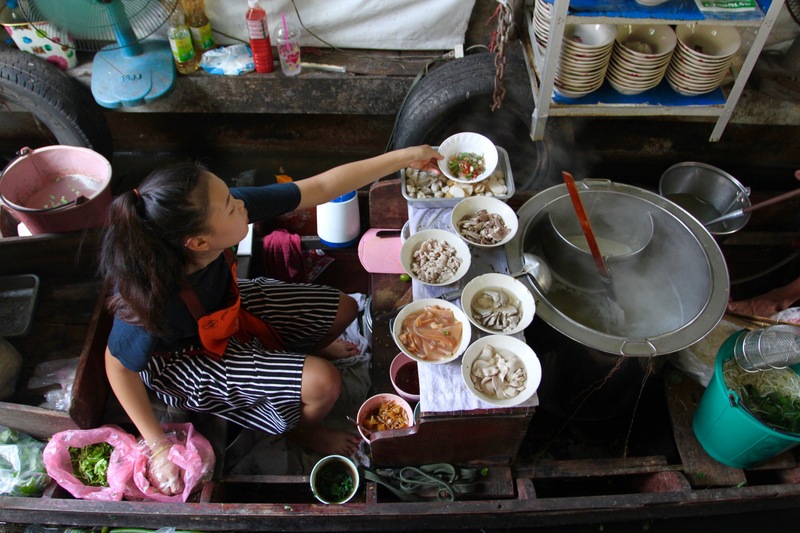 There are pontoons with tables and chairs where you can relax while eating noodles or rice with fish, crab, prawns or pork. 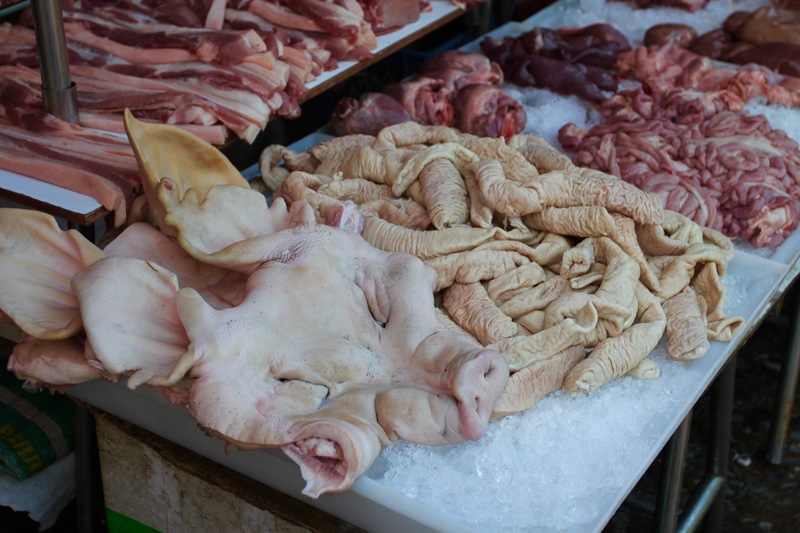 It’s a small market – don’t expect to be wandering around for hours – but less touristy than I’d expected. Mostly there seemed to be more Thais than non-Thais and, because it was the weekend, everyone seemed to be having family lunches. The boat I’d arrived on parked up and I had an hour to explore, eat and drink. An hour was easily enough time. 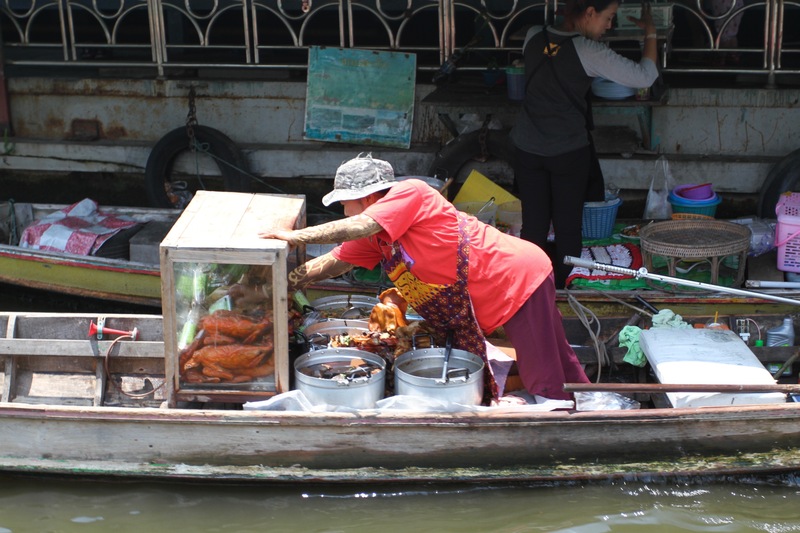 I strolled amongst the boats, amazed yet again by the sheer variety of foodstuffs on offer in Thailand, checking out which of the floating kitchens looked good for lunch. Top tip, they all look good and do similar meals. 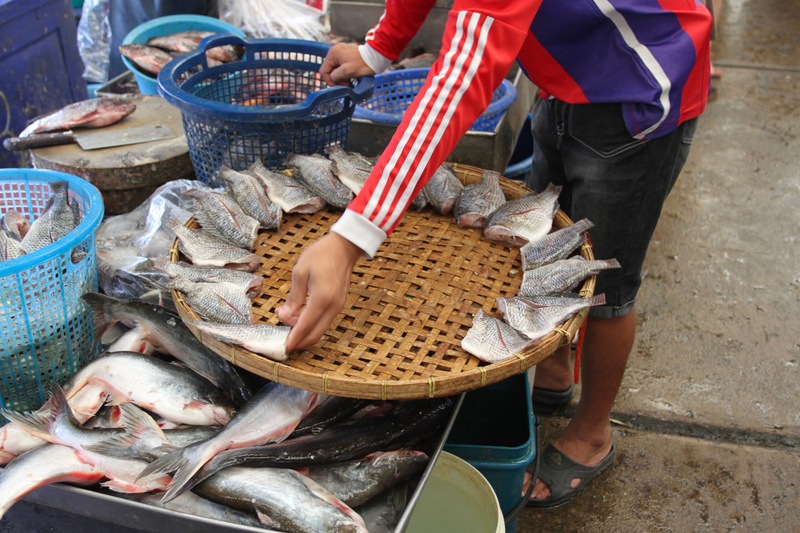 I passed a young boy drumming up a frenzy of fish as he tossed stale bread into the water. 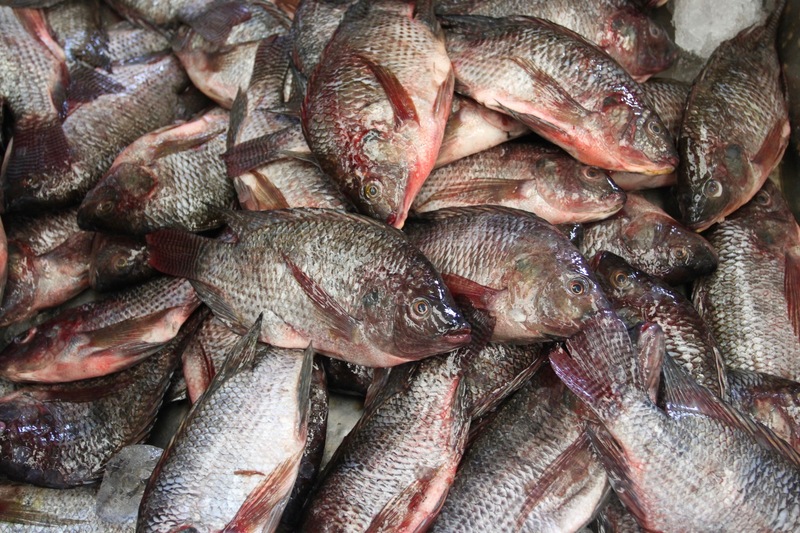 I couldn’t help but wonder if these same fish would be grilled and served up one day soon. 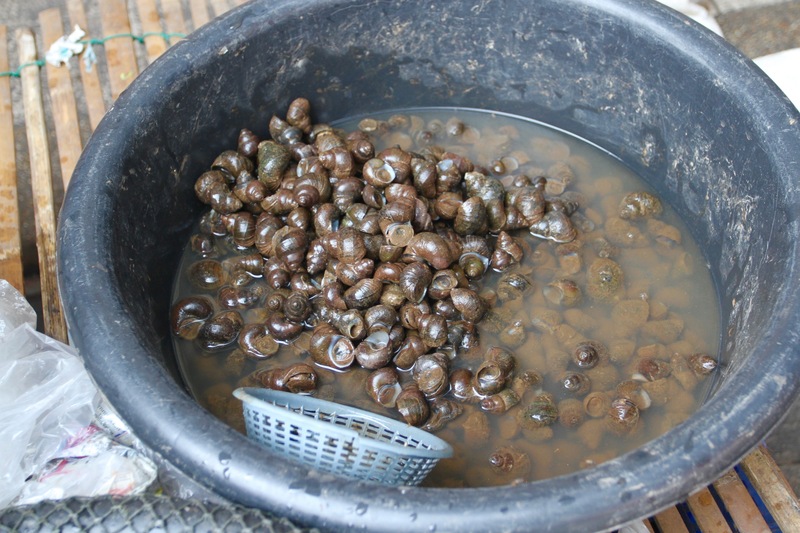 I had a walk around and discovered a land-based market behind the floating market. 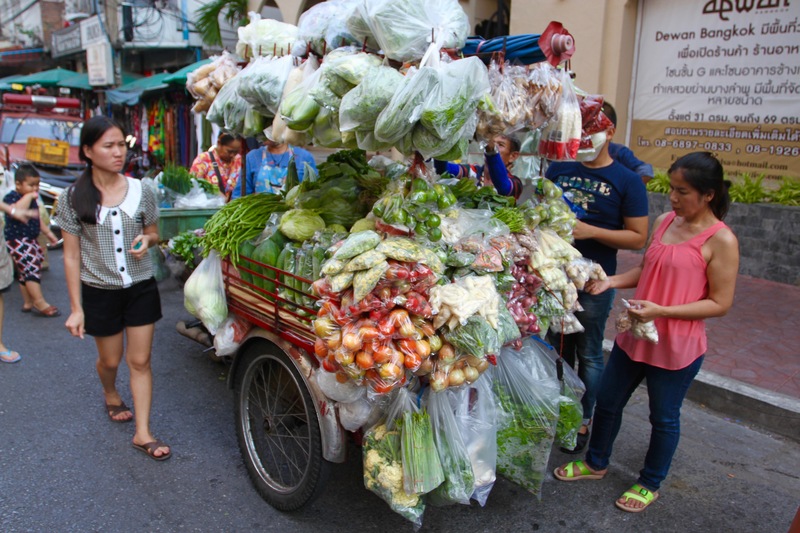 There wasn’t much to see – more food stalls – so headed back in search of lunch. A tasty pad thai washed down with a beer and (to my shame) two portions of mango sticky rice later, and it was time to clamber back on the boat and head off into Thonburi’s canals again. 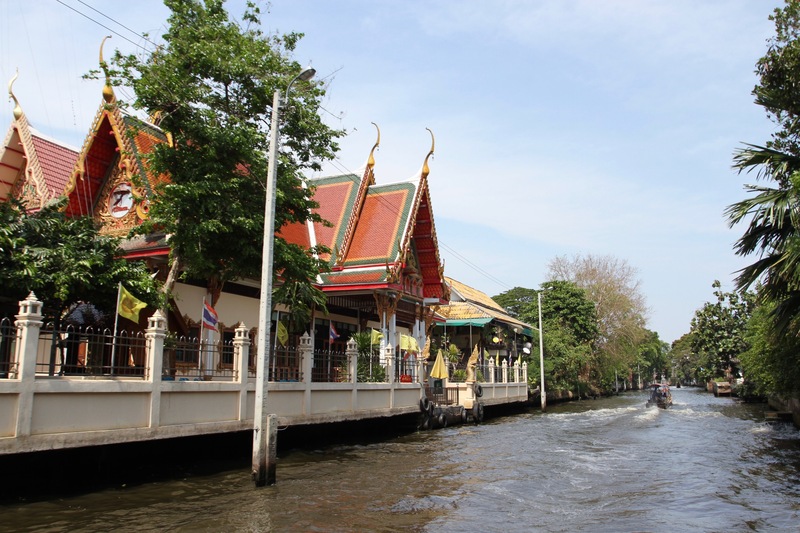 It was Salvatore Besso, in the early 20th century, who wrote of Bangkok as the “Venice of the Far East, the capital still wrapped in mystery, in spite of the thousand efforts of modernism amidst its maze of canals”. 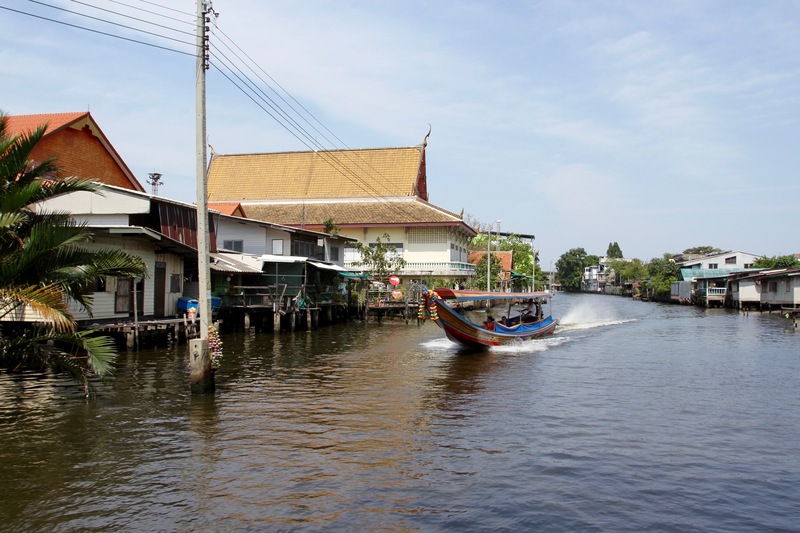 The city’s large network of canals presumably reminded the Italian of home, and his remark has gone on to become one of the enduring cliches of the Thai capital. 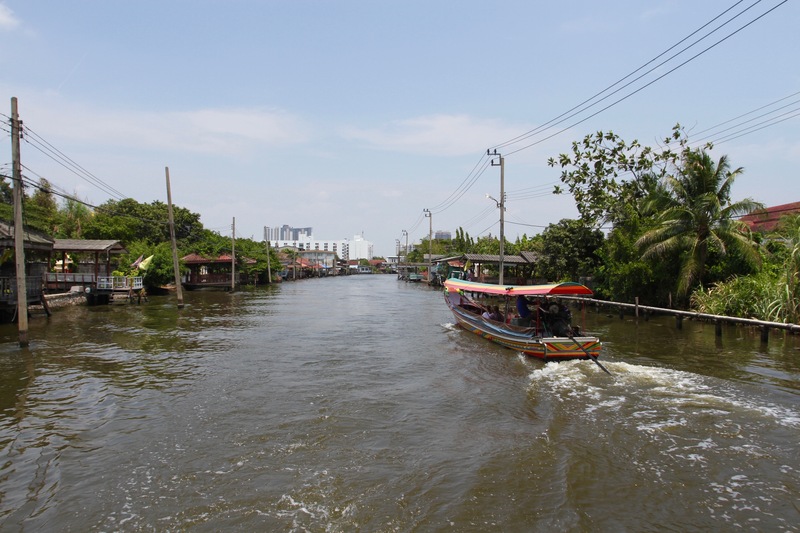 Today, many of Bangkok’s canals have been abandoned, built over and filled in, but there remains a significant network of waterways that are still used for transport and commerce. 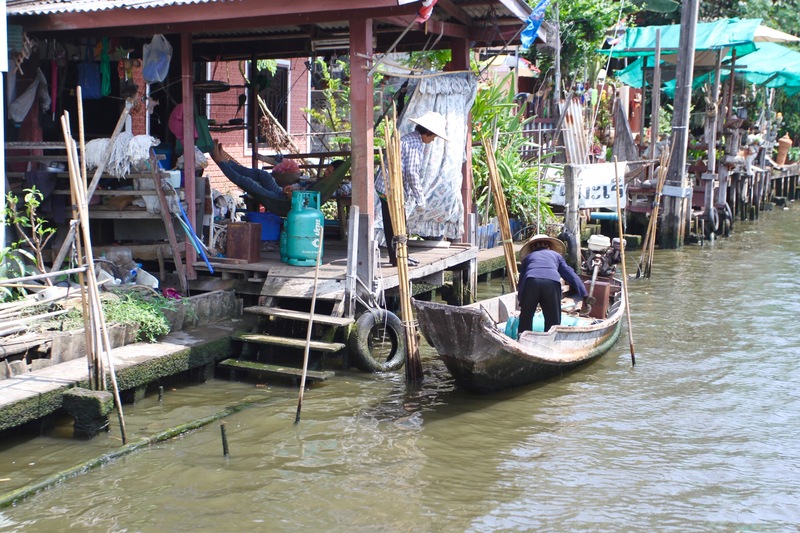 As Bangkok’s roads have become ever more crowded, canals have become vital transport routes for desperate commuters. 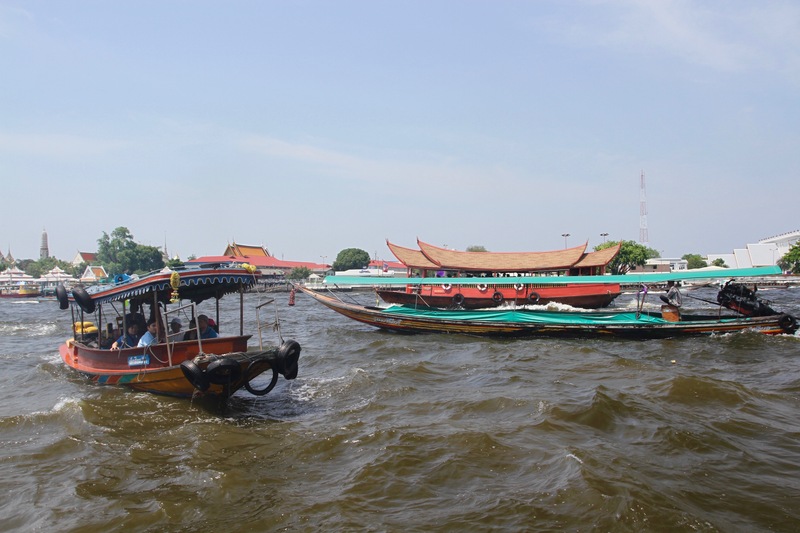 A journey along them is a little like stepping back in time, even if the boats all have engines these days. I went to the Tha Chang river taxi terminal, one of many places where it’s possible to hire a Longtail boat, the ones that have an extended propellor sticking out of the back. I asked around and found a boat operator who said he’d be sailing in 20 minutes, once a couple of other people had arrived. An hour later I was still waiting. Eventually they decided to set off with me as the only passenger. It turned out that I wasn’t alone on the boat, the captain’s wife and young child would be my companions for the journey. Despite the challenges of communication, we had a lot of sign language conversations and, after buying drinks for everyone from a man in a canoe, we were firm friends. 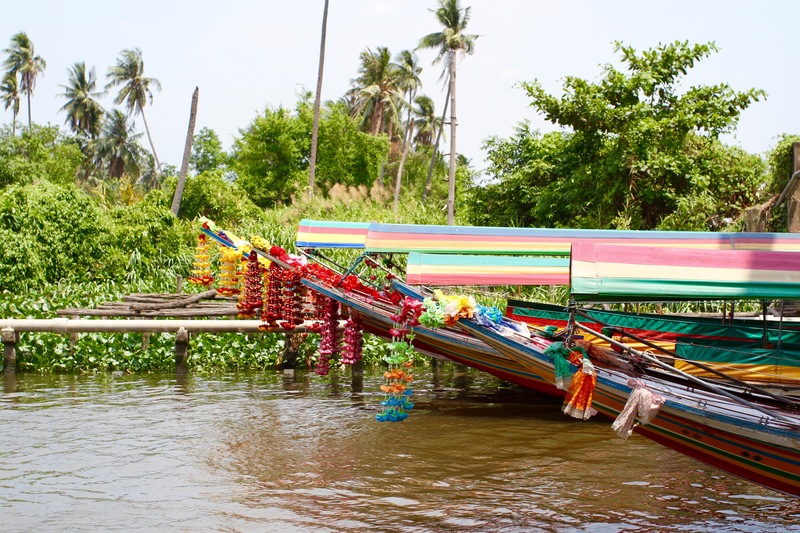 At first I was a little disappointed that the boat wasn’t one of the iconic Longtail boats that seem to gracefully skim over the water at high speed. Our boat travelled far more sedately, and I could stand at the front and back of it for panoramic views along the canals. 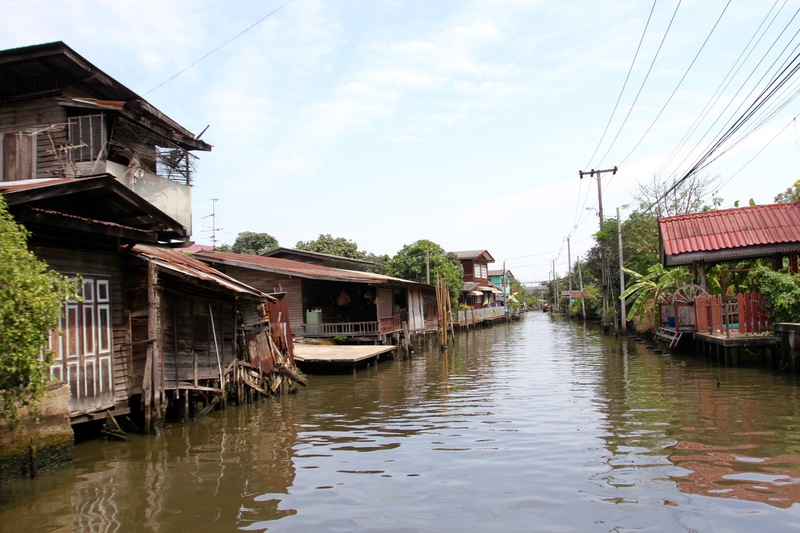 It allowed me to get a better sense of the route and the communities that lined the canals. I was mentally checking off all the vaccinations I’ve had to protect me from a range of tropical illnesses, and I reckoned my chances of surviving a fall in the water to be only 50/50. All the more surprising then that young children were swimming in the water. 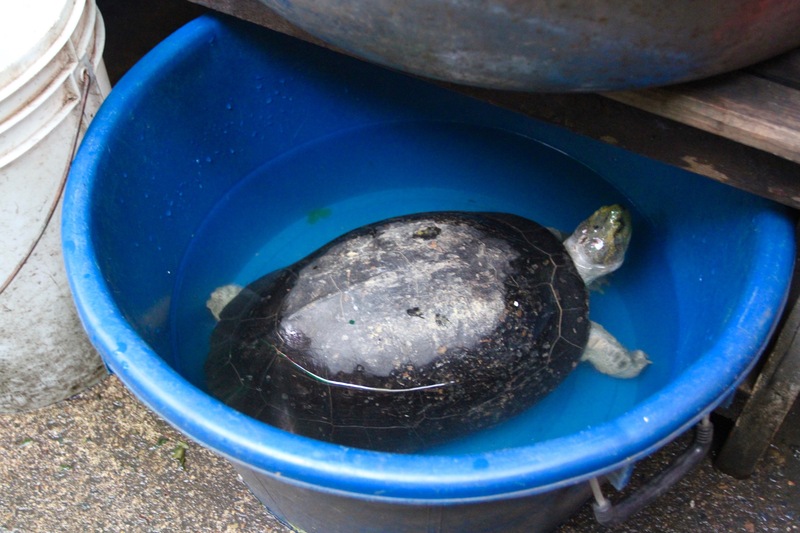 It was 36ºC and humid so it was understandable, but you couldn’t pay me to take a swim in these waters. 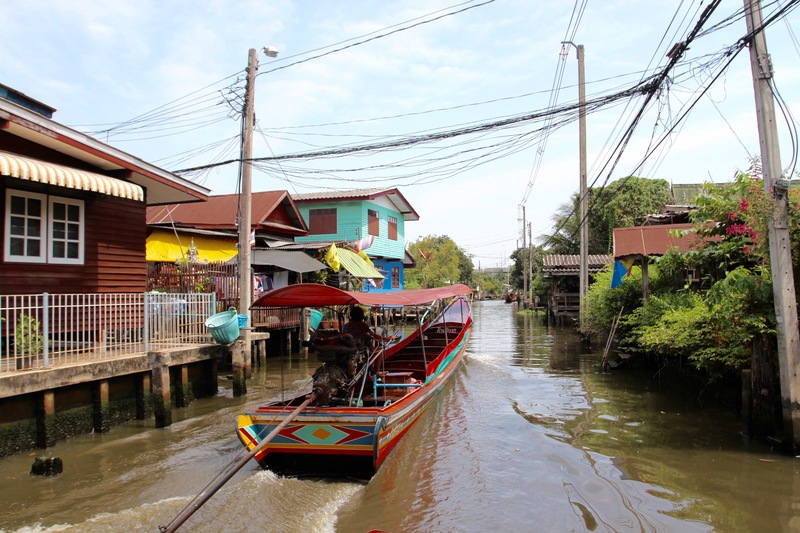 As we made our way along the ‘canal tour’ route through the ancient Thonburi district on the western side of the city, we passed numerous buildings on stilts. Many were in a state of decay, others were clearly homes of wealthier residents, well maintained and sometimes with gardens. 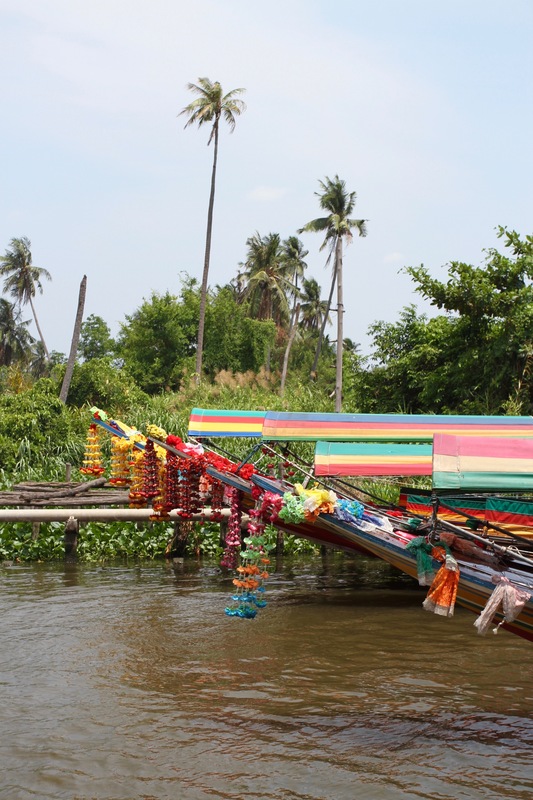 We passed ornate and brightly decorated temples, fishermen floating in inner tubes, and people in canoes going about their daily business. 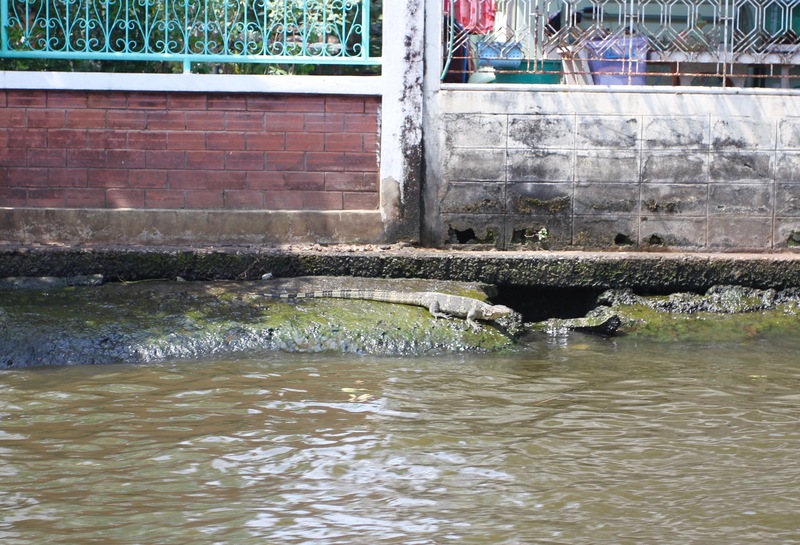 While the canals might be a relic of the past, they could play an enhanced role in the city’s future – and not just because of the congestion on the roads. 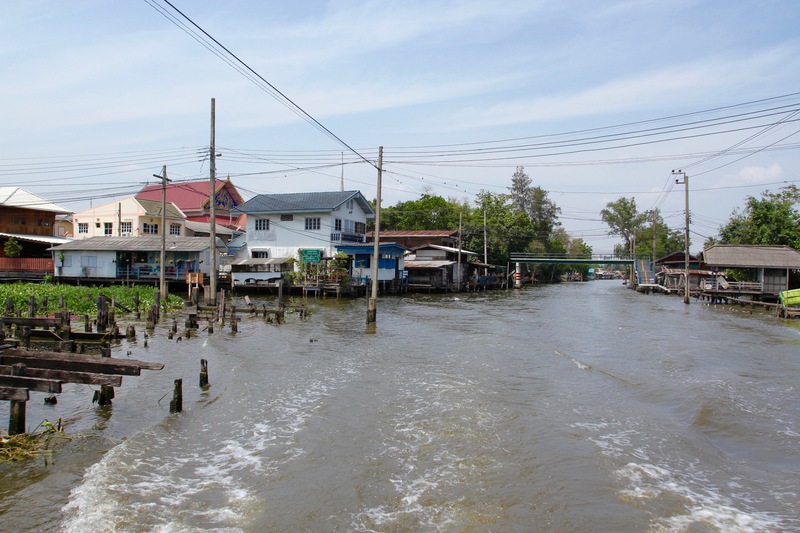 Bangkok is slowly sinking – something it shares with Venice at least – at a time when global warming is raising sea levels. 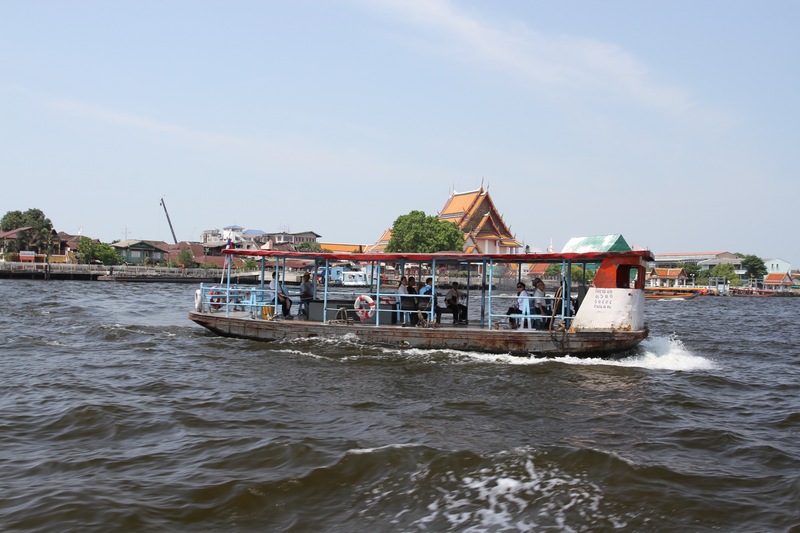 Travel by boat may well become the only viable option in some parts of the city. 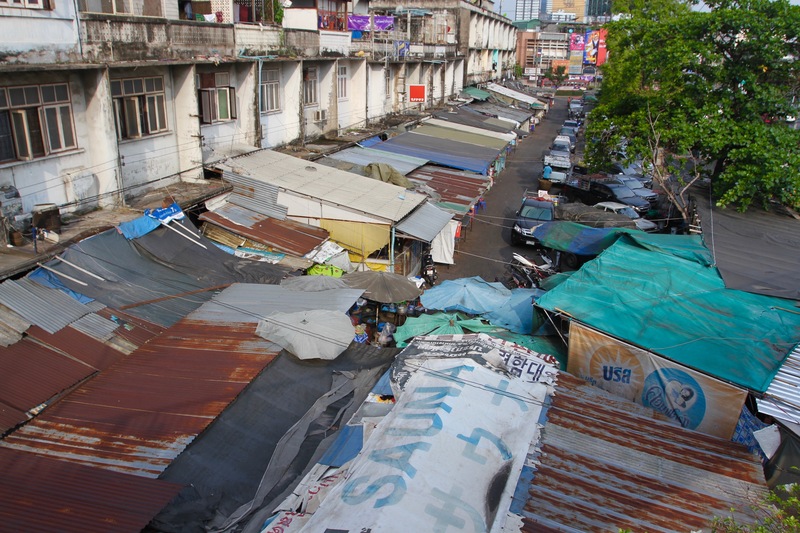 It’s hard not to smile at the irony of the name Khlong Toei when you’re walking around the vast market for which this district of Bangkok is famous. 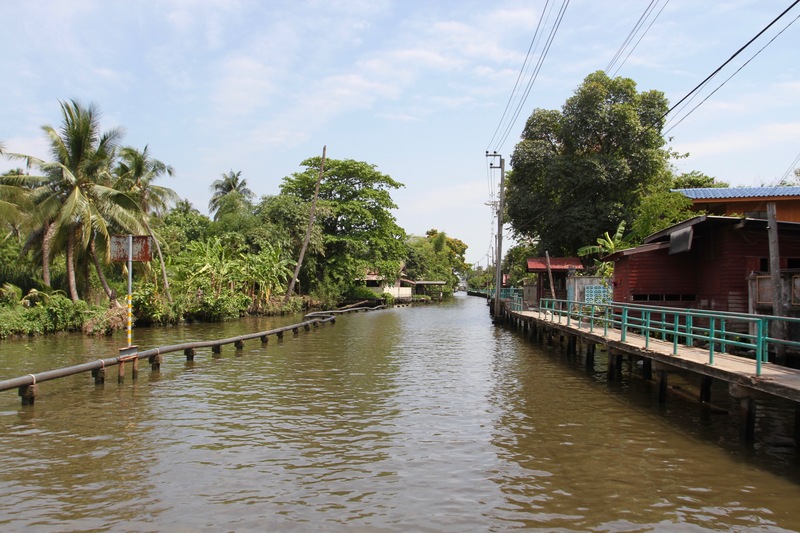 Khlong Toei, or the Canal of Pandan, gets its name from the fragrant leaves of the pandan plant, an ingredient that is used widely in many foods across Thailand and Southeast Asia. 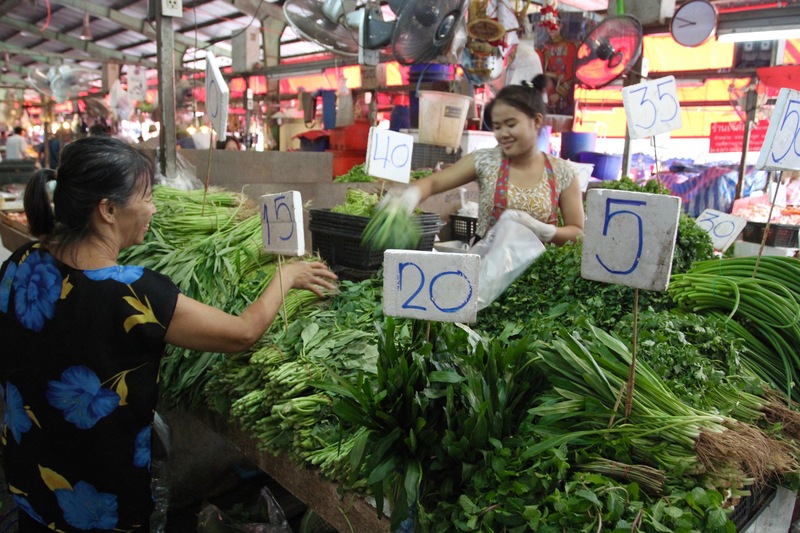 The pandan leaf is known for its sweet fragrance. 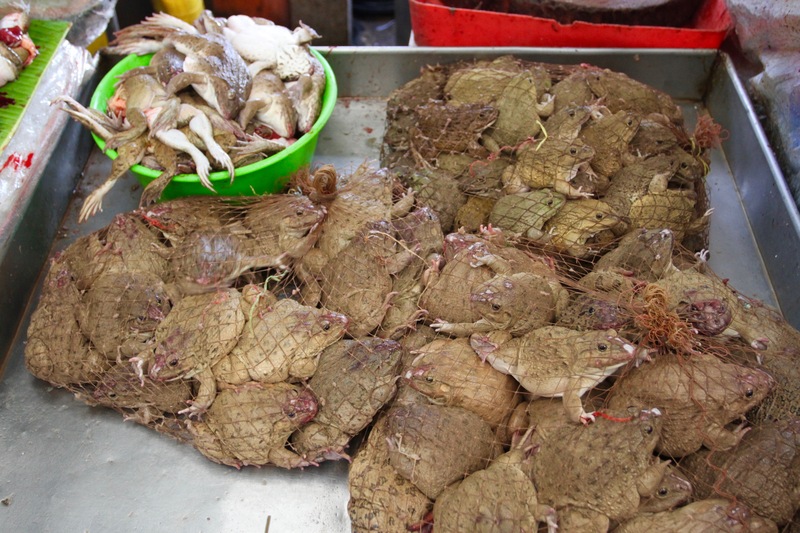 Khlong Toei market is not. 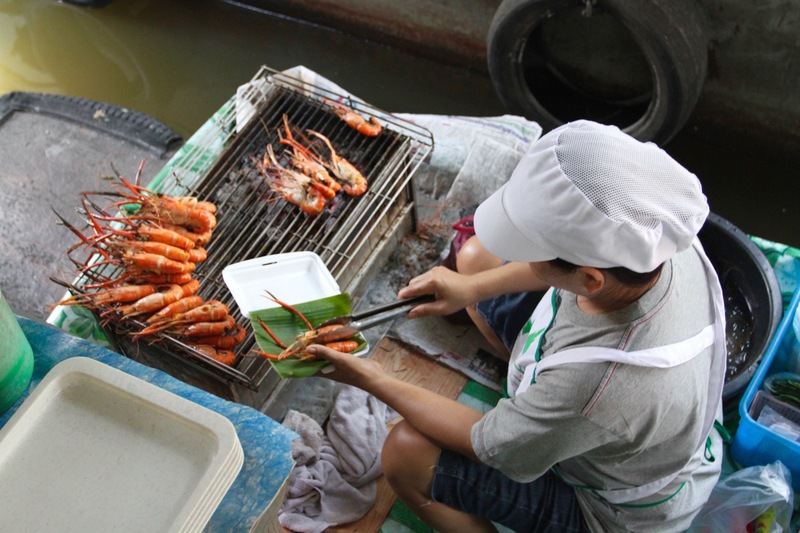 Khlong Toei is home to Bangkok’s largest fresh food market, and by fresh I mean still twitching, if not actually wriggling. 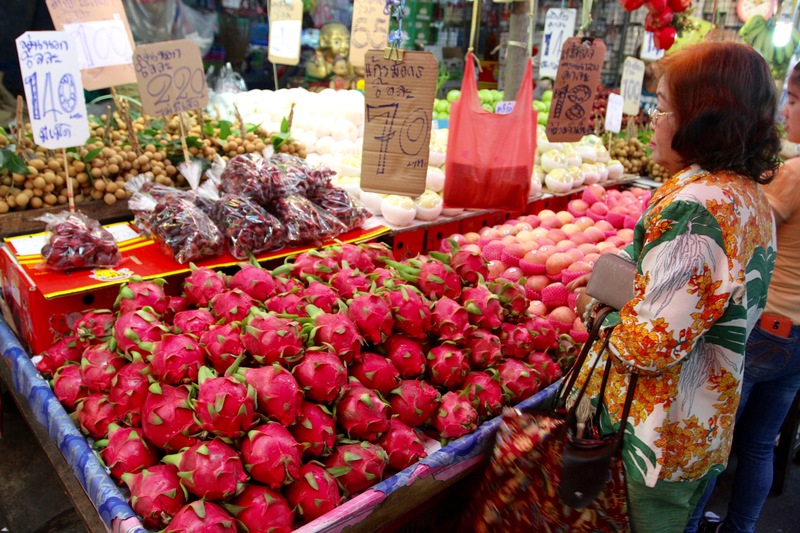 It’s a place that feeds tens of thousands of people each day, and is home to a cornucopia of foodstuffs that would be hard to find in most places on the planet. What it isn’t, however, is fragrant. The canal from which the district takes its name has now largely been filled in and built over. 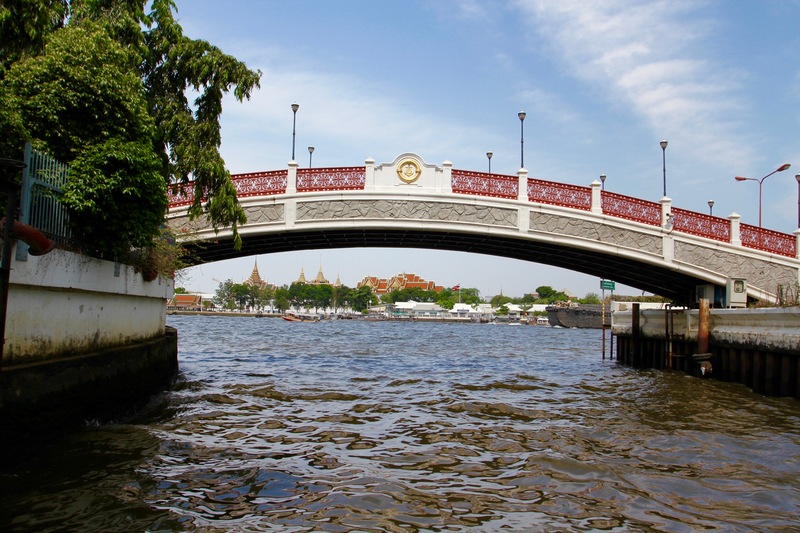 The Rama IV road runs along the same route, but instead of carrying boats it now carries speeding cars. The market still has a canal running though it though, the sort of canal that would definitely attract the attention of the health and safety inspectors in many countries. 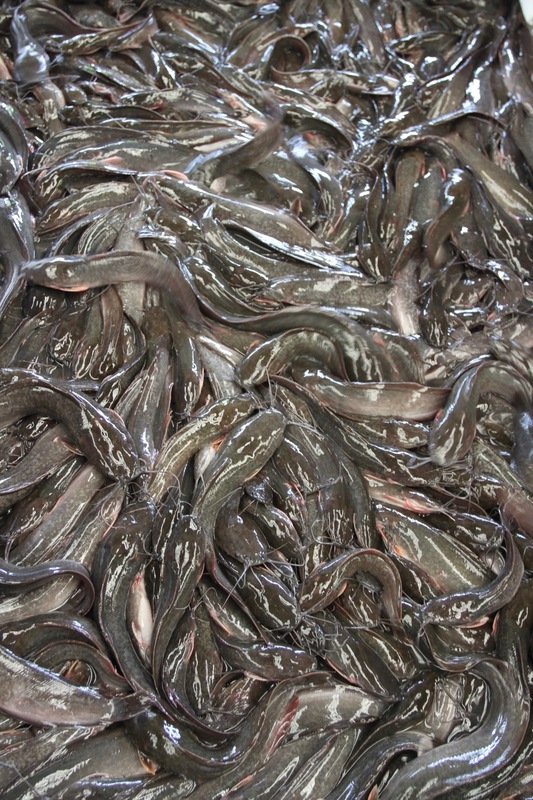 Like the canal, the market is a remnant. 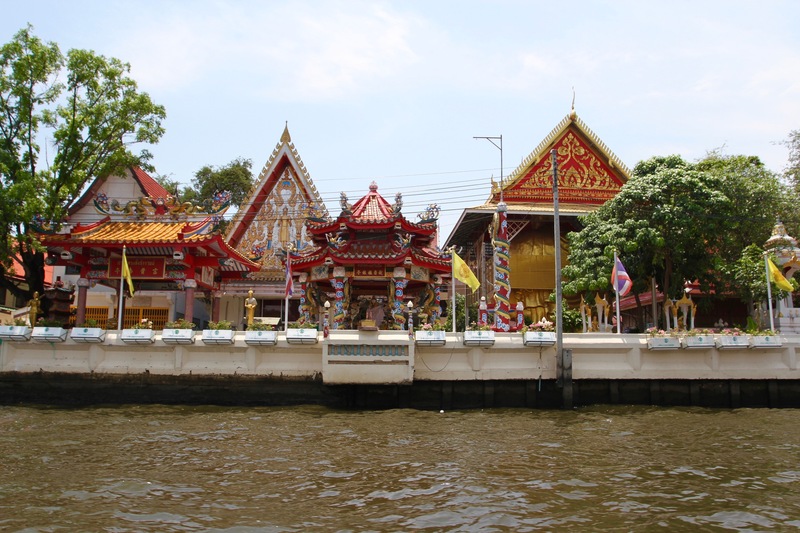 The district of Khlong Toei is located on the Chao Phraya River and was once Thailand’s most important port. The district grew around the port, and a notorious slum grew up in the district. 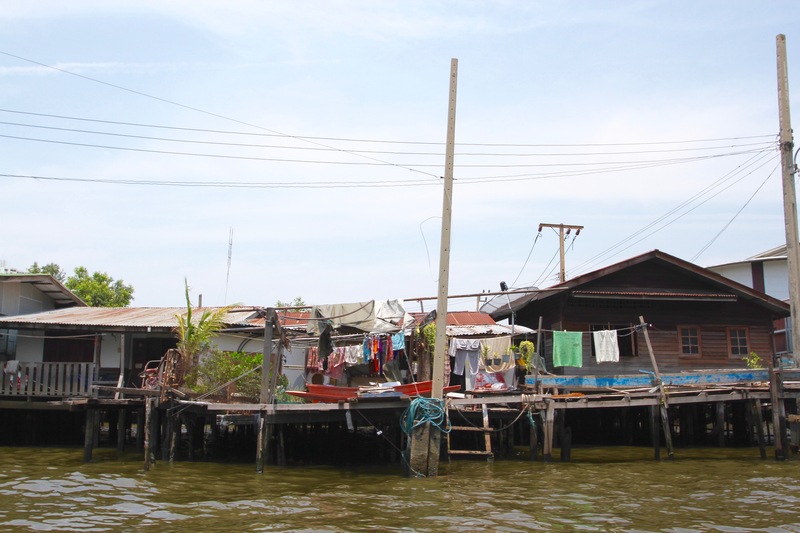 The big ships have now gone, thanks to a new port built on the Gulf of Thailand in the 1980s; but the slums remain, and this area is one of the poorest in Bangkok. It comes with a reputation for crime and poverty. Drugs, alcoholism and gang-related violence are common. 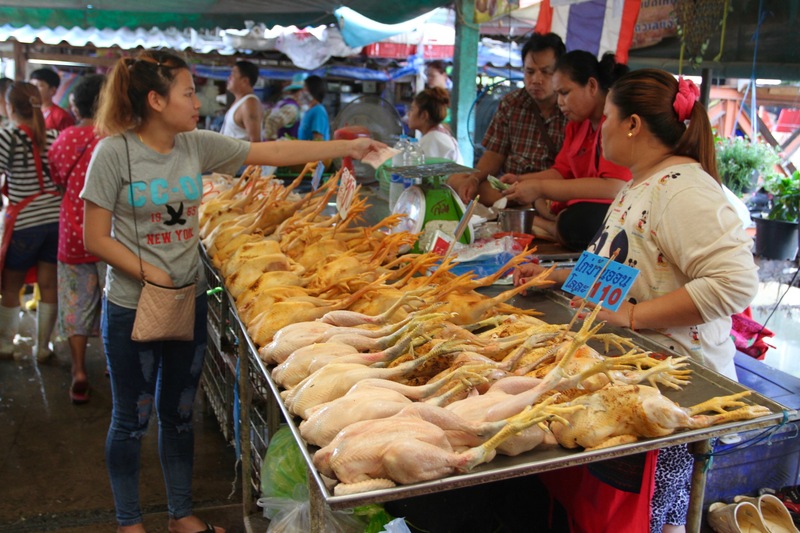 Khlong Toei market is a powerful reminder of the history of this area, and still attracts thousands of people shopping for fresh food each and every day. 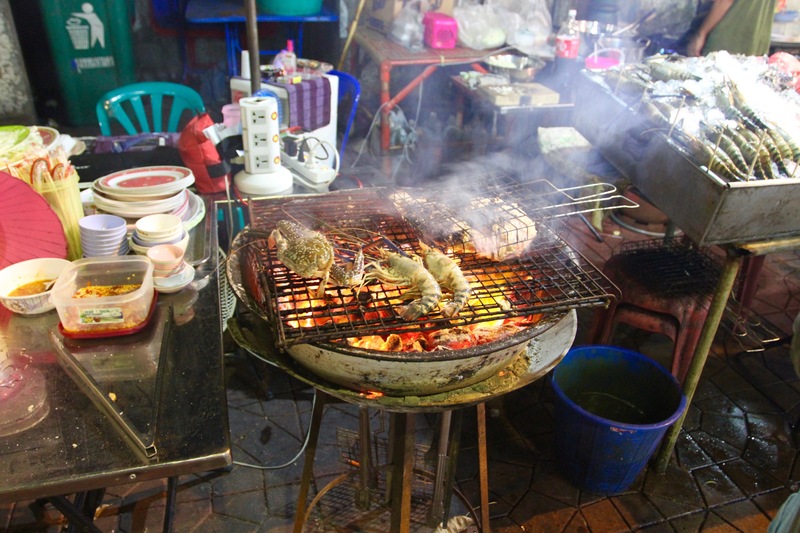 If you eat street food in Bangkok, there’s a reasonable chance it came from Khlong Toei; and if you eat at an upscale restaurant, there’s an equally strong chance the raw ingredients in your food originated here as well. 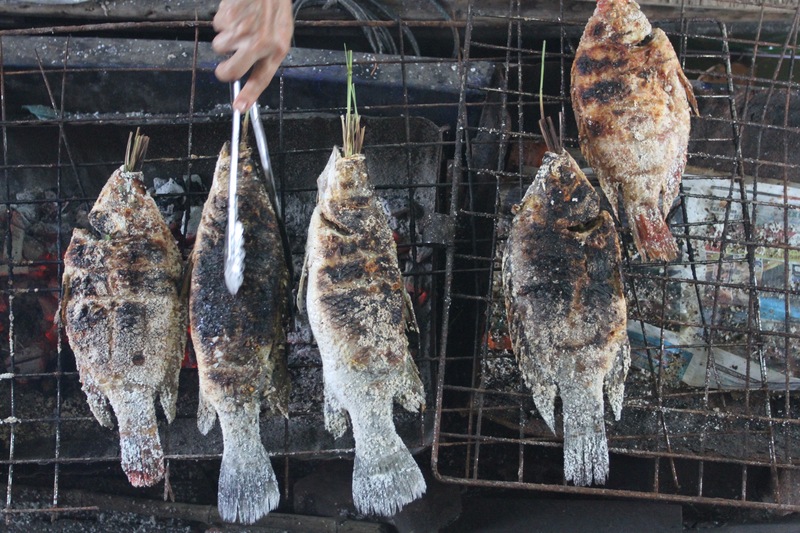 Khlong Toei is a republic of food. 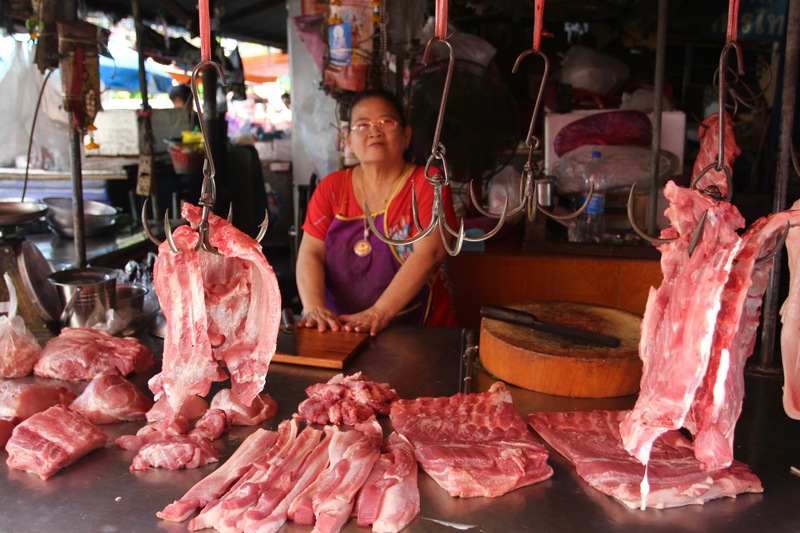 The sheer rawness of the market is breathtaking. 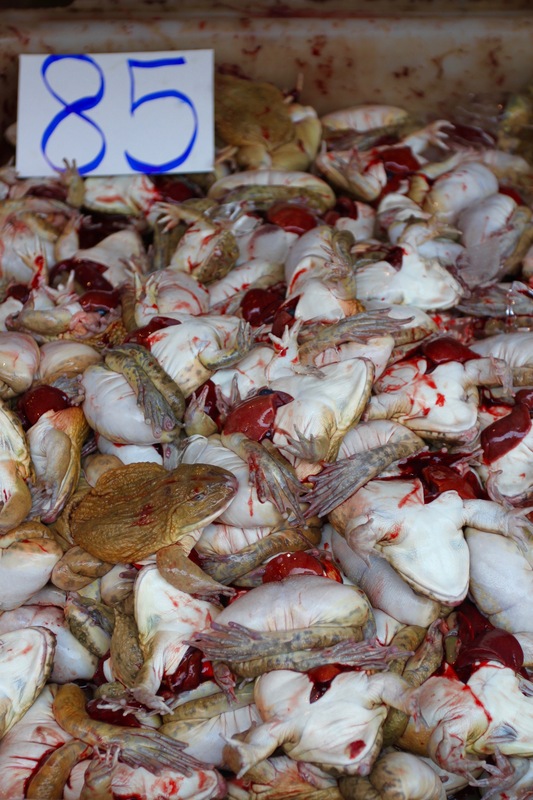 There is no pretence here about what happens to the food you eat. 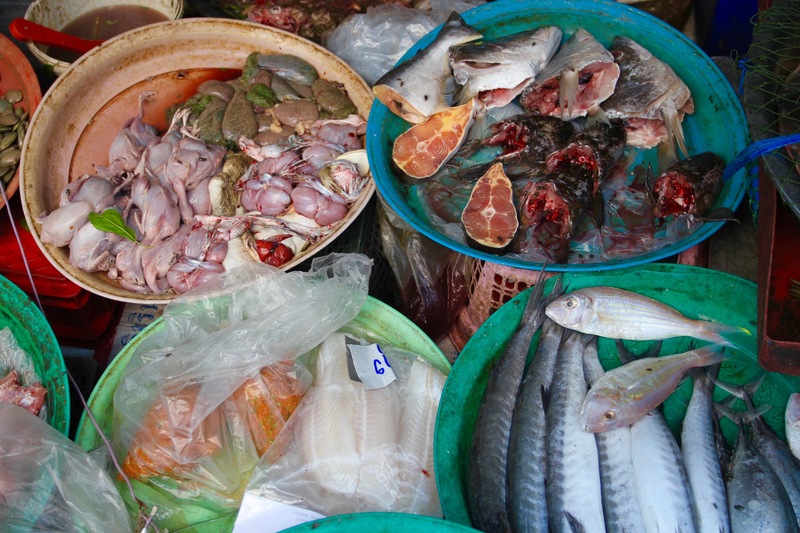 Large pieces of animal are sliced and diced in front of your eyes; chickens pulled live from their cages are dispatched with a sharpe knife on a nearby chopping block; live fish slither and slide over each other in large plastic bowls; and all manner of other creatures are to be found here awaiting the cooking pot. 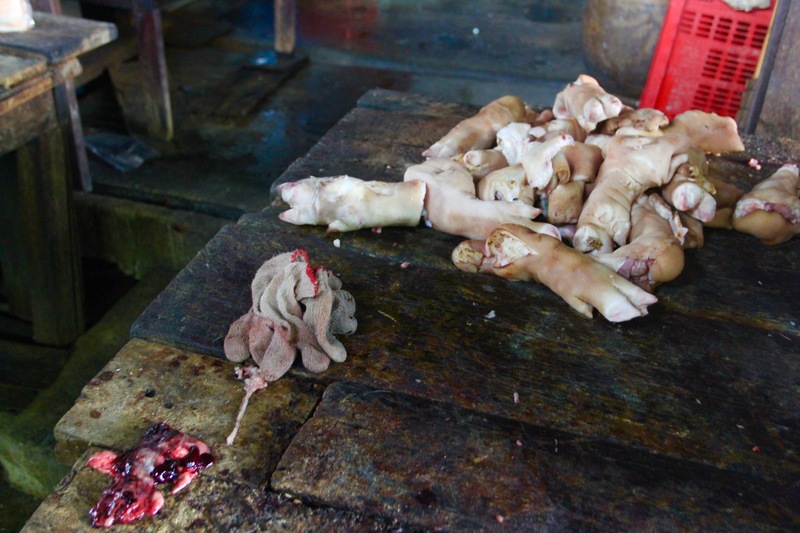 This is not a place for the squeamish. 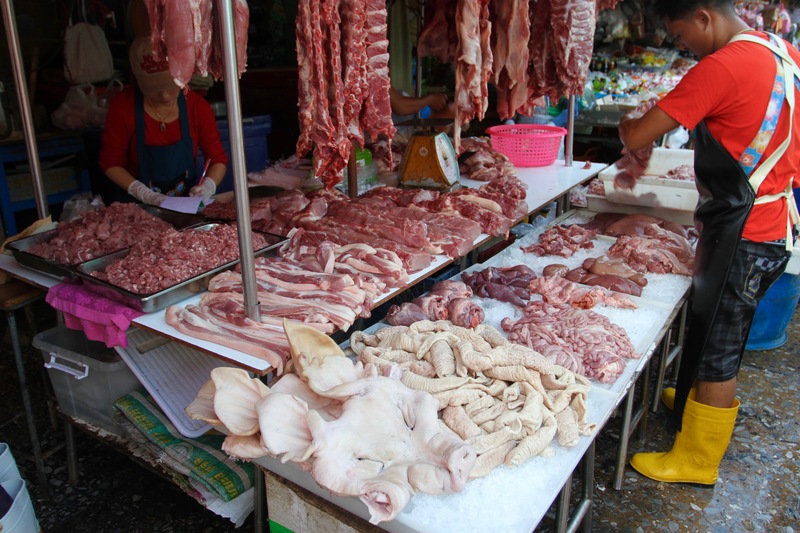 Although it may look unhygienic, the whole area is regularly washed down, most stalls keep everything on ice to keep it fresh, there aren’t many flies and I didn’t see a single rat. 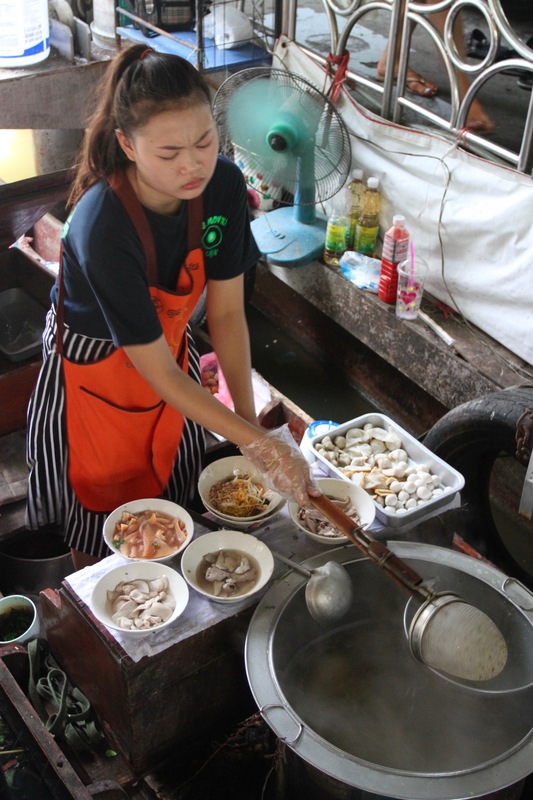 In the midst of all this activity, there are plenty of small food stalls selling freshly cooked meals and, if you’re here around lunch time, it’s a great place to get good, cheap food. 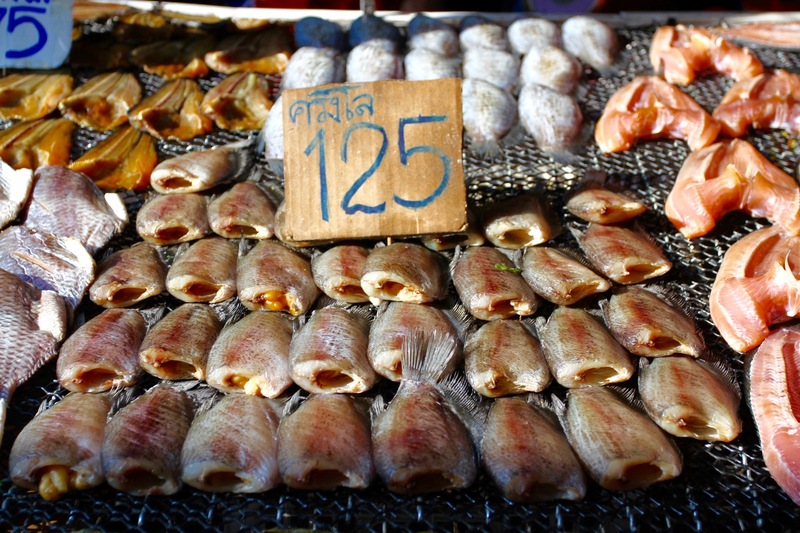 I spent a good couple of hours walking around Khlong Toei’s market. People were friendly, if a little bemused to be asked for a photo. Occasionally I’d be offered something to eat. Mostly I figured this was a joke at my expense. 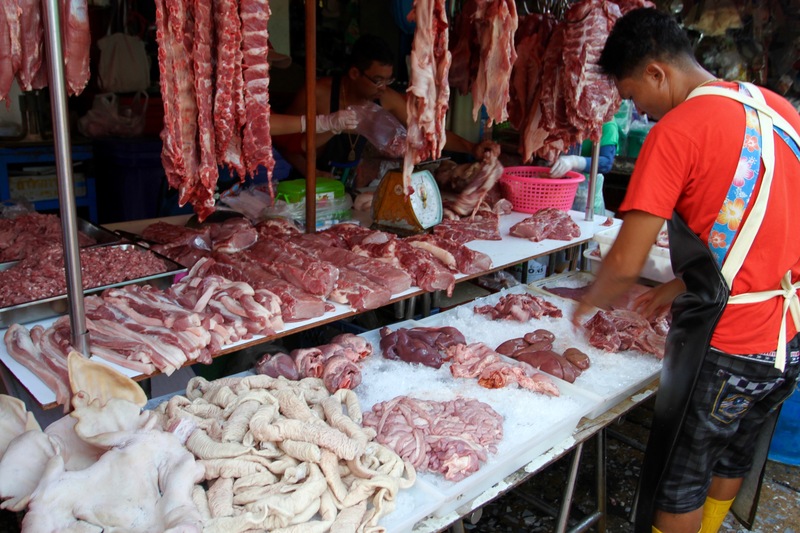 I could have spent much longer wandering the narrow aisles, but the temperature was rising and it was already uncomfortably hot and humid amongst the market stalls. 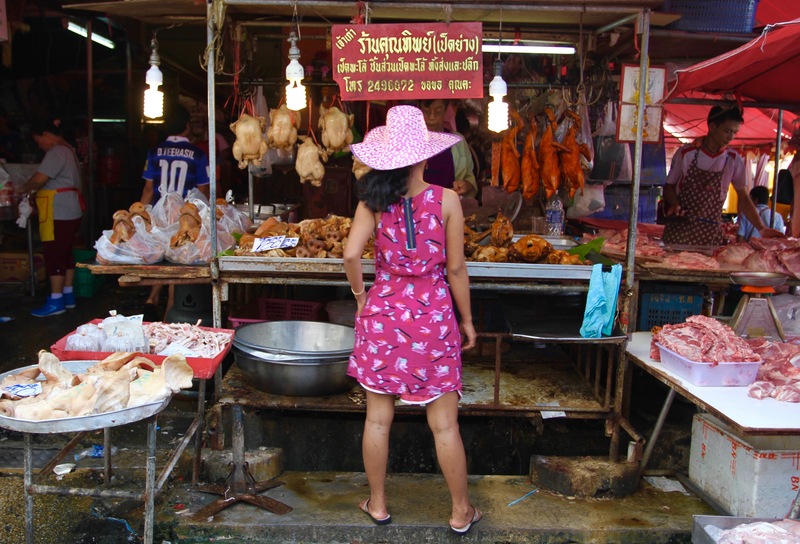 Leaving the market behind, and heading back to the nearby Khlong Toei metro station, felt like leaving one universe and entering another. 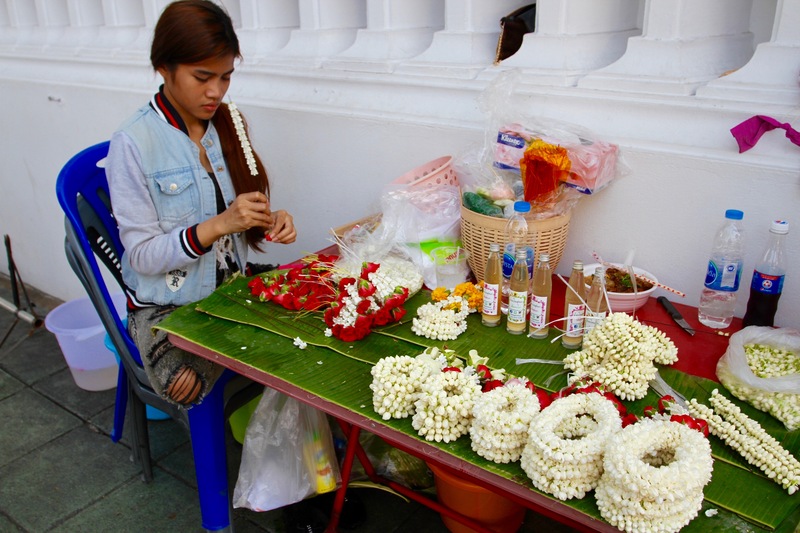 The quiet bustle of the market contrasts with the cars whizzing past on the Rama IV highway nearby, and even more so with the modern new metro station a short walk away. 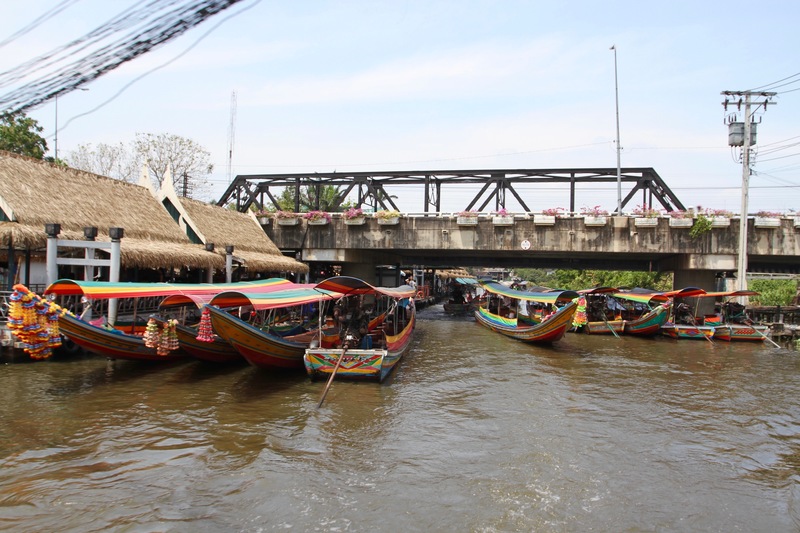 Khlong Toei is steadfastly in the old world. 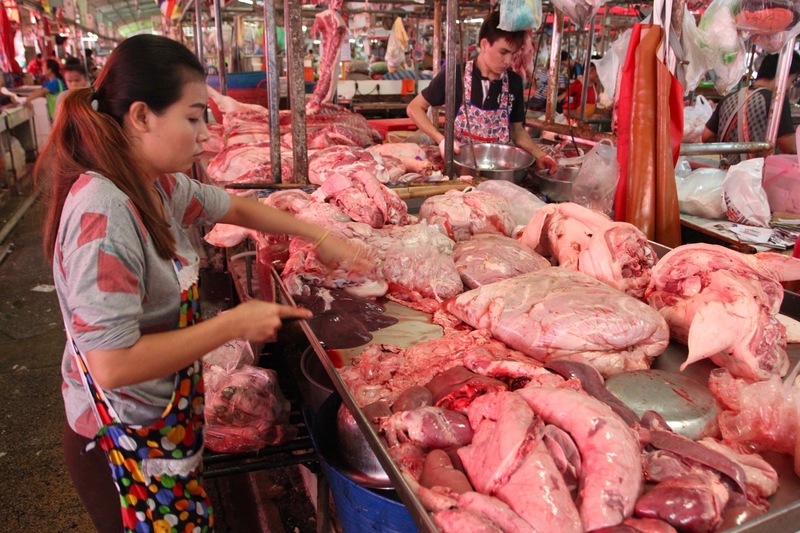 I can say with some degree of certainty, you should never visit the vast sprawling market of Khlong Toei with a hangover. I can say with even more certainty that, should you visit, it will take several days to get the smell out of your nostrils and to banish the sights from your mind. 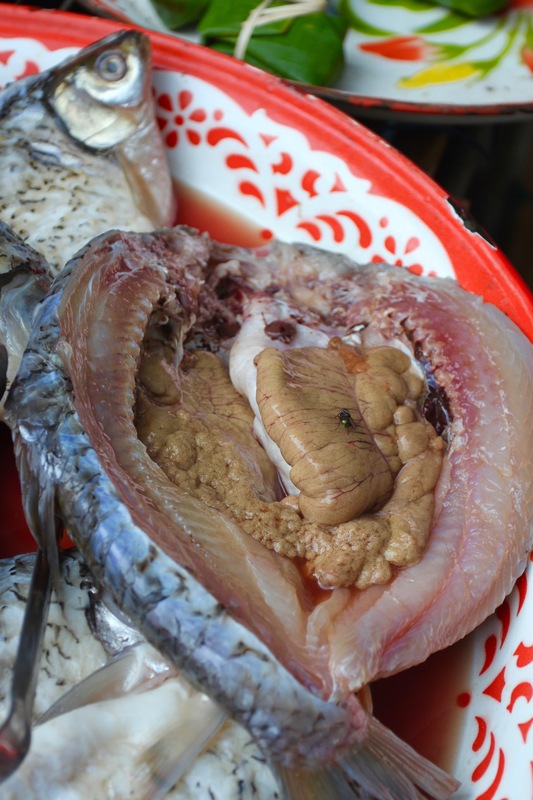 My advice for those determined to experience Khlong Toei, is to make sure you packed a strong stomach before arriving in Thailand. 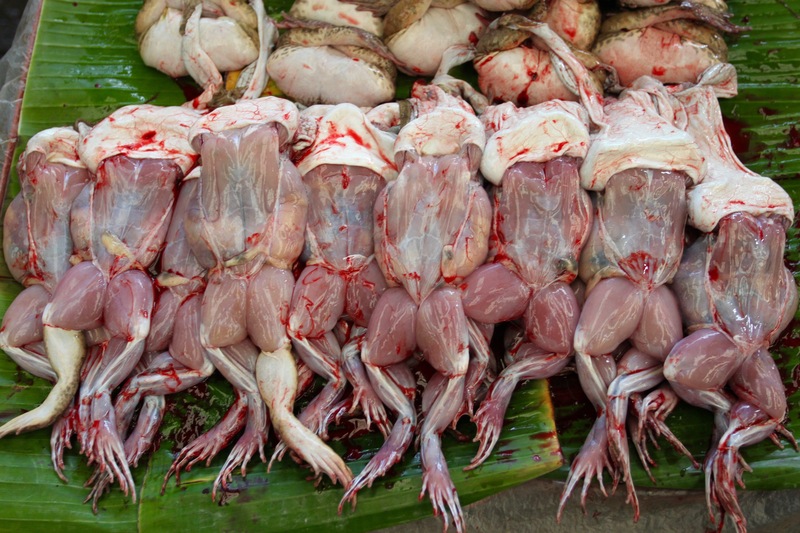 At least I now know why it’s called a ‘wet market’. 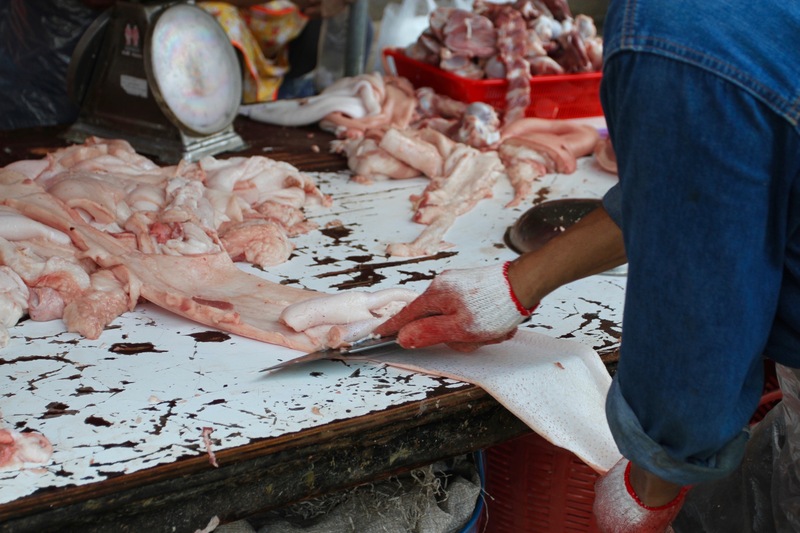 The bottom of my trousers were soaked and splashed in ice melt mixed with blood, guts and other, less savoury, things. My flip-flop wearing feet may never be the same again. 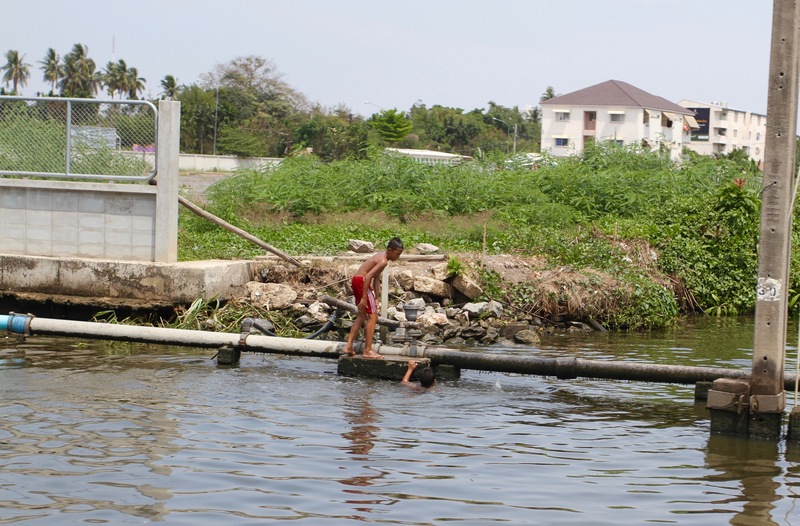 In a country as hot as this, it’s remarkable how much ice there is at Khlong Toei. 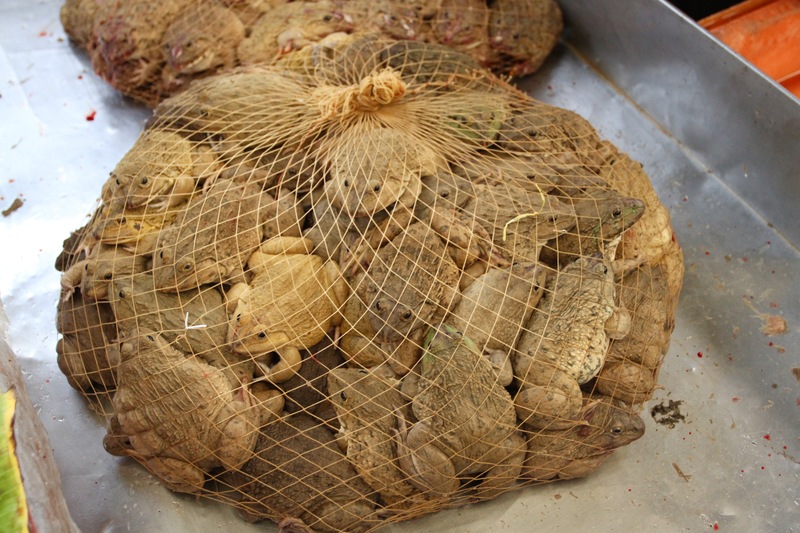 Keeping mountains of fish, poultry, pork, frogs, snails, insects and a multitude of other unfortunate edible creatures fresh is no easy feat. 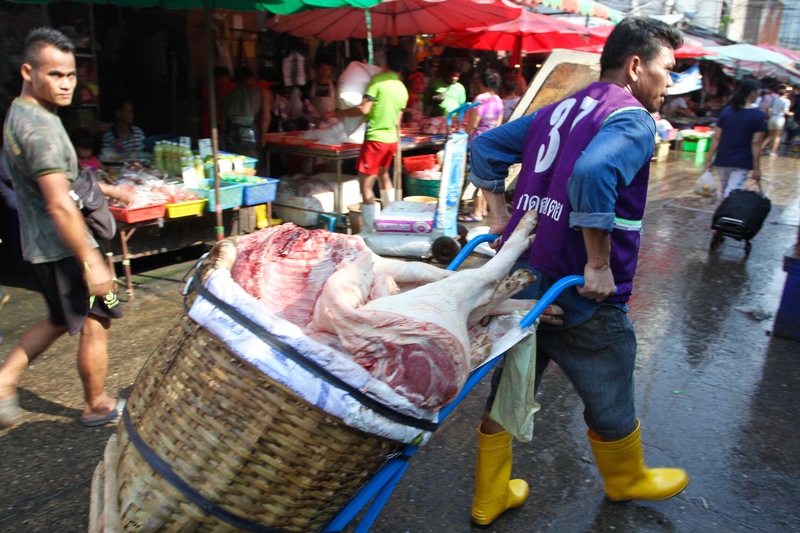 As you move around the market porters rush past with bags of crushed ice, water running out of the sacks as the ice melts. 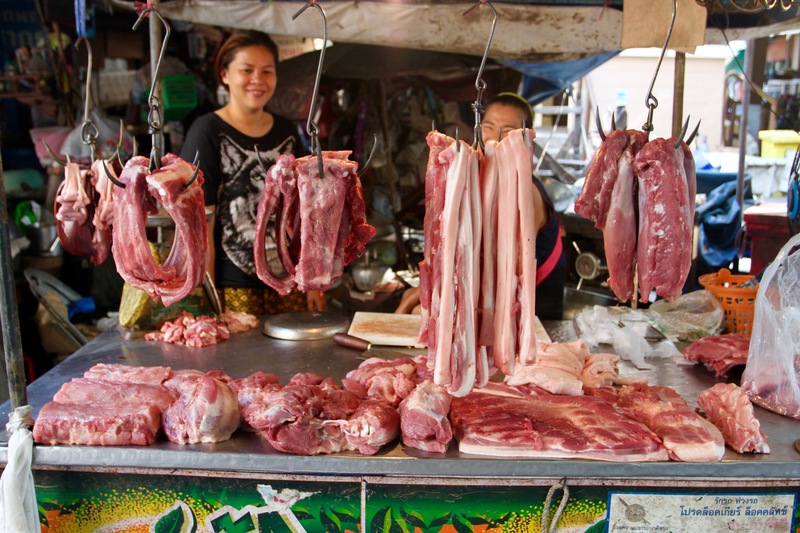 I found myself entering the market at a point where there were some meat stalls. 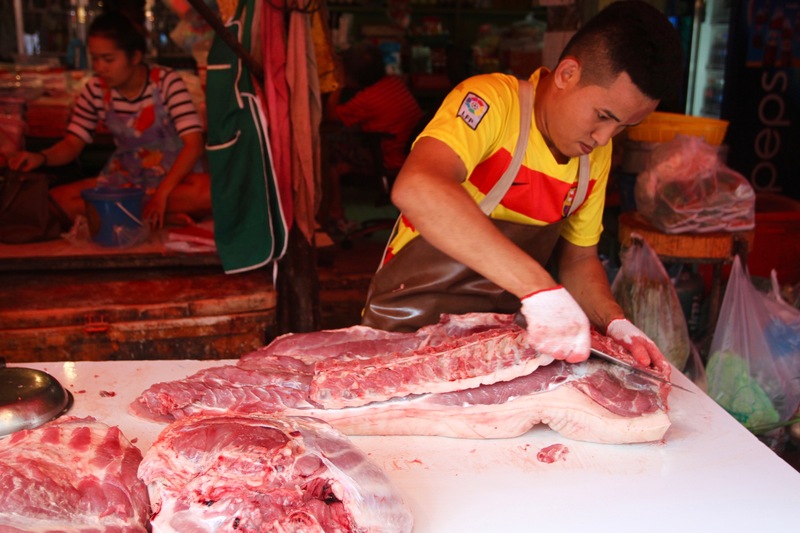 My first sight of Khlong Toei was of a pig’s head being sliced up and laid out on display. 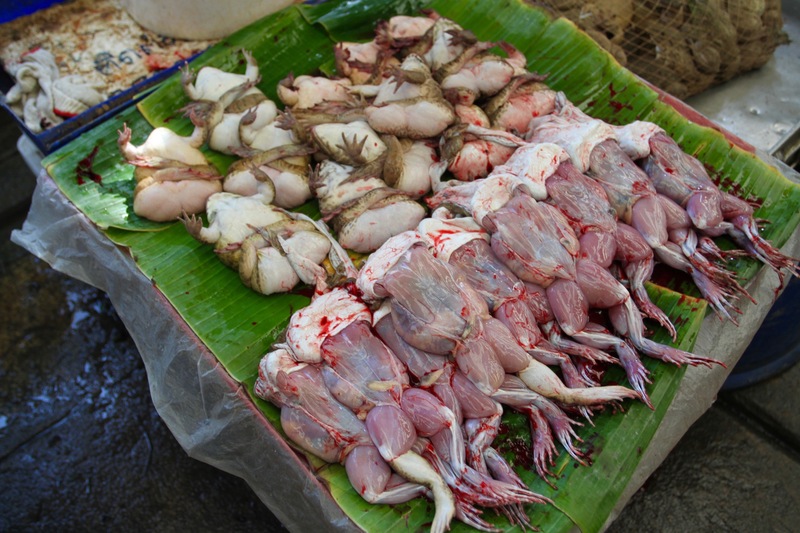 I thought about turning back at that point, but then I spotted a group of women eating breakfast amidst the carnage. 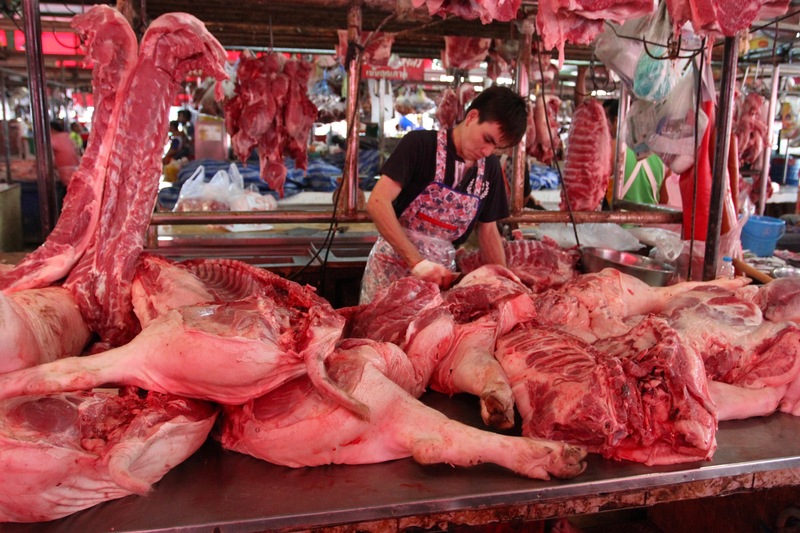 If they could happily eat, while two feet away a man sliced the fat from beneath the skin of a pig, I could stomach a stroll around. 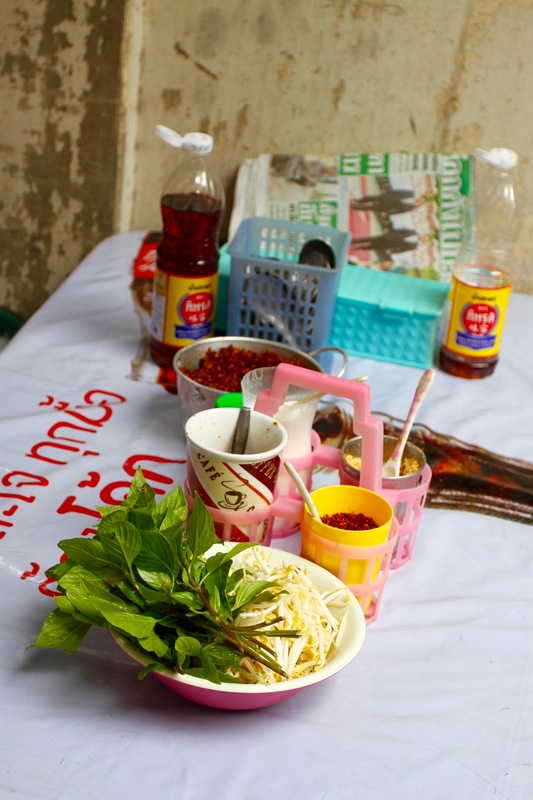 Khlong Toei is as far removed from the so-called ‘farmers markets’ of modern Europe as it’s possible to get. Life and death are here in the raw. 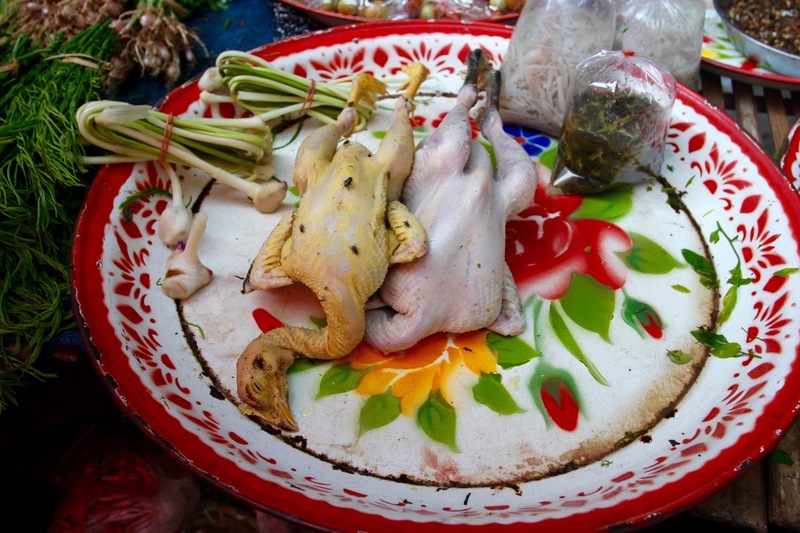 Fish, still alive, flip and flop around in bowls; live frogs are bundled into mesh sacks inches from some of their skinned and chopped compatriots; ducks, chickens and geese are crammed into cages, escaping momentarily only to be sent to the chopping board. 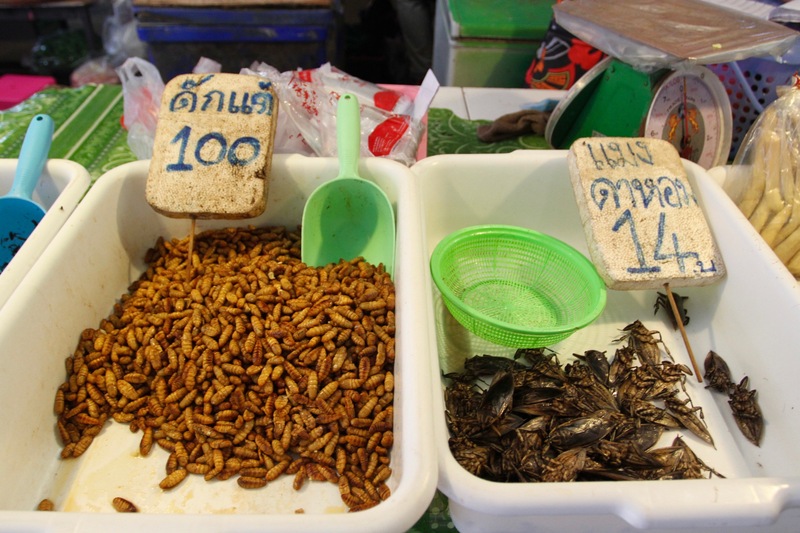 There were piles of insects – a nice man tried to convince me to share some maggots with him, I had to decline on the grounds that I didn’t want to vomit while people were shopping for lunch. 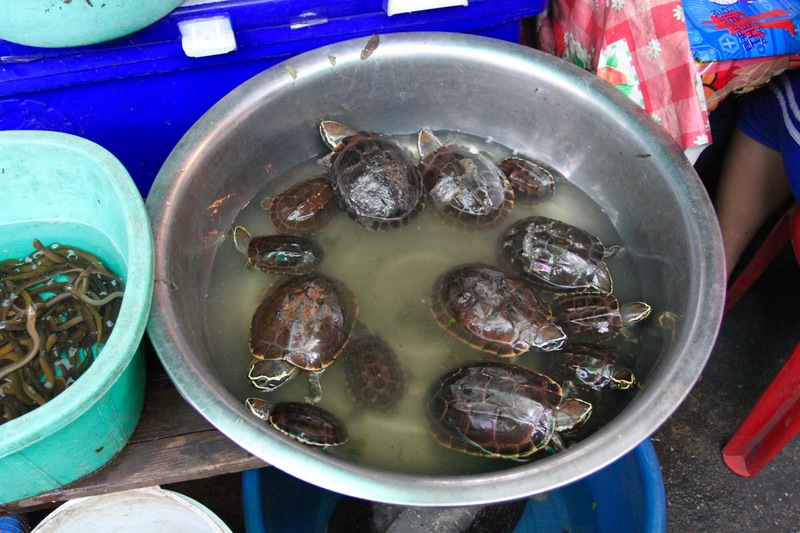 Tortoises, terrapins and turtles awaited their fate while frantically trying to escape from plastic bowls; there seemed to be chickens, or at least bits of them, everywhere. 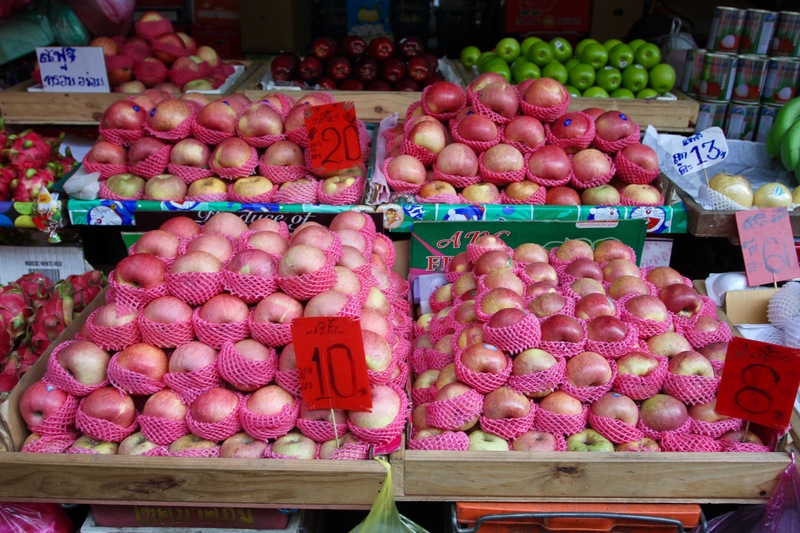 Elsewhere, mounds of apples, mangoes and jackfruit, chillies, lemongrass and spring onions added a sense of normality to proceedings. 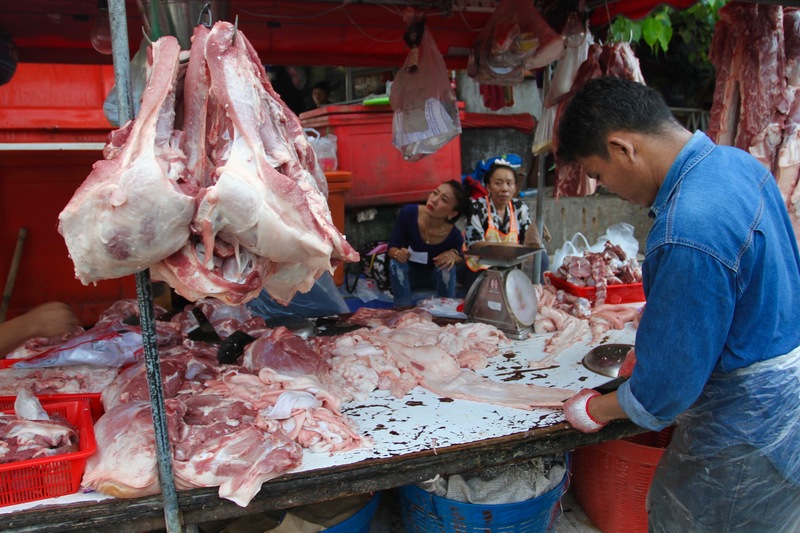 Amidst all this blood and gore, people go about their shopping unaffected either by the sights and smells of the market, or by a bewildered tourist photographing it all. 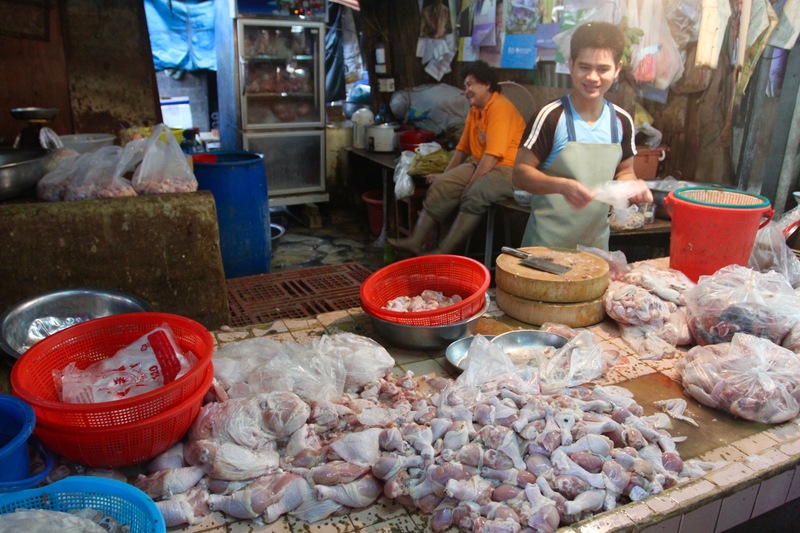 In the middle of row of stacked cages filled with poultry, I realised just how easy it would be to catch bird flu and, simultaneously, just how far removed from the reality of our food chain we have become in modern industrialised societies. 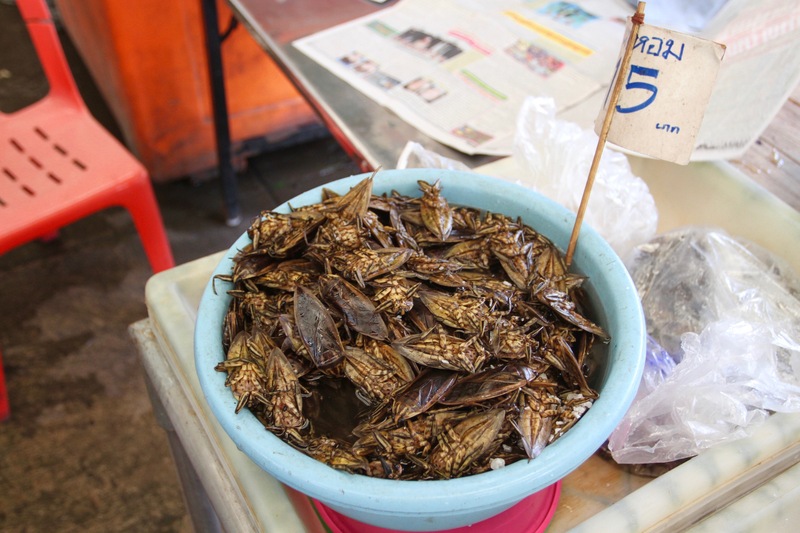 There is very little at Khlong Toei that comes vacuum-packed in plastic, making it even more remarkable that there are so few few flies. 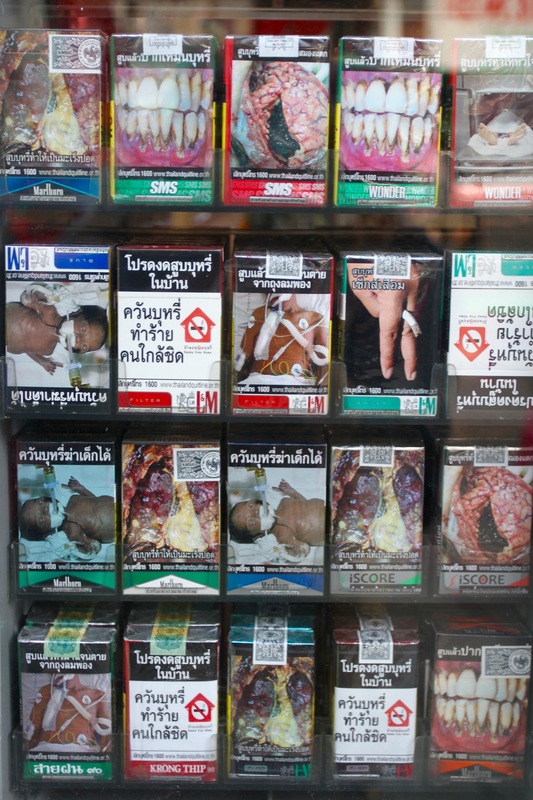 One of the, very few, benefits of being underprepared while visiting a city in a foreign country is that, occasionally, the lack of preparedness gives you a rich experience; wrong turns lead to the right outcome, and you discover something unexpected about yourself and the city you’re visiting. 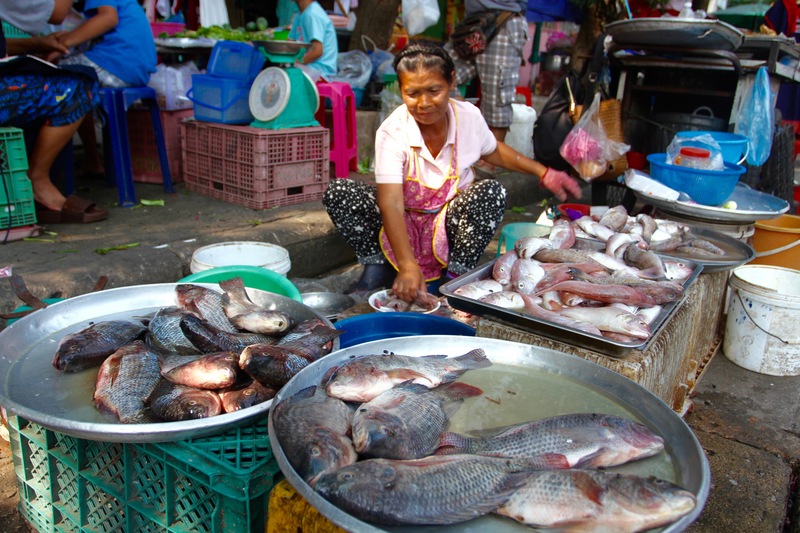 So it was when I set off to visit Bangkok’s largest ‘wet market’, Khlong Toei. 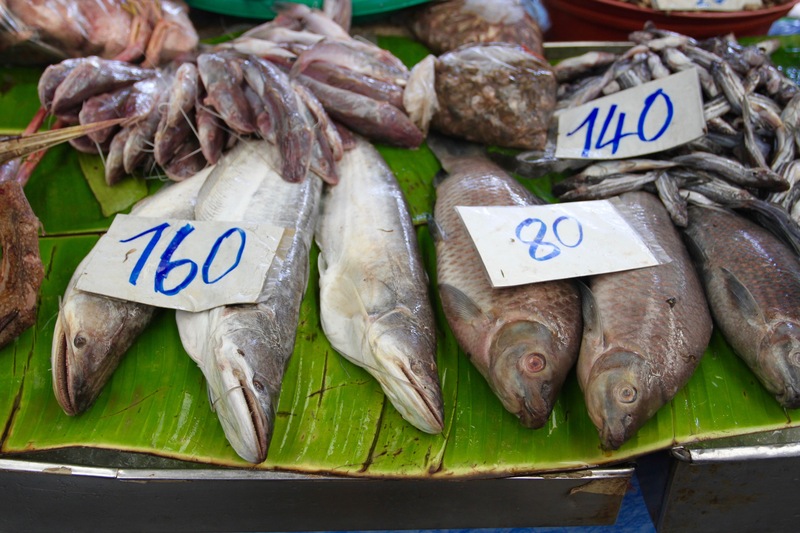 I knew I had to take Bangkok’s shiny new metro line to the eponymous Khlong Toei station; I knew I was looking for an enormous fresh food market only a short walk from the station. When I arrived at the near-deserted station, there was even a sign in English telling me which of the two exits to take. How hard could it be? Not as easy as I’d imagined is the answer. I arrived at street level and, confronted by a six lane highway with speeding traffic but no actual people to ask directions, I immediately took a wrong turn. 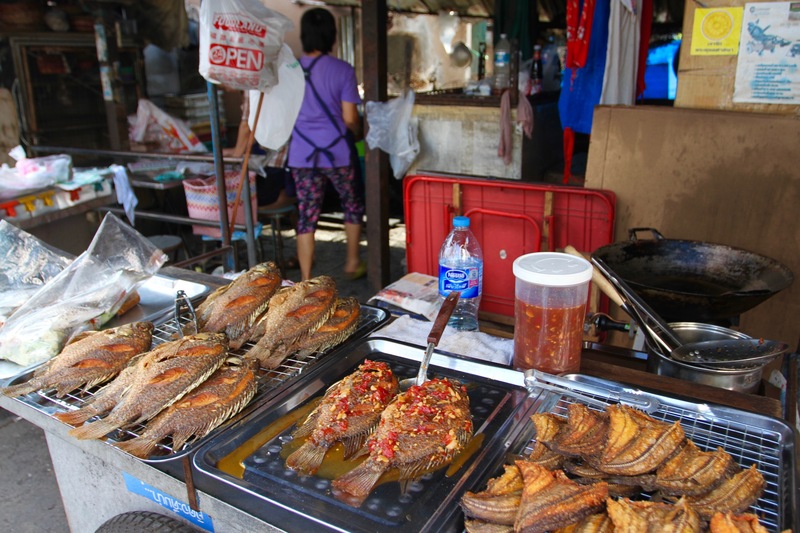 Instead of Khlong Toei wet market, I found my way into a warren of small lanes and alleys that you’re unlikely to find recommended in any guidebook – not that that is a reason not to go. Determined to believe, against the evidence of my own eyes and the disbelieving looks of local people, that I’d arrived where intended, I set off to explore. It was a poor area of ramshackle homes and dirty streets, but wherever I went people smiled and greeted me. Whenever I asked if I could take a photo, people burst into laughter and always said ‘yes’. 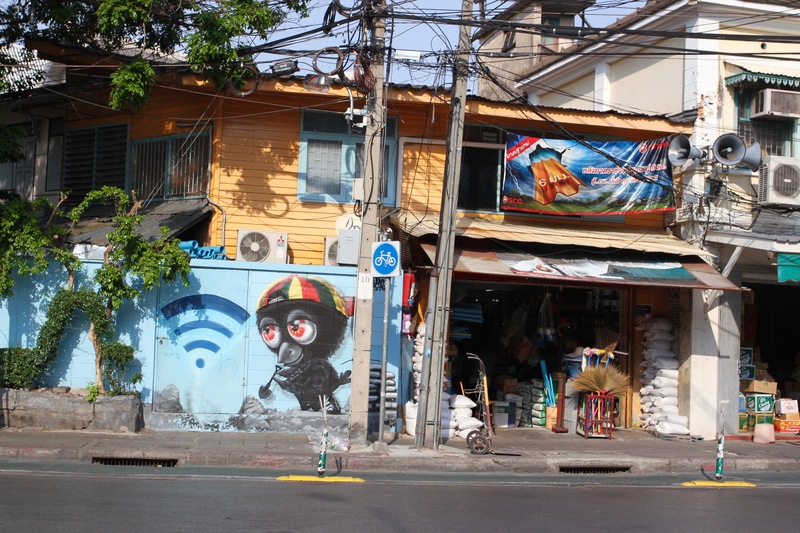 This was old Bangkok, but nearby were signs of the new Bangkok. A couple of towers of luxury apartments offering ‘modern city living’ cast their shadow over the maze of streets below, streets that house a community I could imagine being sacrificed to developers and more towers of glass. I’m not sure I always approve of progress. 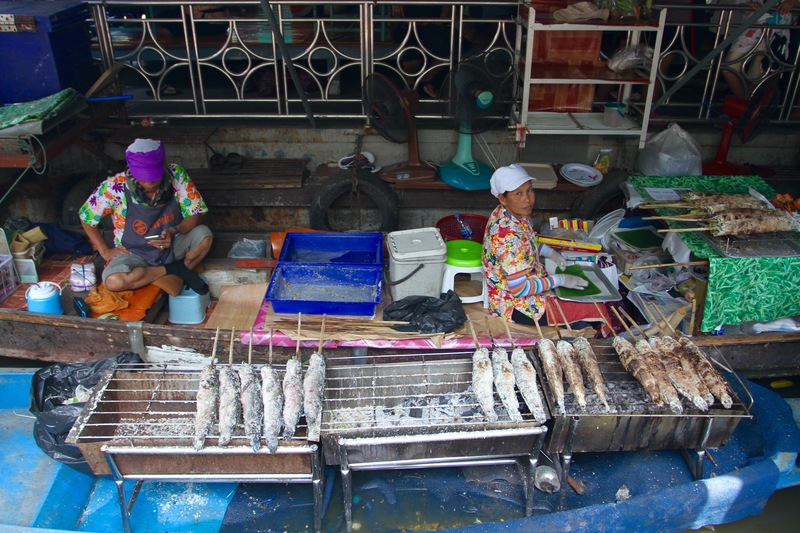 As I wandered around snapping pictures of food stalls and people cooking, the realisation dawned on me that this simply couldn’t be the Khlong Toei market I was intending to visit. It was only 9am but it was incredibly humid walking amongst the narrow alleys. 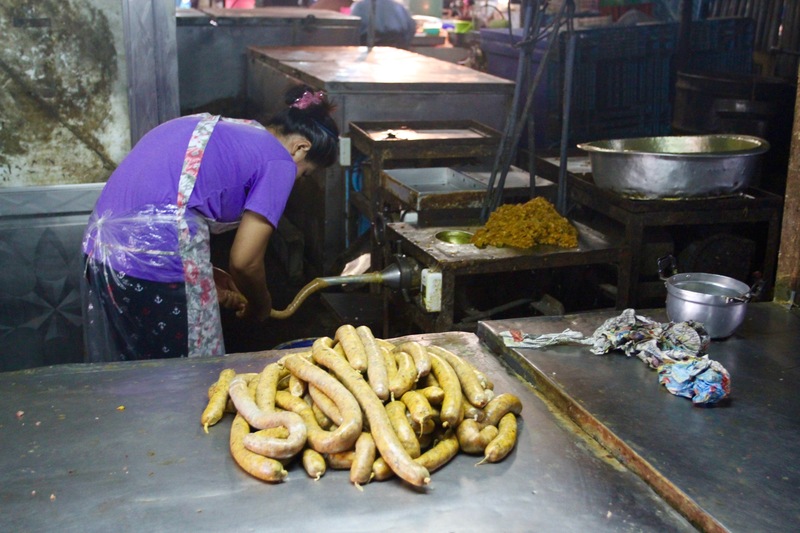 Some of the smells were making me feel pretty uncomfortable, not to mention some of the sights – a hangover I’d acquired the night before wasn’t helping. Eventually, an old lady behind a stall took pity on me. Through the power of mime and sheer determination, she made me understand that the market I clearly should have been walking around was somewhere else. 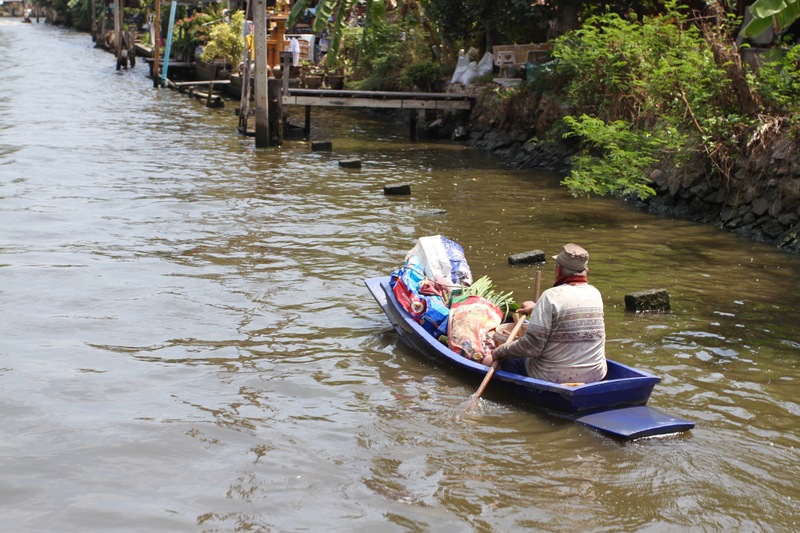 She pointed me in the right direction and I set off for the real Khlong Toei market. 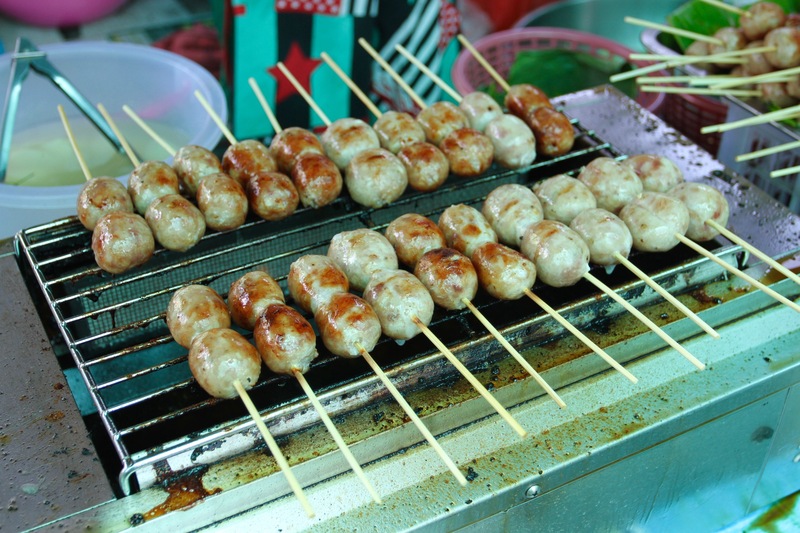 Is there anywhere on the planet that has better street food than Bangkok? 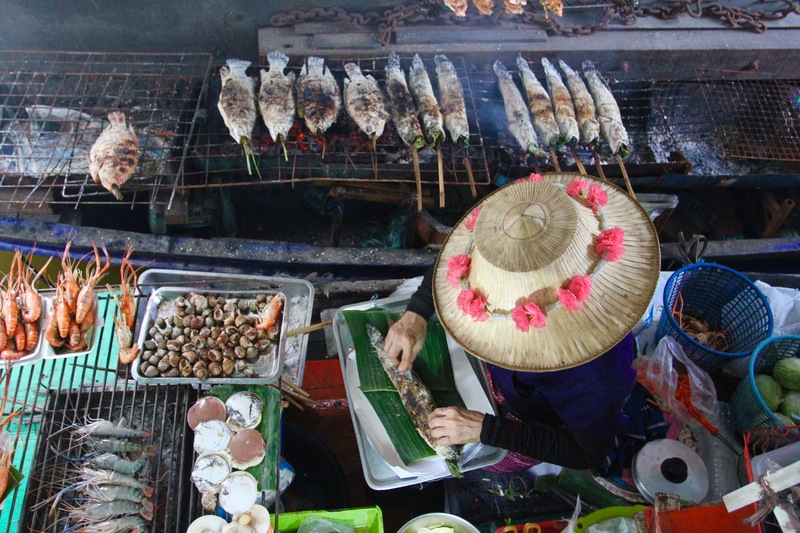 This is a foodie paradise with food, and people eating food, seemingly everywhere you look. 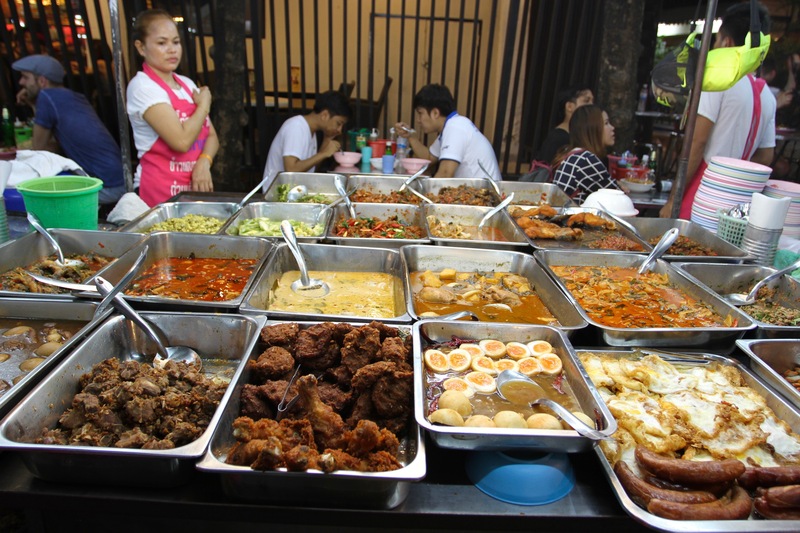 I’m not sure the people of Bangkok ever stop eating. 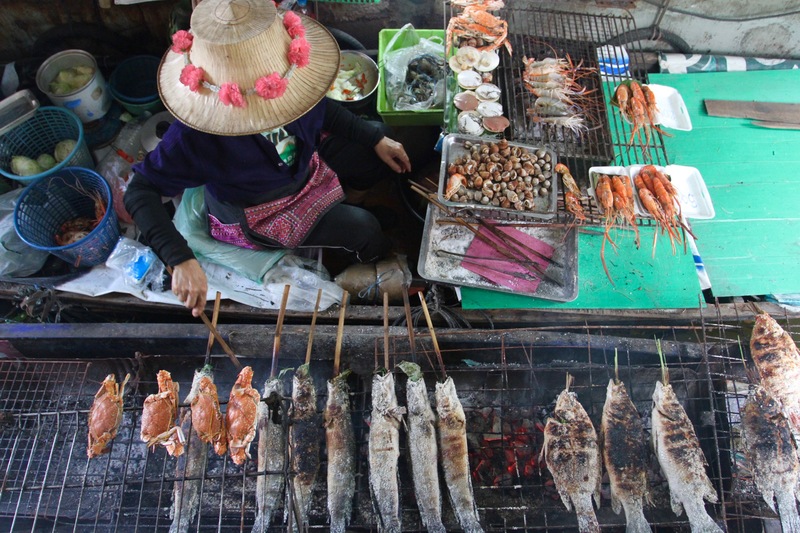 Whatever time of day or night you happen to be wandering around, there will be food stalls serving up a preposterous range of fish, meat, rice, noodles, fruit, vegetables and much more. 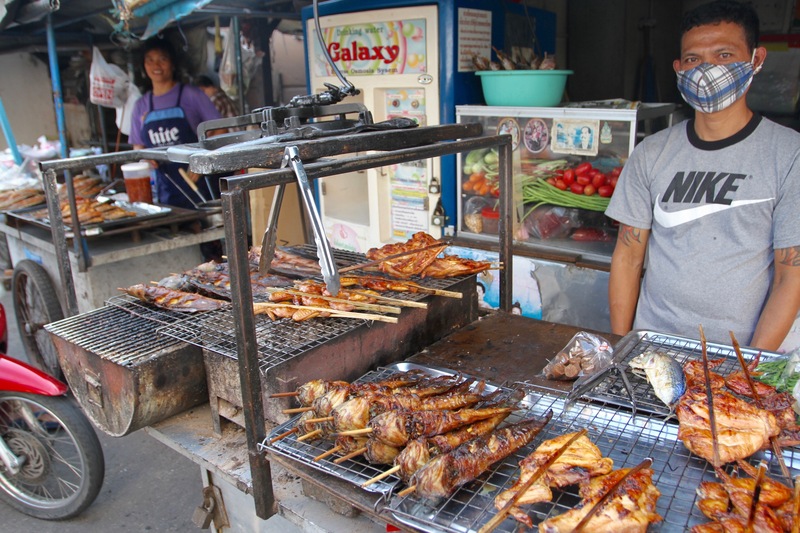 There’s nothing fancy about Thai street food stalls. If there’s anywhere to sit at all, it’s usually just a few plastic chairs and tables. 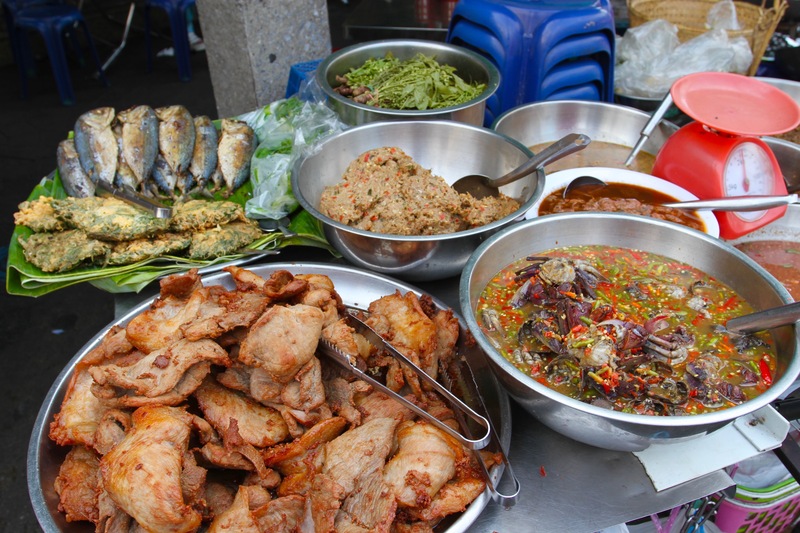 The food choices though can be more varied and bewildering than any restaurant, especially if like me you haven’t done your Thai food homework. 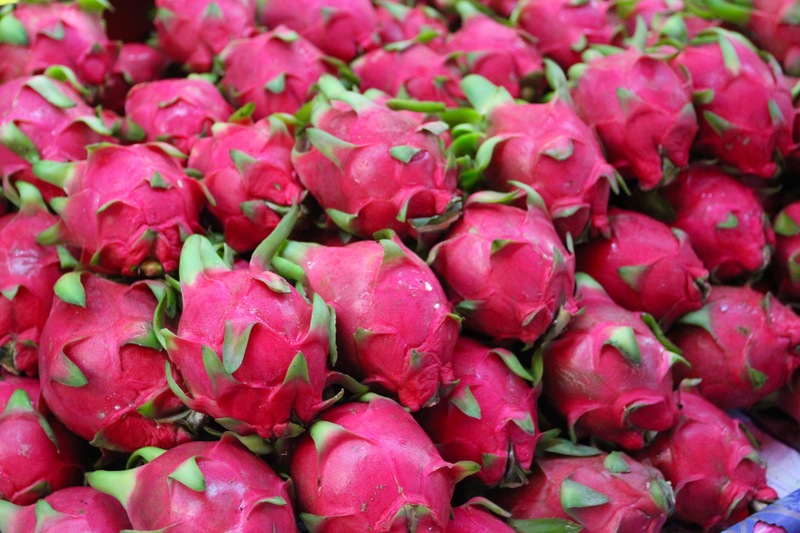 Bright colours abound, and although some of it looks off-putting, and some of it smells off-putting, it’s mostly very tasty…and it’s certainly affordable. I was lucky with my timing in Bangkok. 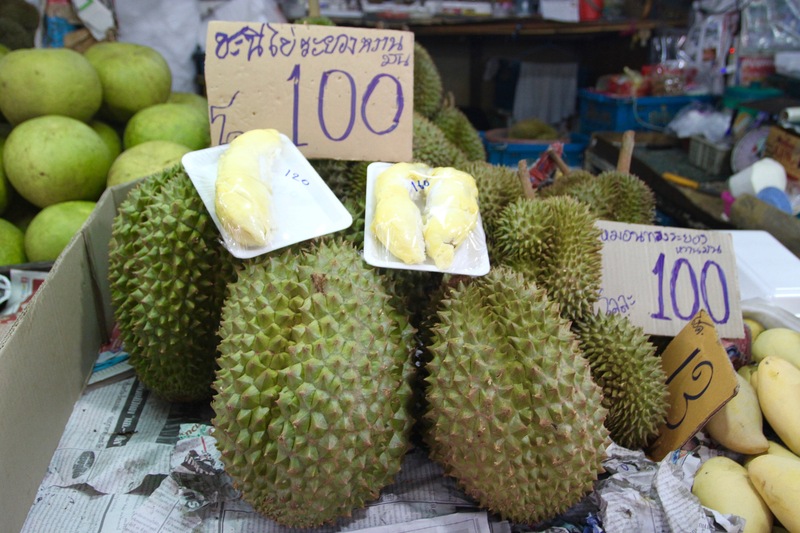 Not only was it durian season, the ‘King of Fruits’ which is also the world’s smelliest, it was mango season. 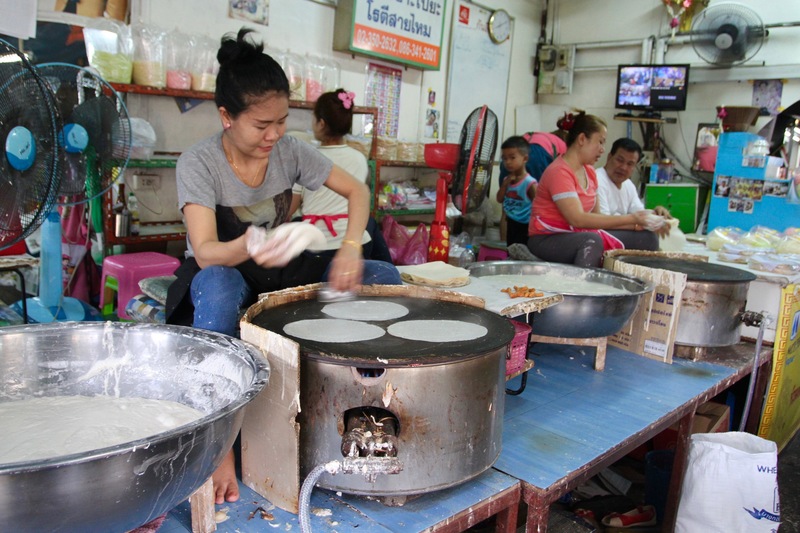 This meant there was mango sticky rice, drizzled with coconut milk, on almost every corner. 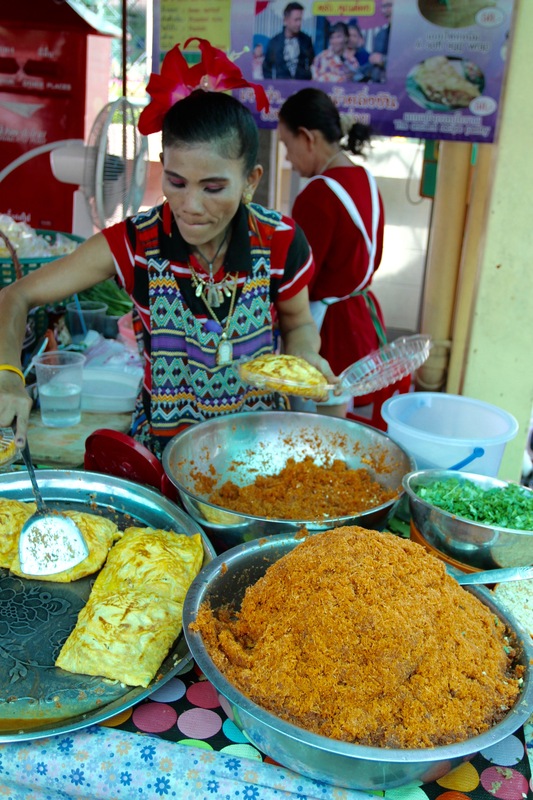 I could (and almost did) eat mango sticky rice until it came out of my ears. 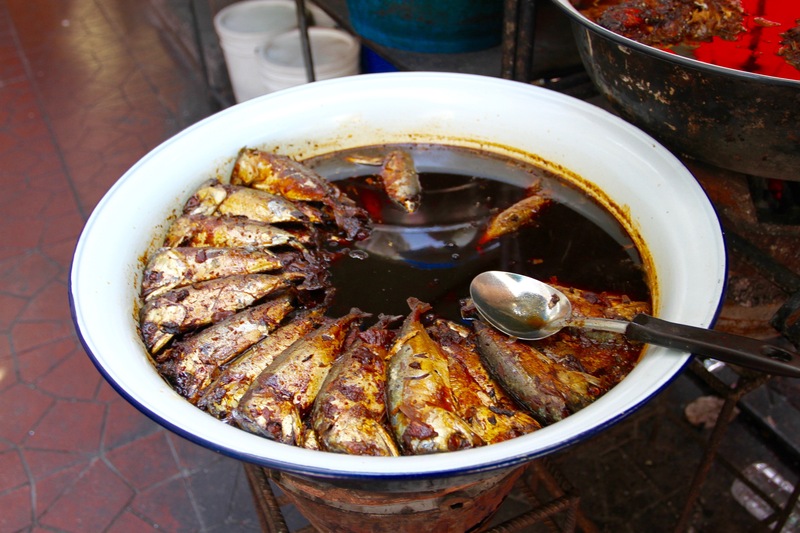 As I wandered the streets I began to wonder whether people ever cooked at home. 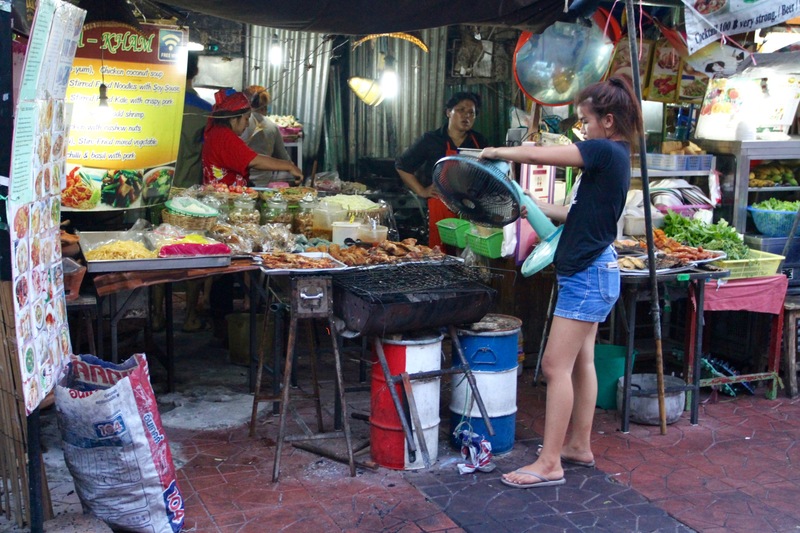 I assume they do since there are plenty of fresh food markets, but talking to a colleague who works in Bangkok it seems that people eat out an awful lot…and if they don’t eat out, they get street food to take away and eat it at home. But really, why not? 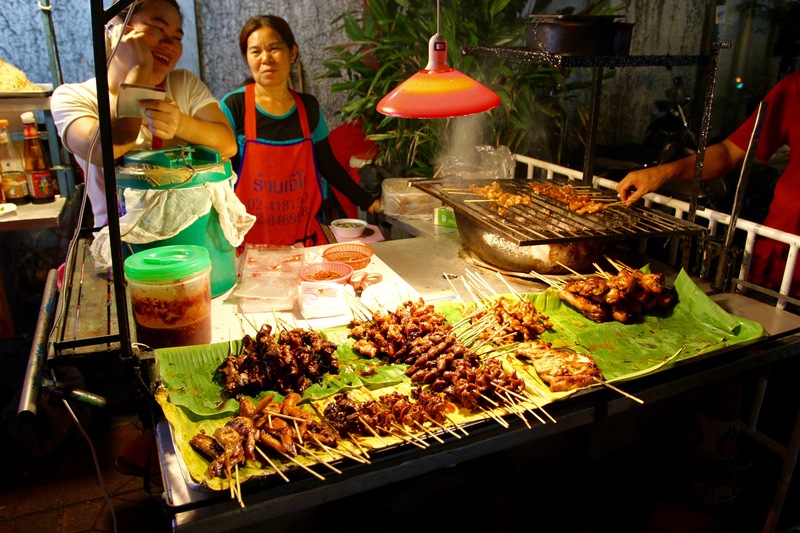 Although I feel a little overwhelmed by Bangkok street food, this is a city that does extraordinary food and has a culinary culture that invites exploration. 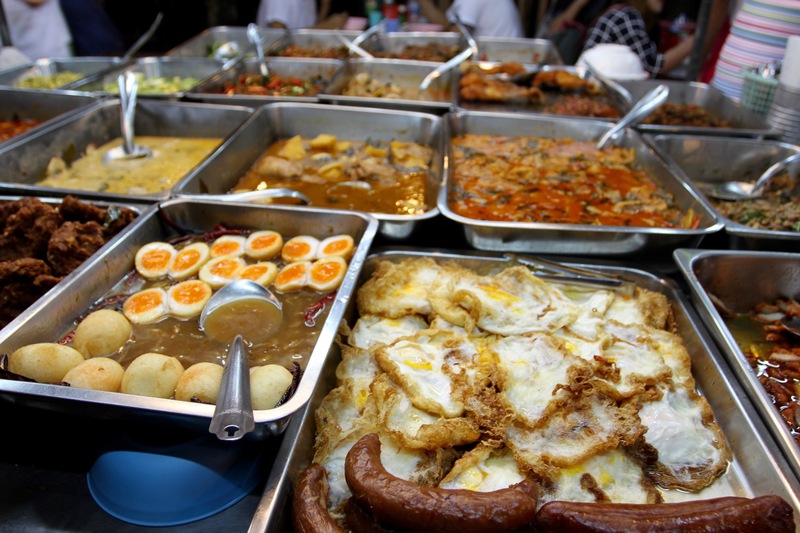 Some Malaysian friends visit Bangkok regularly just for the food…well, the shopping as well, but mainly the food. 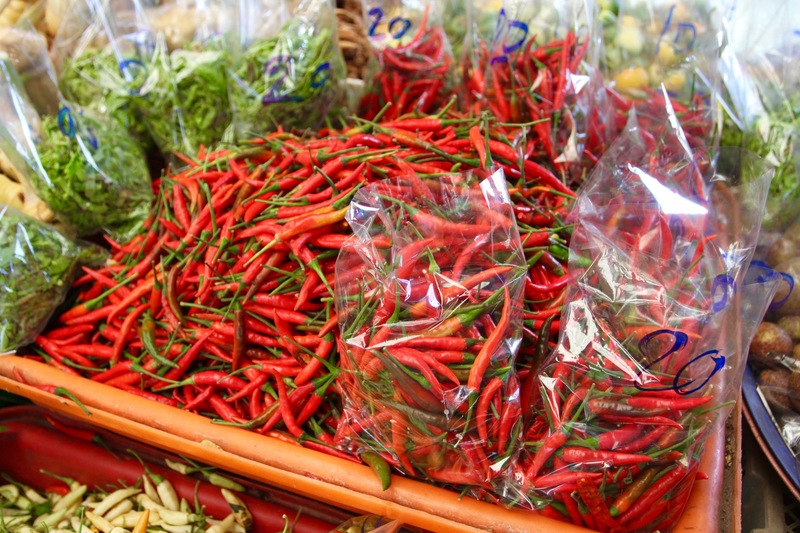 Thai food tends to be quite spicy – allegedly the spiciest food in the world after Mexican food, but this seems to be disputed by India. 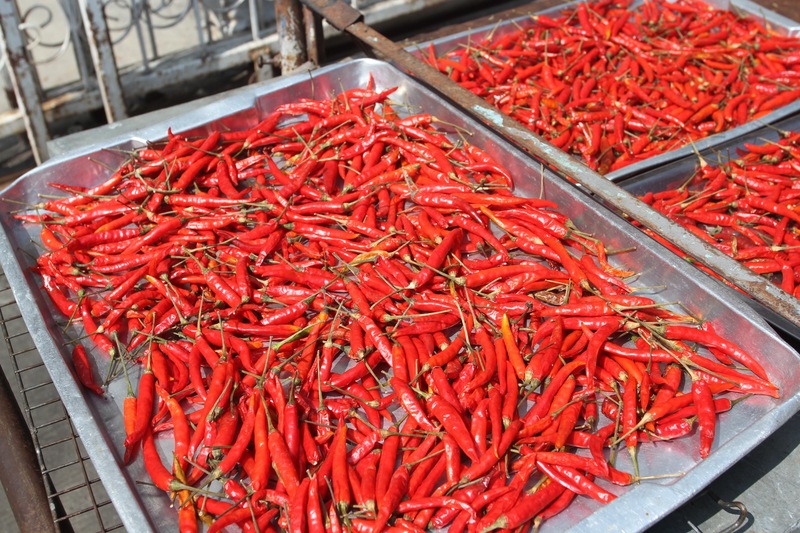 Regardless, for someone whose taste buds have been seasoned by Anglo-Indian food, spicy is good. 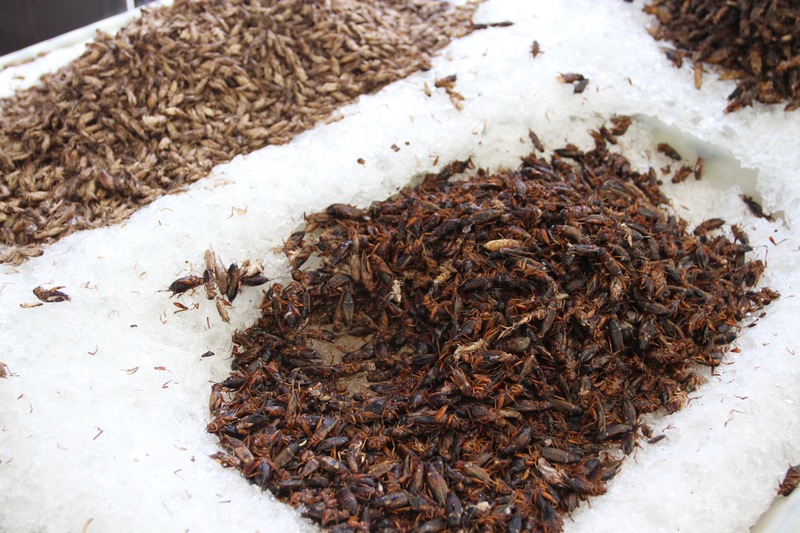 Plus, if you believe the myth, chilly kills all the bugs that might make you sick; if in doubt, squeeze some lime on there as well. 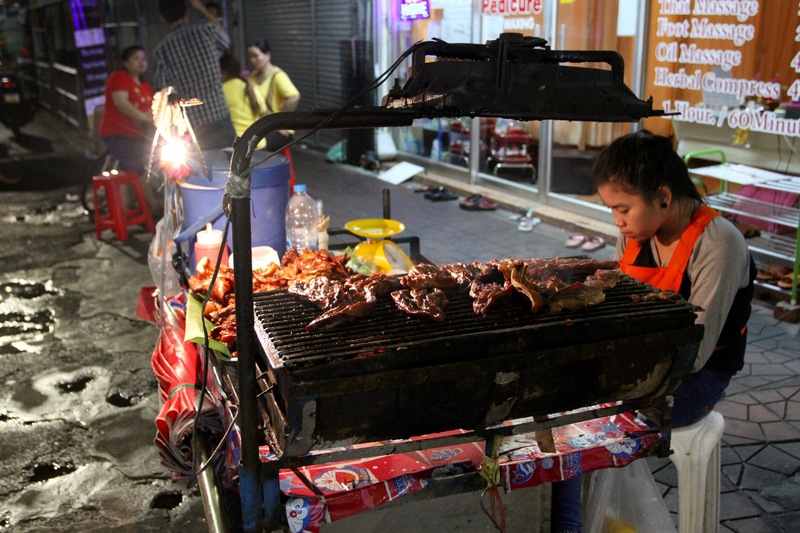 There are thousands of street food stalls in Bangkok, some are definitely more hygienic than others; so it pays to choose a stall that is popular, preferably with Thais, where the food is moving quickly from grill to stomach without spending too much time hanging around in the open air. 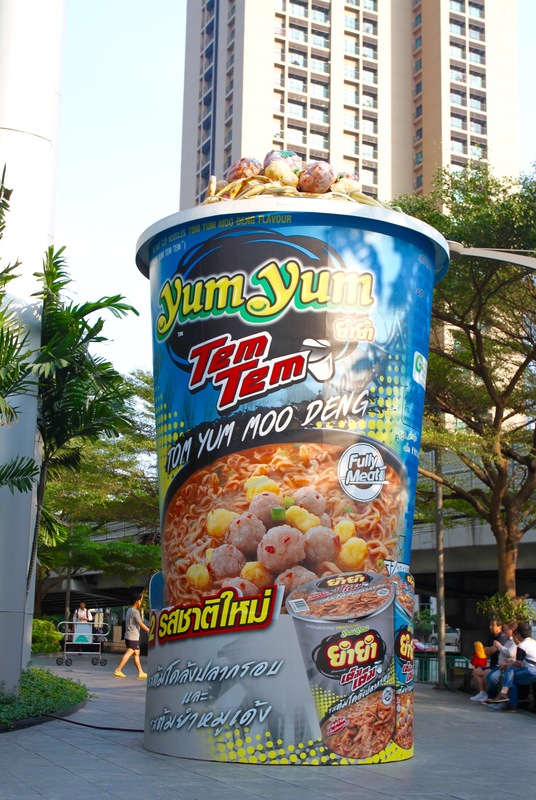 Despite the offerings on the streets, I have to confess to popping into the occasional food court. This felt a bit like cheating, but the food can be good and comes with the added benefit of air conditioning and lower air pollution. When the temperature is hovering around the high 30s, and you’ve just arrived from a northern European winter, this is not something to take lightly. 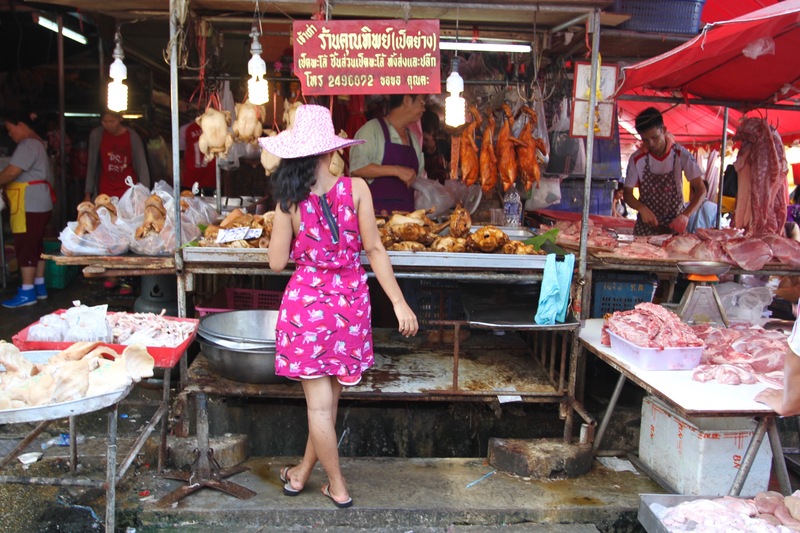 Looking through my guidebook, I spotted a section about the market where much of Bangkok’s street food comes from. 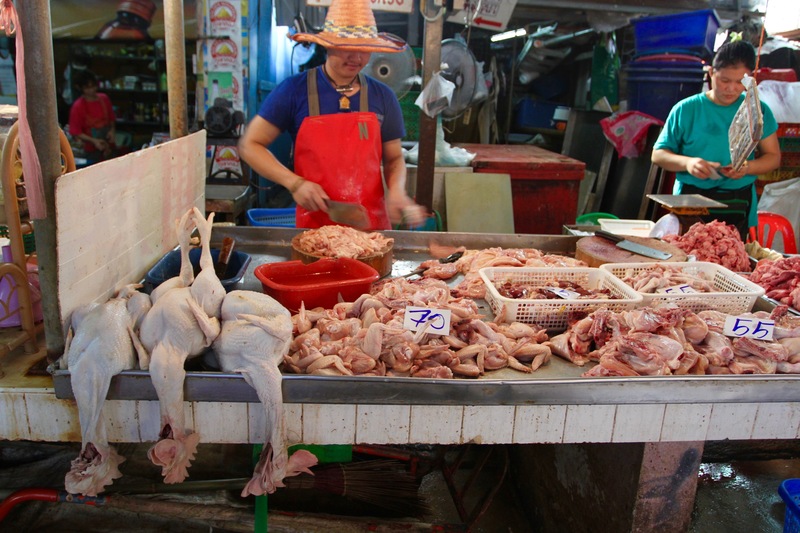 I decided Khlong Toei wet market was a must see; who, after all, doesn’t want to know where their food comes from? 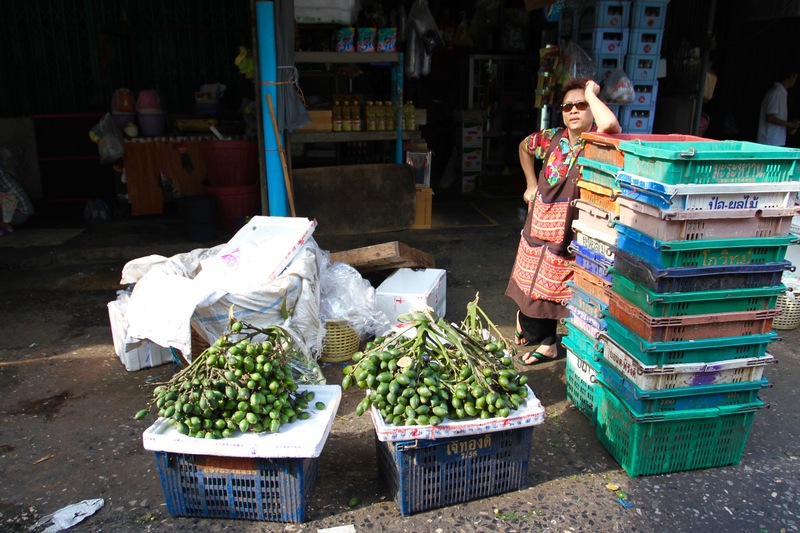 After a visit to Khlong Toei, I can now definitively answer that question…me. There’s something about Bangkok that makes it feel like you’re inhabiting the set of the film Blade Runner. True, it doesn’t rain as much, but there are vast electronic billboards dotted around the city; TV screens on the subway and ATMs blast out endless exhortations to buy the latest fashions; and, almost everywhere you look, there are vast gleaming towers of glass where the wealthy escape the grime at street level. 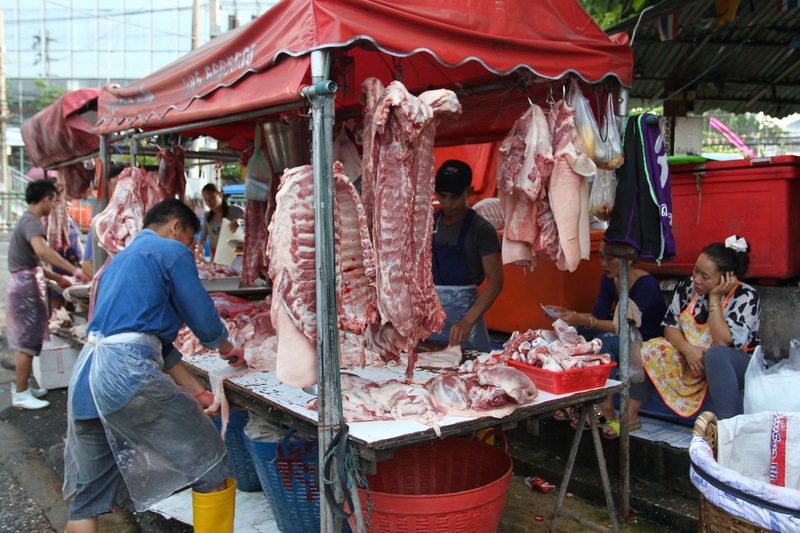 Life is lived openly on the streets, and you don’t have to go far to find stalls selling food, some of which looks unearthly, and just about every other commodity on the planet. 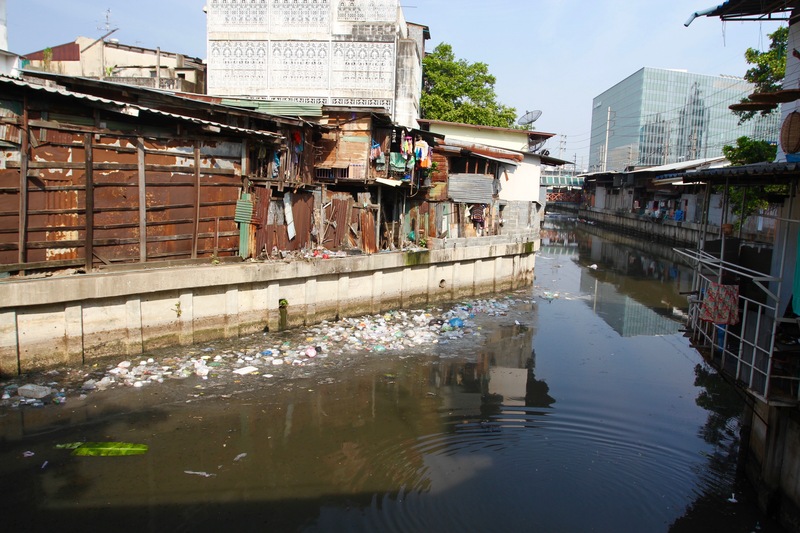 Underneath flyovers carrying enormous numbers of cars, poverty-filled shanties sit on stilts over stagnant, polluted waters. 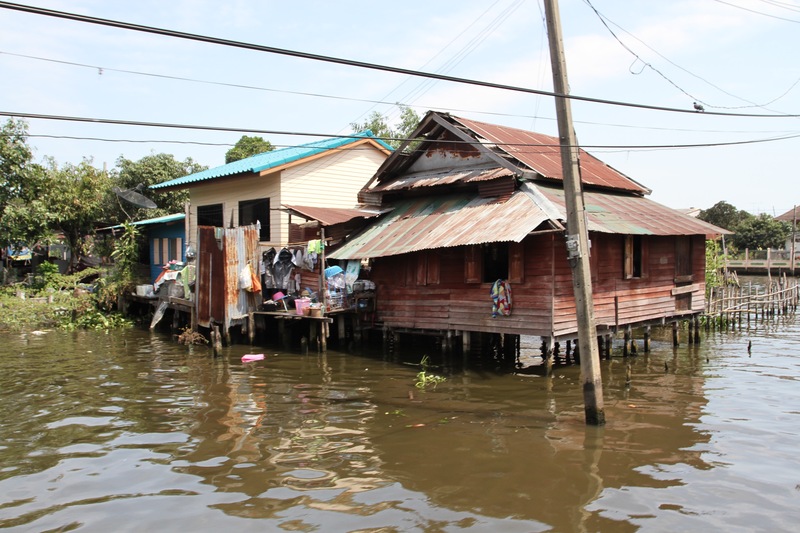 The air quality for Bangkok’s dispossessed must be some of the worst anywhere in the world. 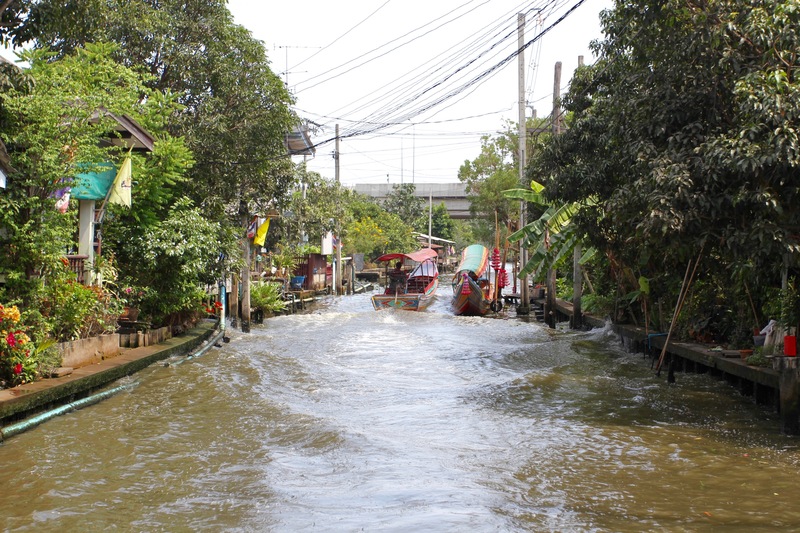 That might make Bangkok sound like somewhere to avoid, it’s not supposed to. It’s a unique and fascinating city, part sci-fi, part reality, and fully mesmeric fun. 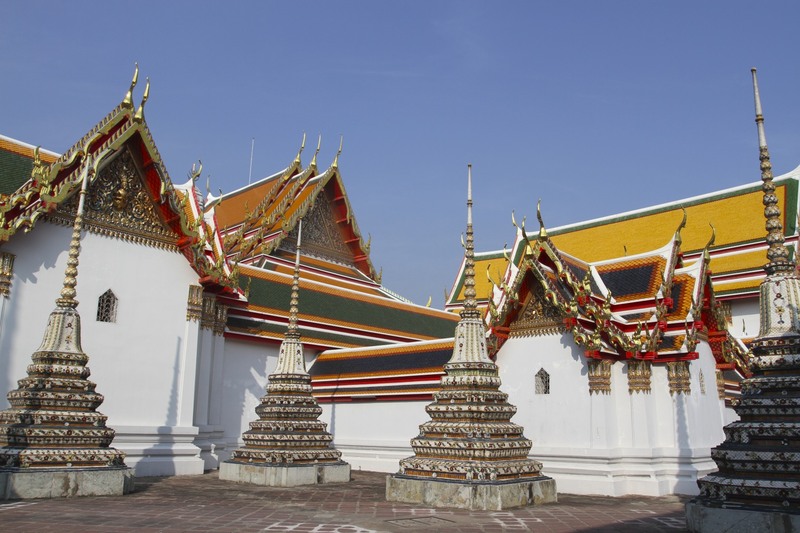 Bangkok is now the most visited city on the planet, with nearly 30 million visitors in 2015. This is despite catastrophic floods, political unrest, riots and a military coup, followed by yet more political unrest and the imposition of martial law, in the last five years alone. 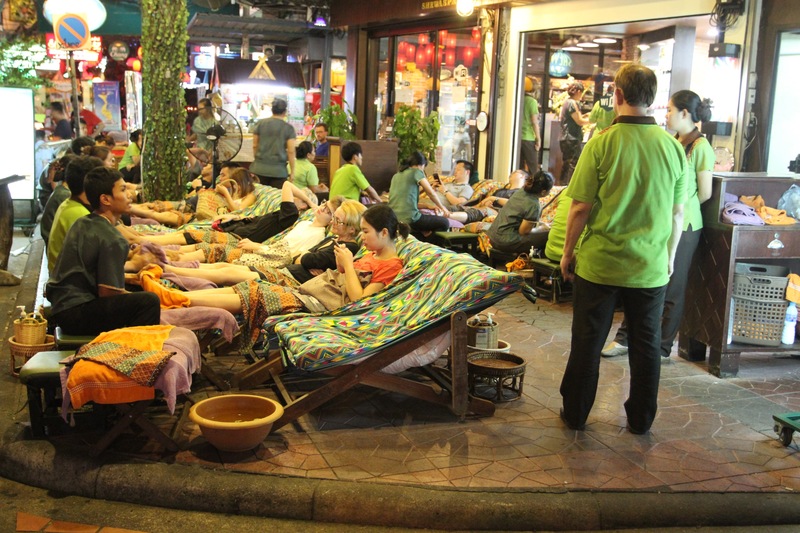 Bangkok is not short on the sort of dramas that normally send tourists running for alternative destinations. 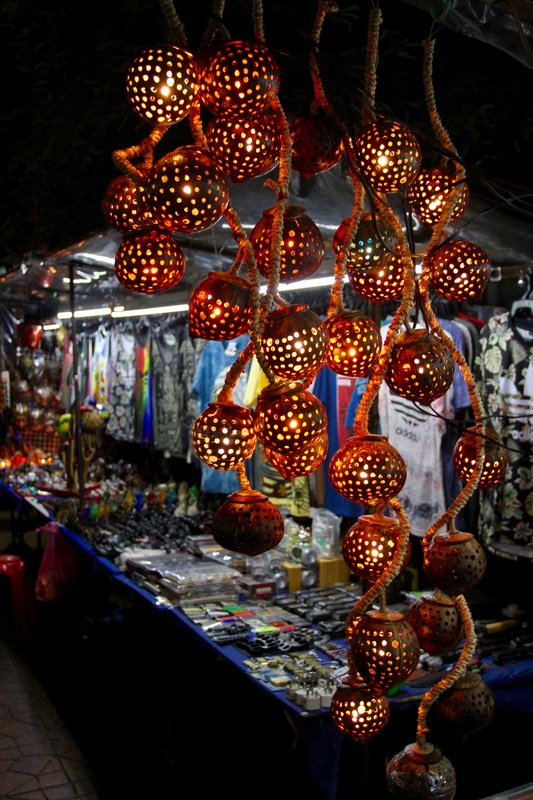 Instead, visitor numbers seem to climb ever higher, fuelled in large part by tourism from other parts of Southeast Asia, and especially China. 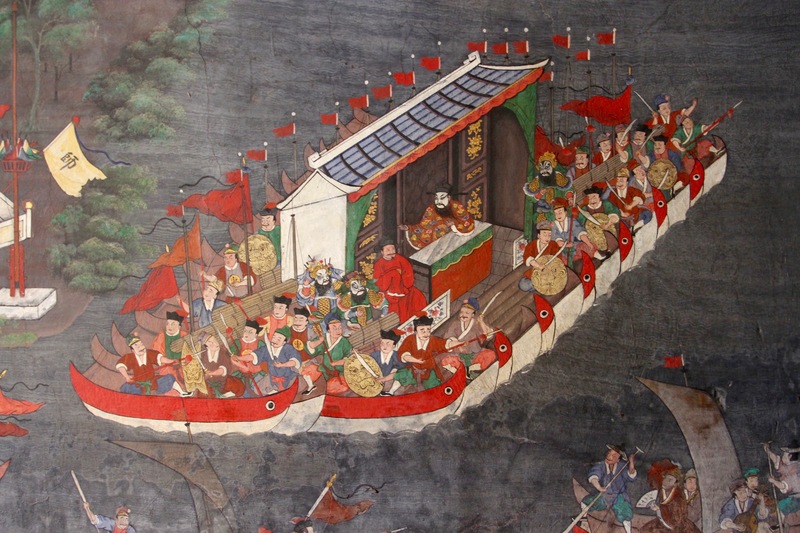 Spend any time at the Tha Chang river taxi terminal and you’ll witness wave after wave of tour groups sweeping past, which makes getting the taxi boat a real challenge. In this sprawling, dirty, cultured, exciting and energetic city, it is the very fact of all this life that makes it so alluring. I was delighted to be able to tag on a weekend following a week working in and around the city. 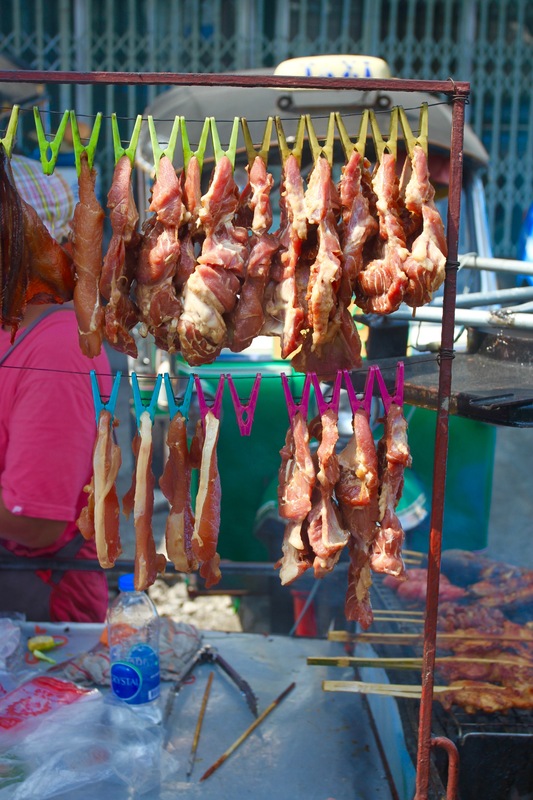 My recent visit in 2014 had only whetted my appetite to see and experience more of Bangkok’s crazy charms, and to eat more of its delicious food. 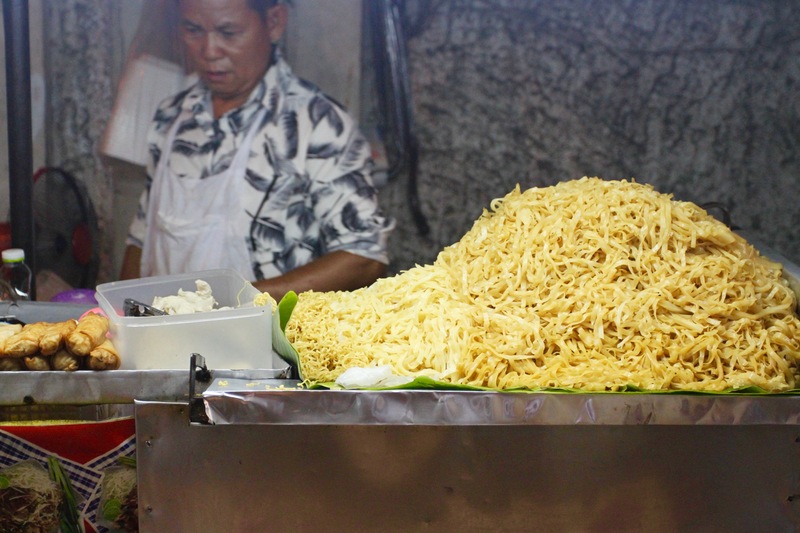 Is there anywhere else on earth with such an abundance of street food? 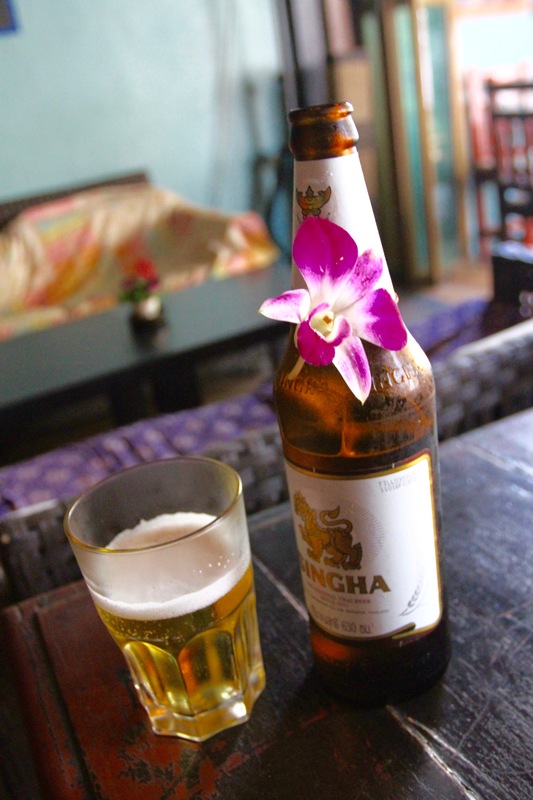 I split my stay between the Phaya Thai and Khaosan areas, but spent most of my time just wandering around. 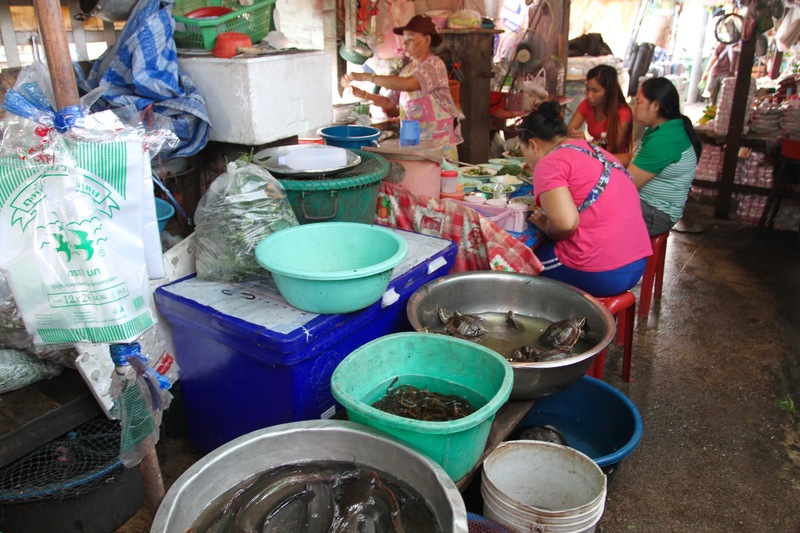 I made the stomach churning trip to Bangkok’s largest wet market, Khlong Toei. 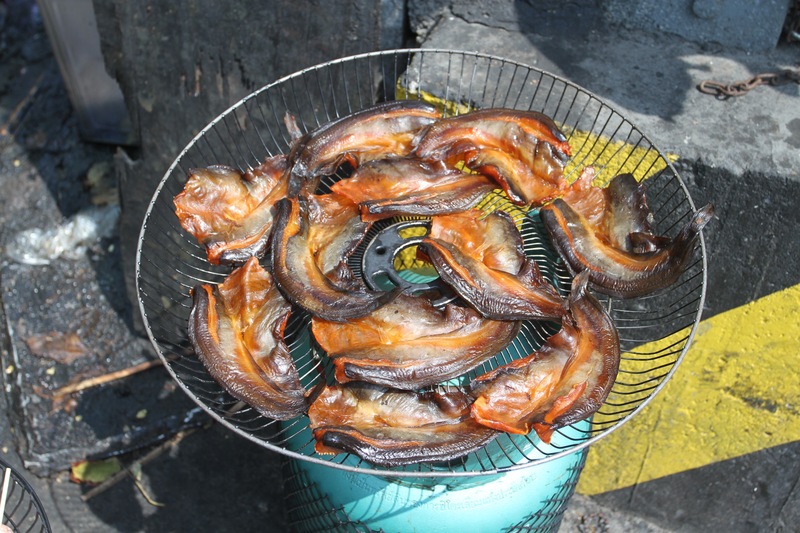 This is where a lot of the fresh food served in restaurants, hotels and street stalls originates. 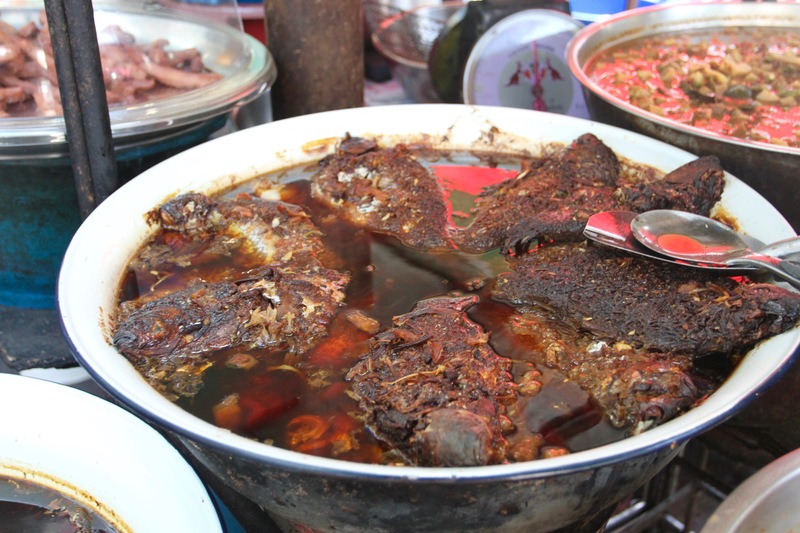 It’s an experience not to be missed, although it requires a strong olfactory tolerance and may make you think twice about lunch. 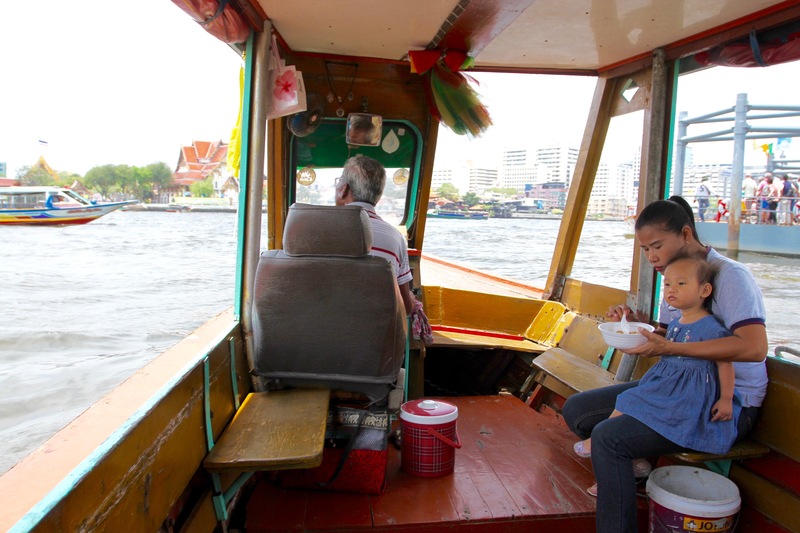 I took a boat across the Chao Phraya River to explore the canals of the western part of Bangkok. I got lucky and had a boat all to myself, with just the captain, his wife and young child for company. 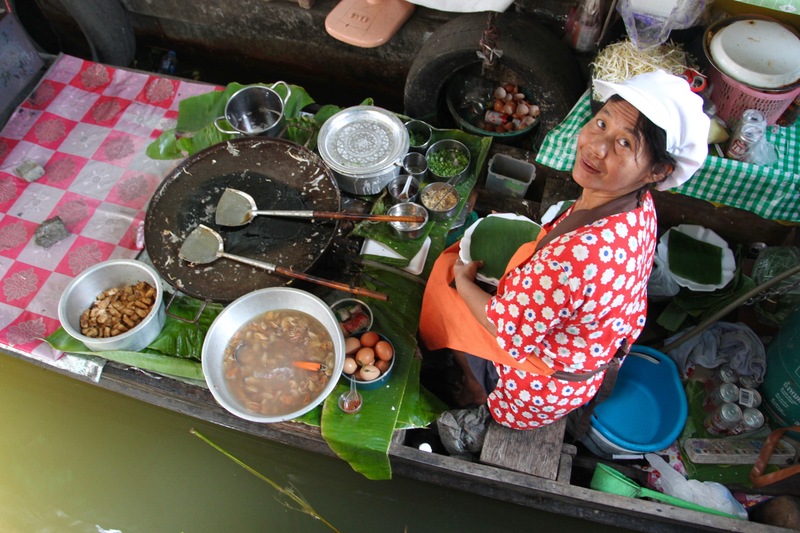 We shared no language but had a great time zipping along the canals and visiting a floating food market. 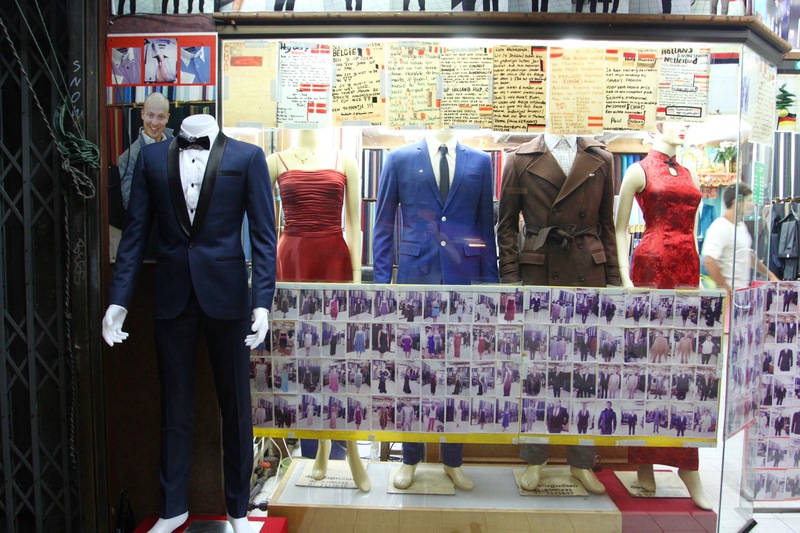 It was pretty touristy, but with 30 million visitors each year, what can you expect. In between times there were temples and restaurants to visit, and the atmosphere of the streets to absorb. 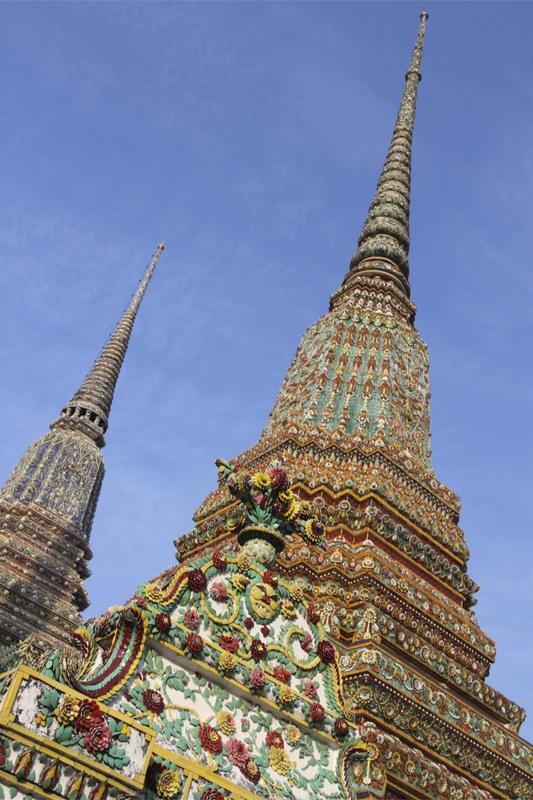 Despite the traffic, the air pollution, the heat and humidity, it’s hard not to love Bangkok. 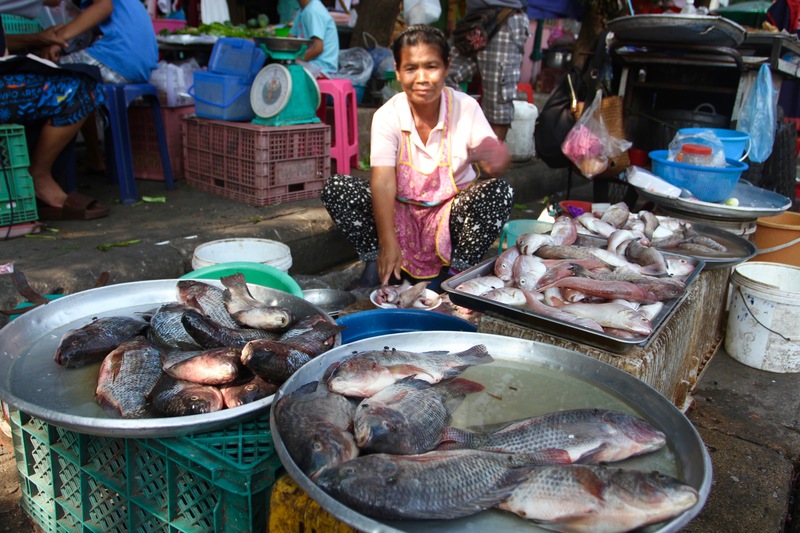 To paraphrase Samuel Johnson, “when a man is tired of Bangkok, he is tired of life; for there is here all that life can afford”. 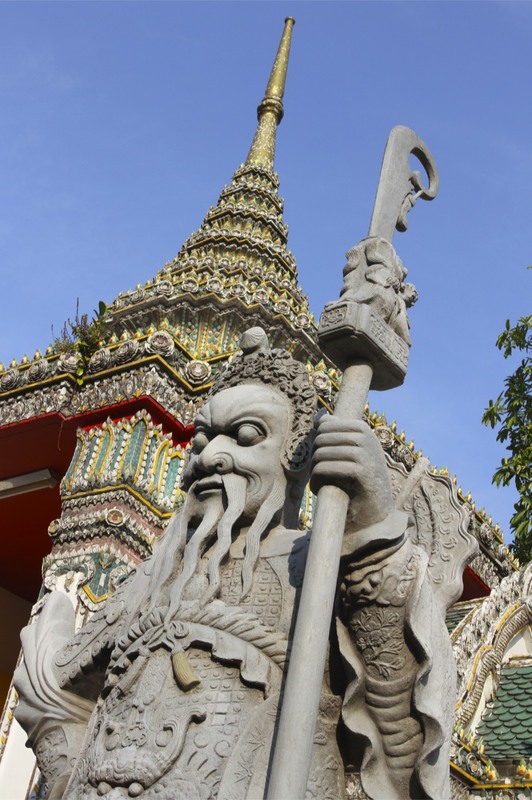 Although to be honest, Bangkok has a knack of making you tired to the point of exhaustion. 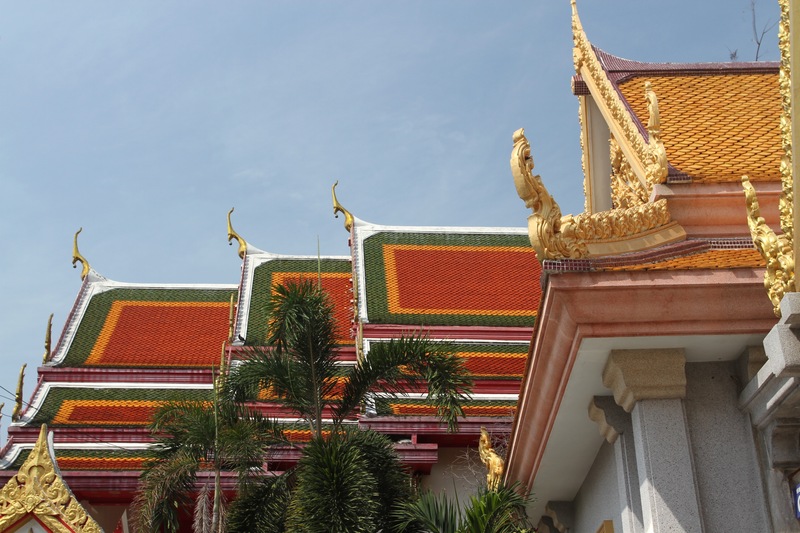 Emerging from the interior of the building where Wat Pho’s glorious Reclining Buddha resides, I was confronted by a long line of people waiting to get in. 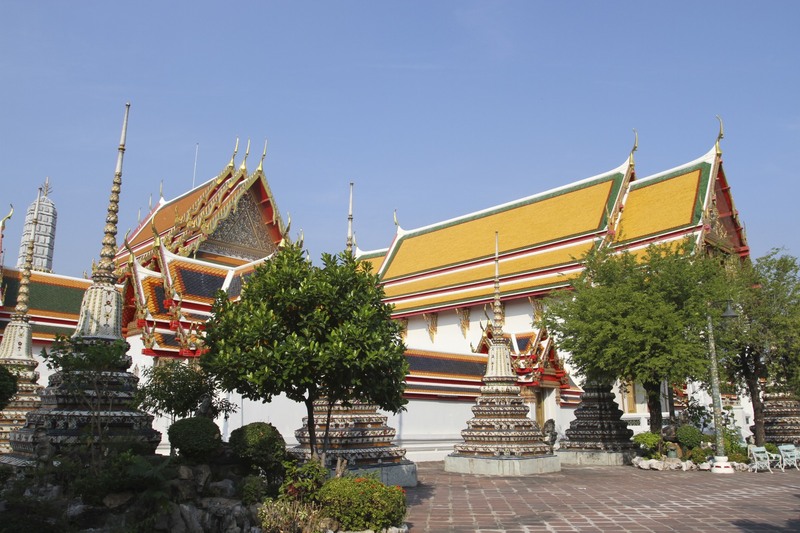 One of the criticisms of Bangkok’s main tourist sites is how crowded they become, although Wat Pho doesn’t receive as many visitors as the Royal Palace just up the road. The Reclining Buddha building hadn’t been open long, and early morning may seem like rush hour, but things really hot up later in the day as more and more people arrive. Not so the rest of this large and intriguing temple complex. 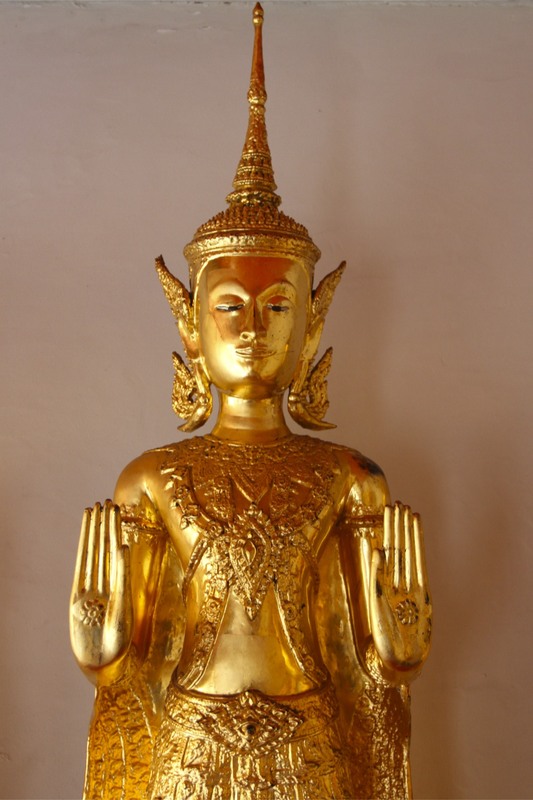 Away from the Reclining Buddha it felt quite low key, there were plenty of people wandering around but I often found myself alone – well as alone as anyone can be in a place with so many Buddha status staring at you from every direction. It is a fascinating place to explore, although even at a very sedate pace the heat and humidity were crushing the life out of me as I walked around. 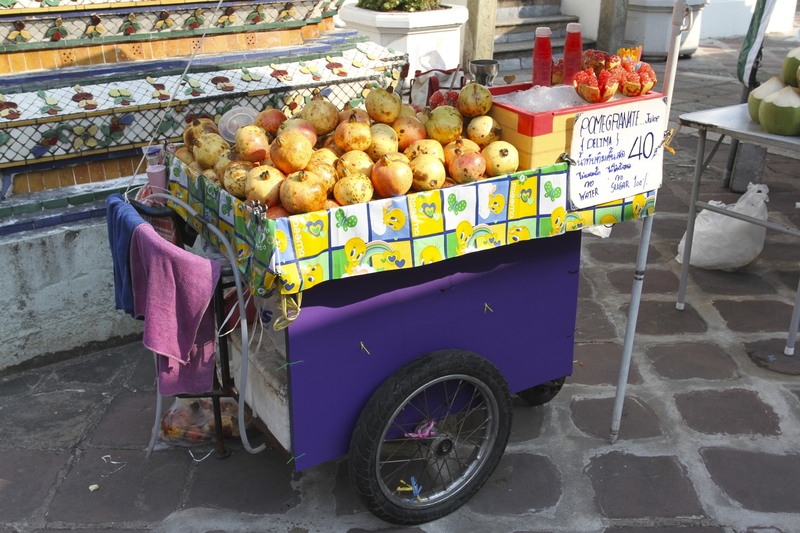 Luckily the authorities have the foresight to give out a bottle of water to everyone, and there are juice carts dotted around offering only slightly overpriced juices. 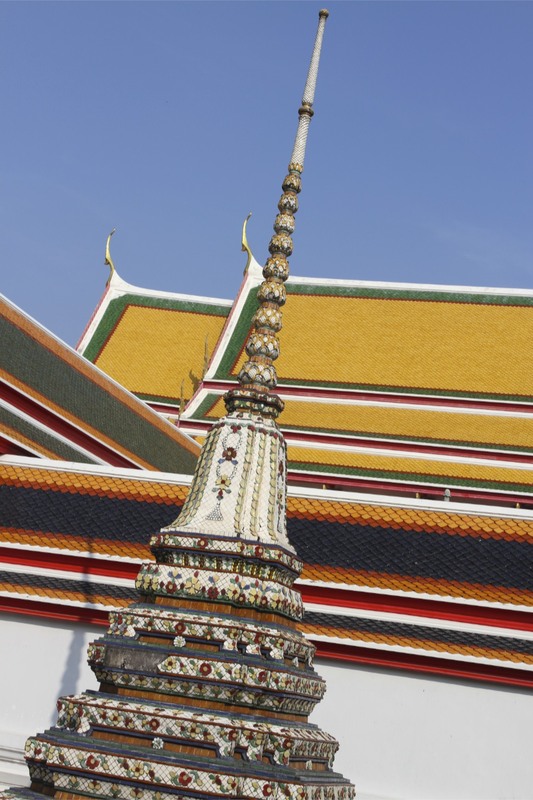 A downside of visiting Wat Pho and Royal Palace area, is that the mass of tourists attracts a host of scammers and extremely persistent touts. Inside the temple complex it’s fine, only the heat and the other tourists make life uncomfortable; outside it can be a different story and I heard a number of tales of people getting hassled or scammed. This ranges from the irritating (actually infuriating) tuk-tuk drivers who refuse to take you because you won’t pay massively over the odds for a fare, or agree to stop at a ‘friends’ shop en route; to the out-and-out rip off where scammers will intercept you and tell you that the temple is closed and wouldn’t you prefer to see some semi-precious gems instead? Others will direct you to ‘ticket booths’ that aren’t legitimate, or try to get you on a private boat tour instead of a cheap ferry. Nothing sinister perhaps, but to the unwary it can be costly and under a hot sun the street hassle can be exhausting. 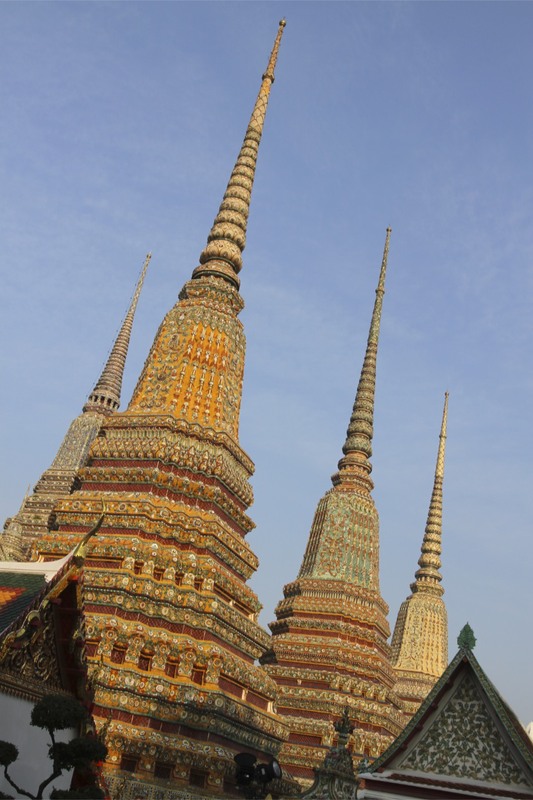 I spent most of the morning wandering Wat Pho. It is endlessly fascinating but the heat had gotten the better of me. 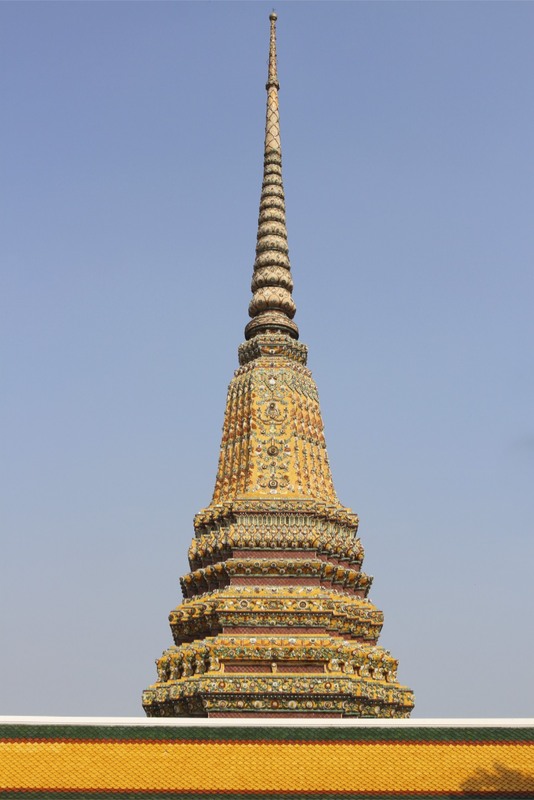 Leaving the golden glories of Wat Pho behind, I spent a fruitless 20 minutes trying to get a tuk-tuk driver to accept a reasonable fare. There are so many tourists the odds are that someone else will come along and pay the inflated price they are demanding. Negotiating is a one-sided affair in this area. 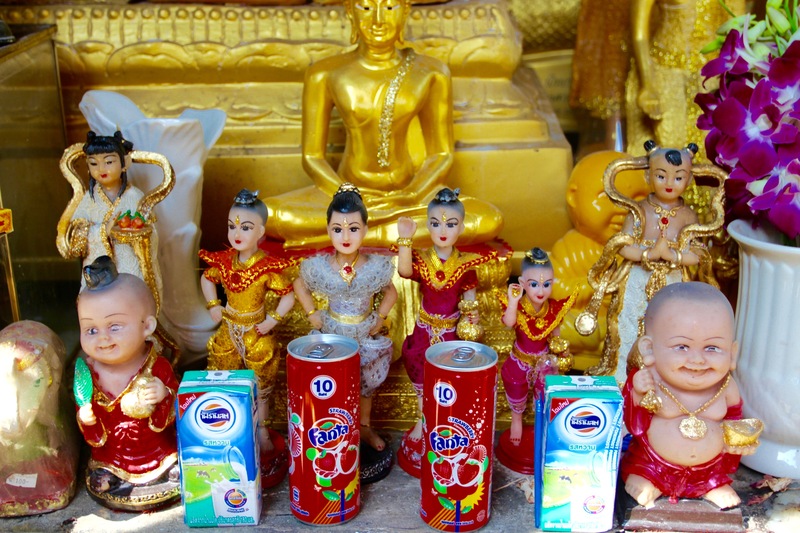 I ended up walking several blocks before finding a tuk-tuk to take me back to the hotel and a cooling shower for only twice the typical price.